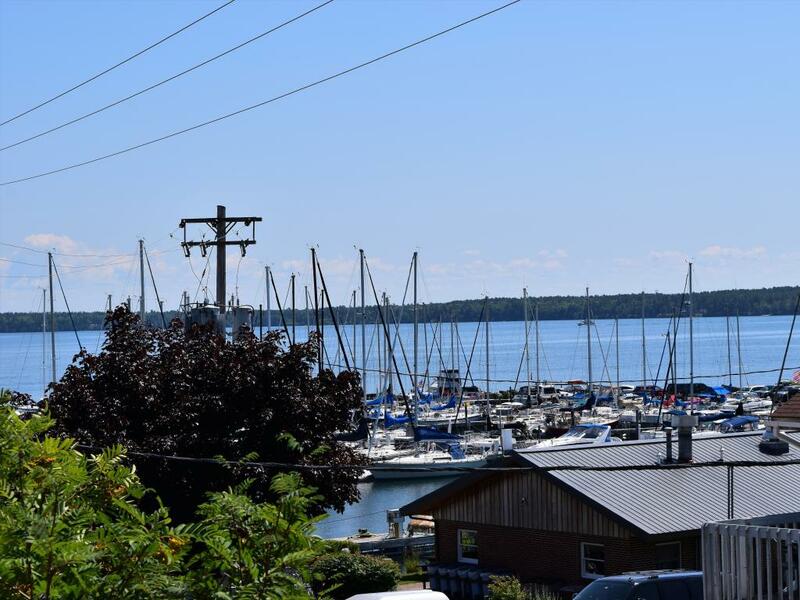 Ada O'Day Condos are located just 2 blocks from The Bayfield Inn, 2 blocks from Lake Superior and the Madeline Island Ferry Line, and 1 block from all downtown Bayfield. 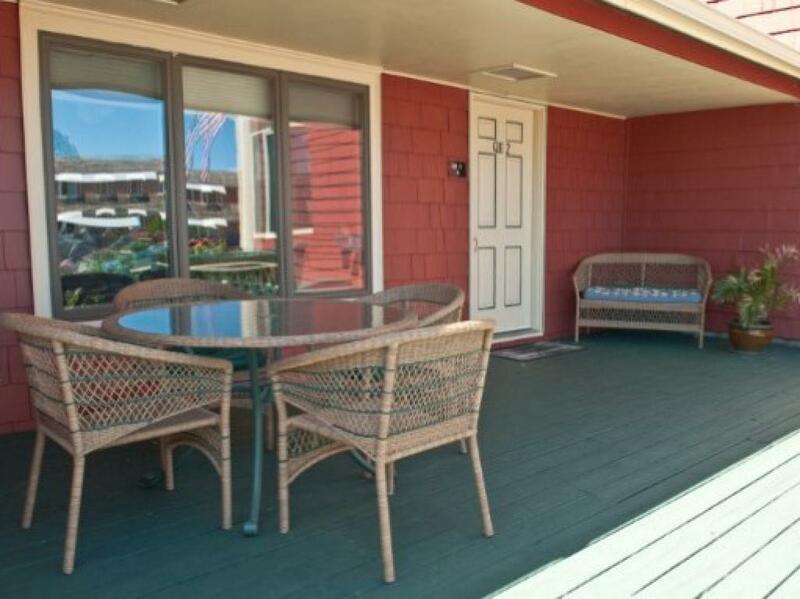 Ada O'Day 1 is a ground level condo with attached patio that requires no stairs from the private parking lot. 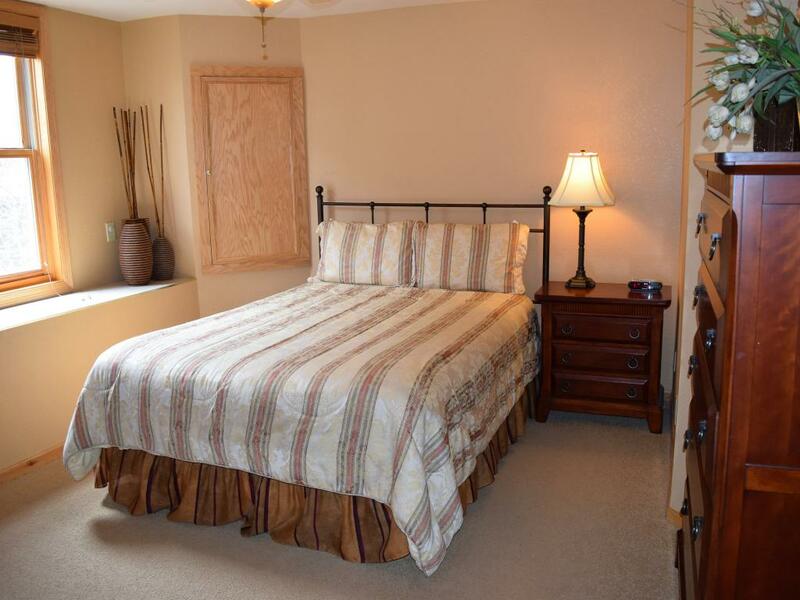 This unit offers 2 bedrooms each with a queen bed. 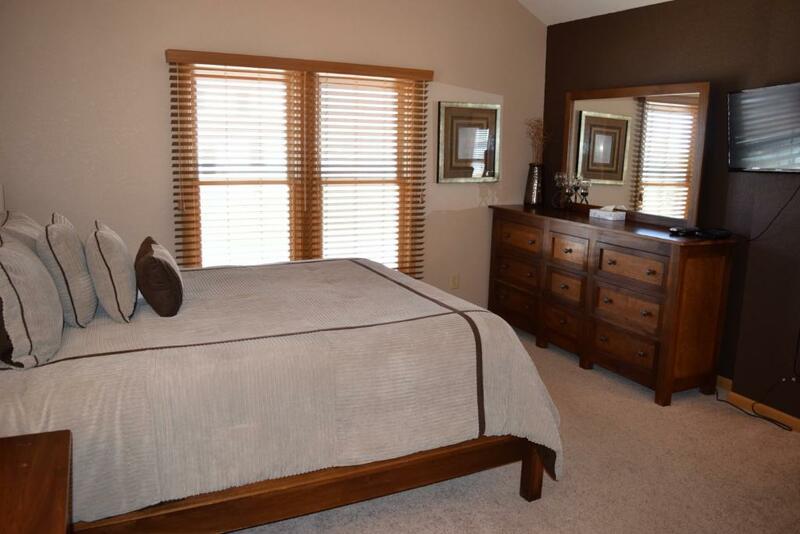 Master bedroom has its own attached 3/4 bathroom, 2nd full bathroom located off of the guest room with jetted tub. 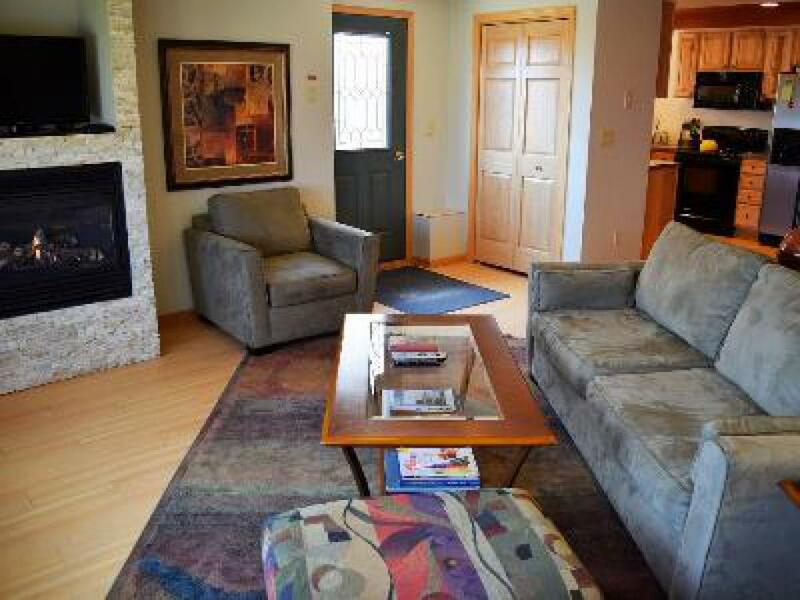 There is a third room converted into a private den with a full sofa/sleeper & TV. 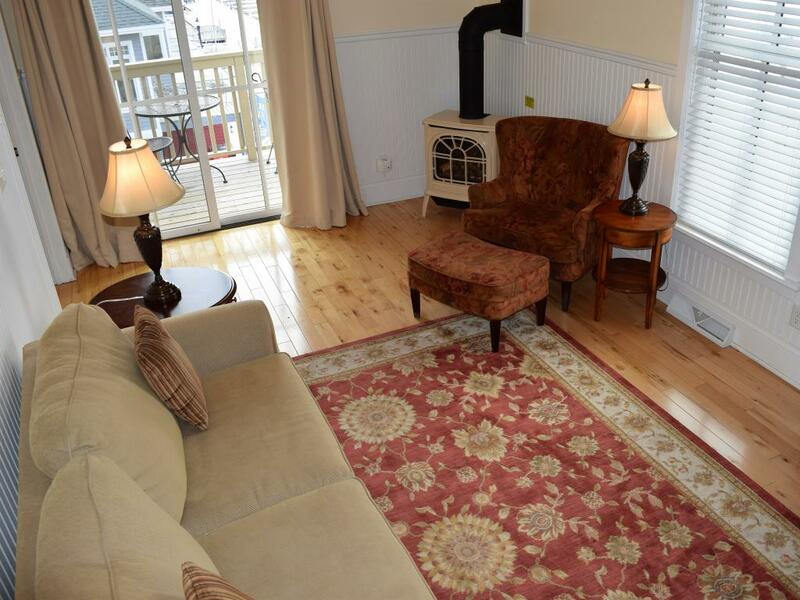 Ada O'Day 1 has new furnishings and is very modern. 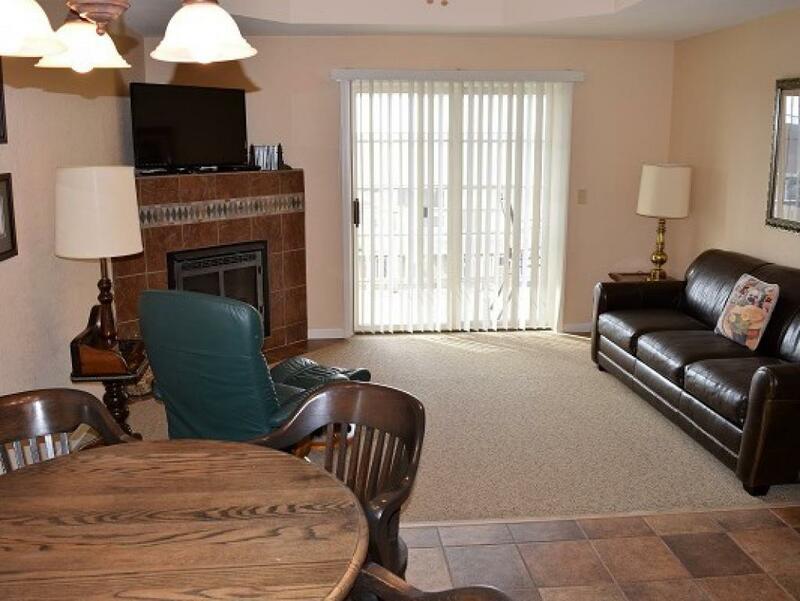 This unit also offers a fully equipped kitchen and a gas fireplace in living room. 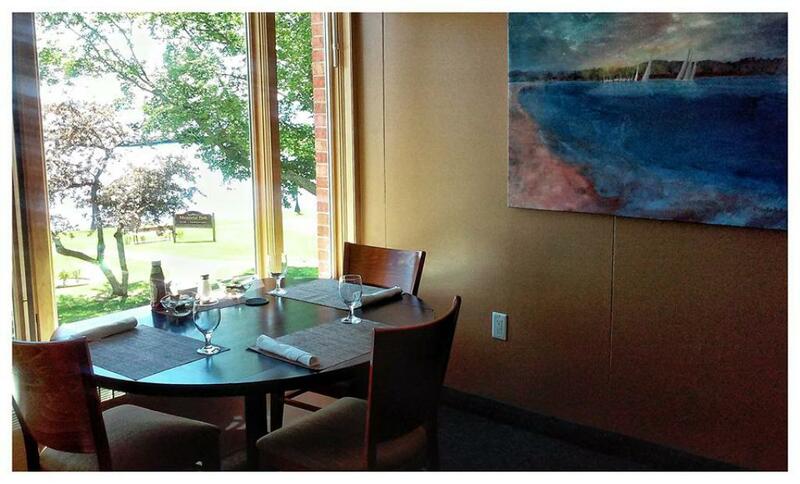 There is no true lakeview (just small peeks of the lake from the walk-out patio). Private parking for 1 vehicle. No smoking, no pets. Occupancy rate based on 4 people ($20/night per additional guest). Maximum 6 adults, children under 5 stay free! Complimentary WIFI and cable included! 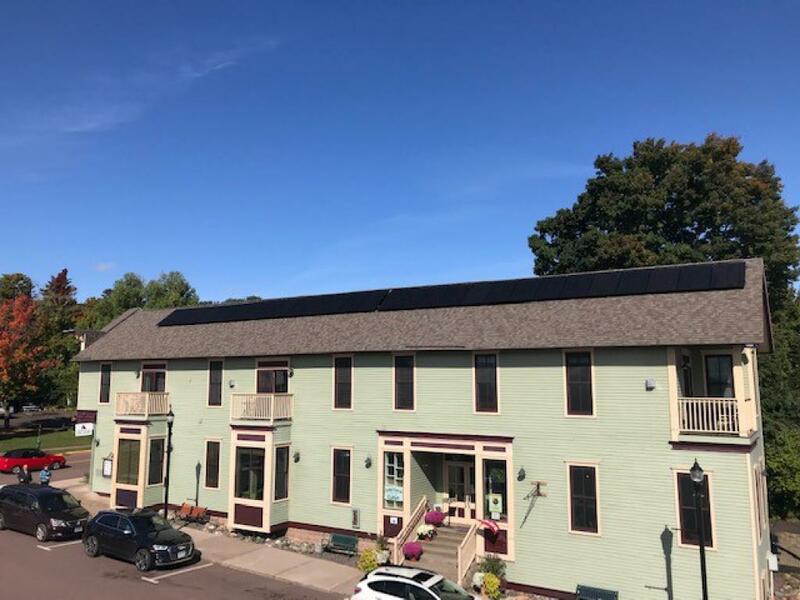 Ada O'Day Condos are located just 2 blocks from The Bayfield Inn, 2 blocks from Lake Superior and the Madeline Island Ferry Line, and 1 block from all downtown Bayfield. Ada O'Day 2 is located on the second floor. Stairs are required (fewer stairs from street entrance). 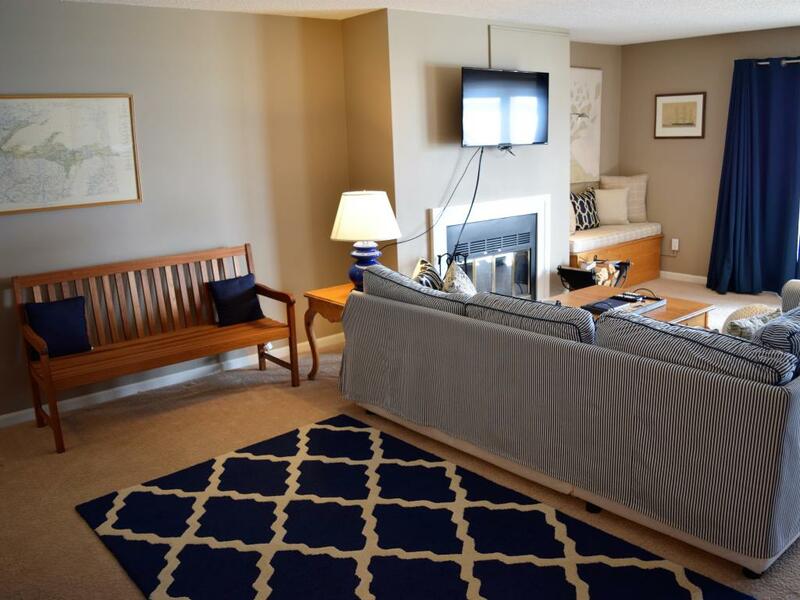 This beautiful condo offers 3 bedrooms each with 1 queen bed and 2 bathrooms (3/4 bathroom attached to the master bedroom, plus 1 full bathroom with jetted tub off of the other guest rooms). 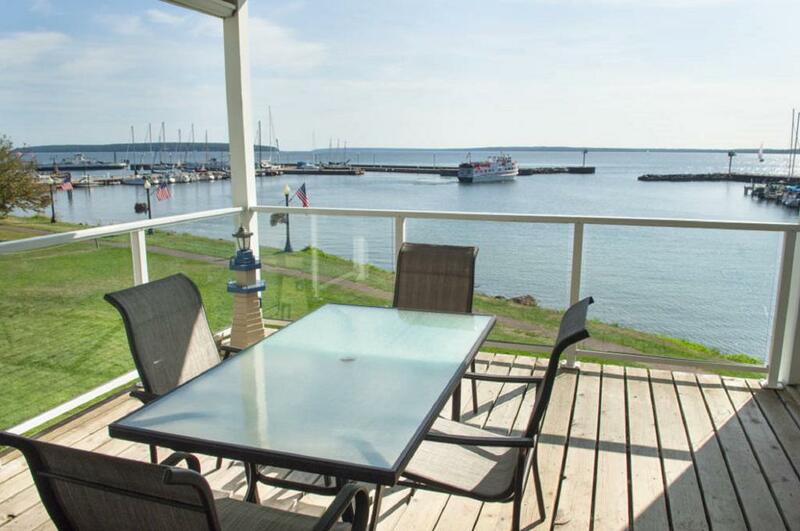 Ada O'Day 2 has a private wrap-around balcony with Lake Superior views, a fully equipped kitchen, and gas fireplace in living room. This unit has new furnishings and is very modern. Private parking for 1 vehicle. No smoking, no pets. Occupancy rate based on 6 people. Maximum 6 adults, children under 5 stay free! 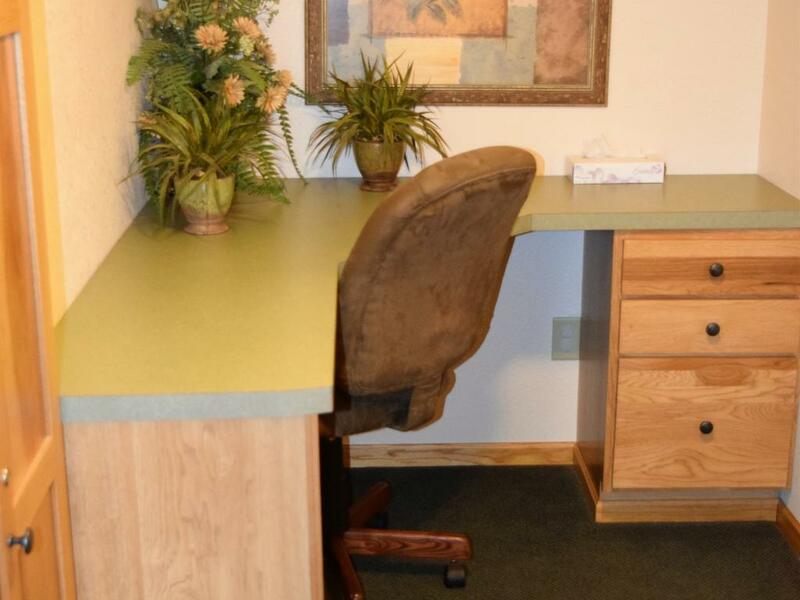 Complimentary WIFI and cable included! Ada O'Day Condos are located just 2 blocks from The Bayfield Inn, 2 blocks from Lake Superior and the Madeline Island Ferry Line, and 1 block from all downtown Bayfield. Ada O'Day 3 is on the third floor and requires stairs (fewer stairs from street entrance). 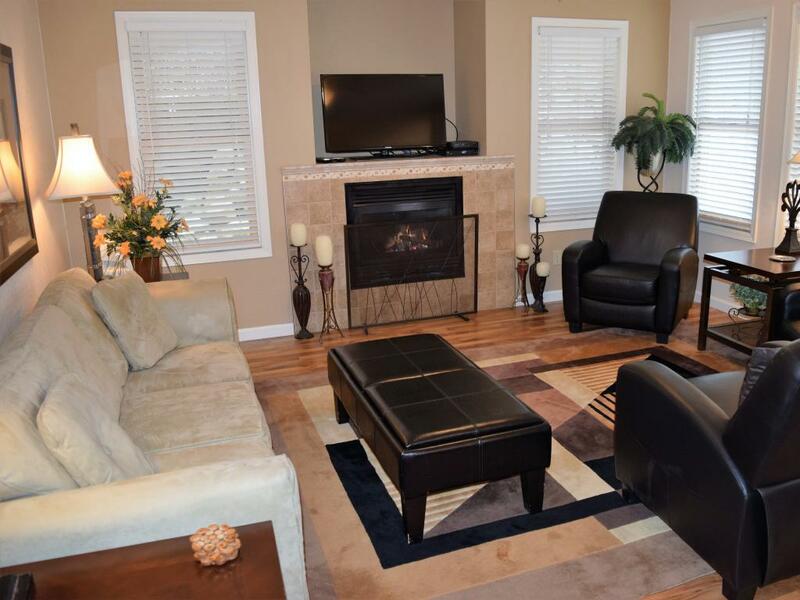 This beautiful condo has 3 bedrooms each with 1 queen bed. 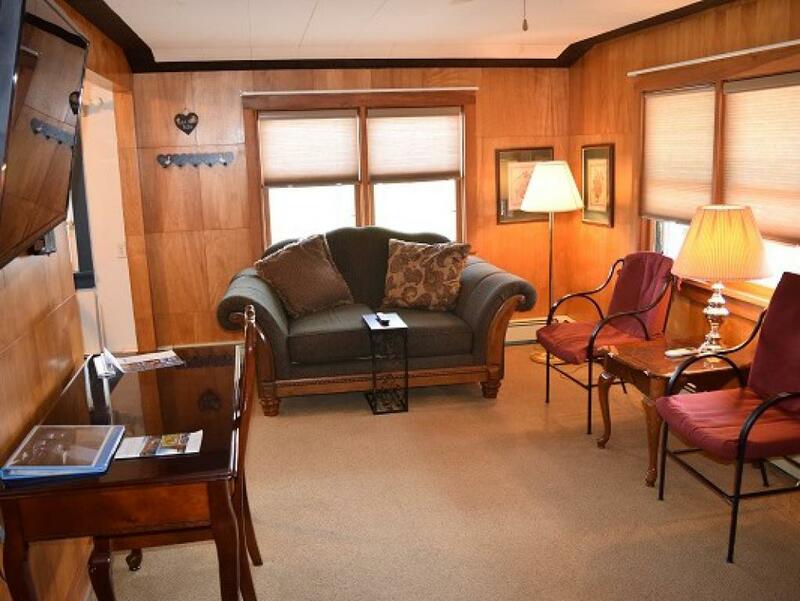 There is also a full-size sleeper sofa in the living room. 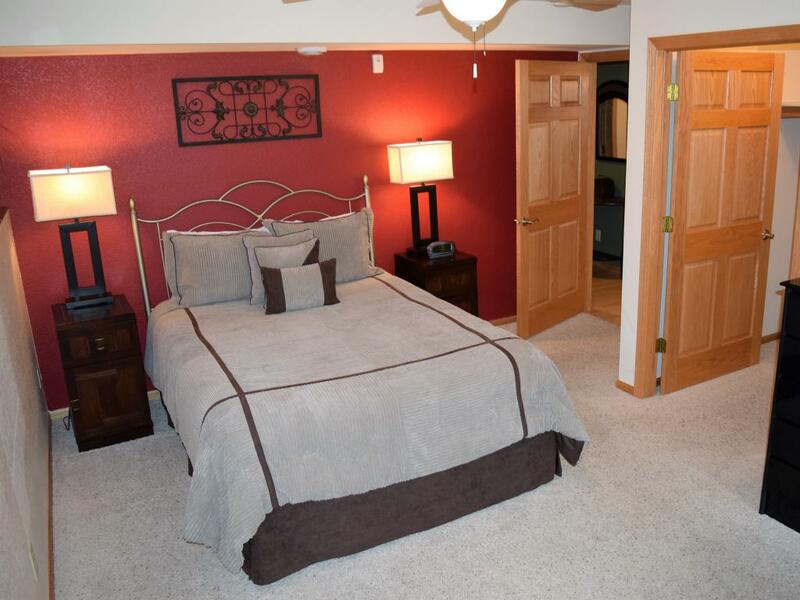 There are 2 bathrooms (3/4 bathroom attached to the master bedroom, plus 1 full bathroom with jetted tub near the other guest rooms). 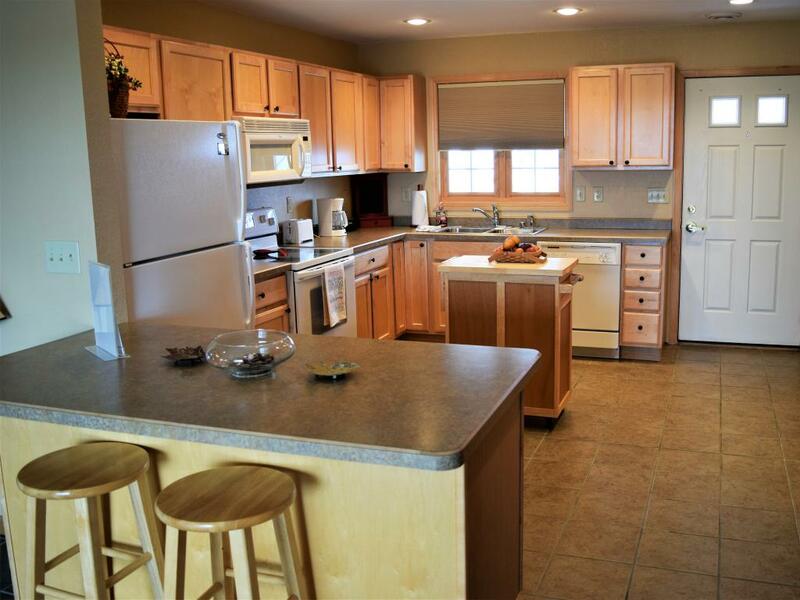 Ada O'Day 3 also offers a fully equipped kitchen, a gas fireplace, new furnishings & is very modern. 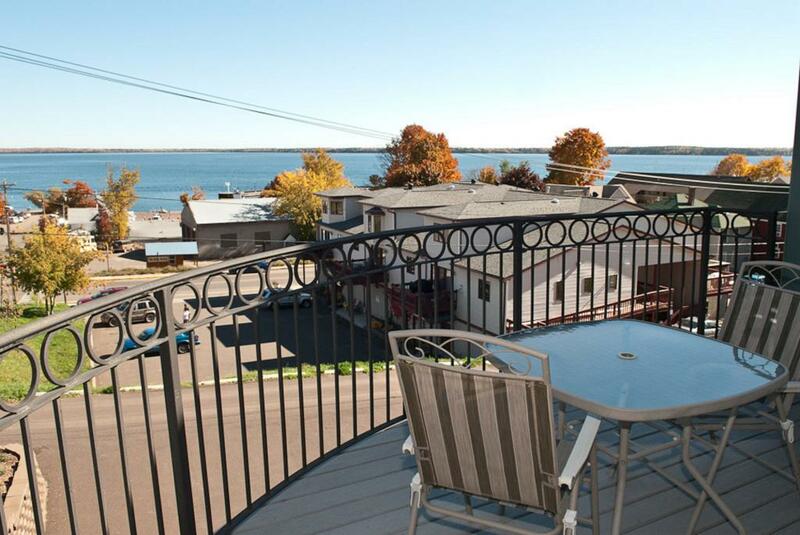 This unit has an outstanding view of Lake Superior and a private wrap-around balcony. Private parking for 1 vehicle. No smoking, no pets. Occupancy rate based on 6 people ($20/night per additional guest). Maximum 8 adults, children under 5 stay free! Complimentary WIFI and cable included! 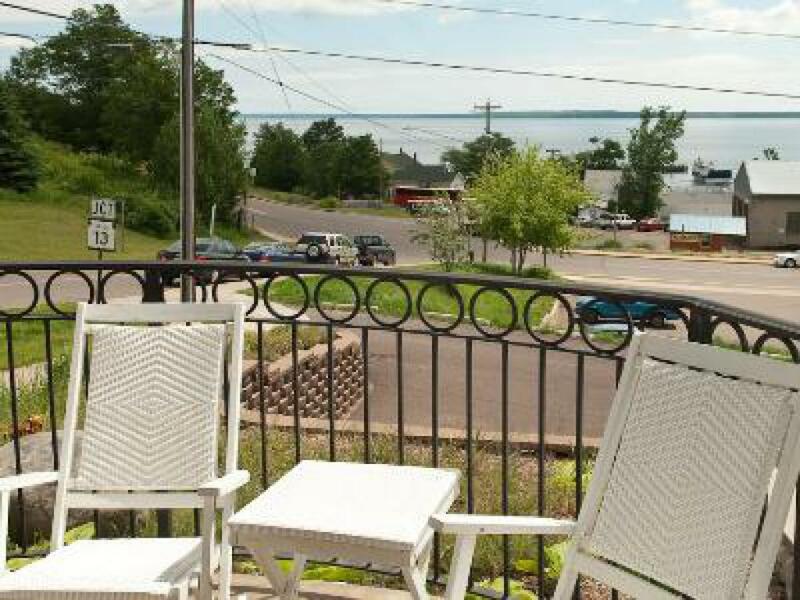 Ada O'Day Condos are located just 2 blocks from The Bayfield Inn, 2 blocks from Lake Superior and the Madeline Island Ferry Line, and 1 block from all downtown Bayfield. 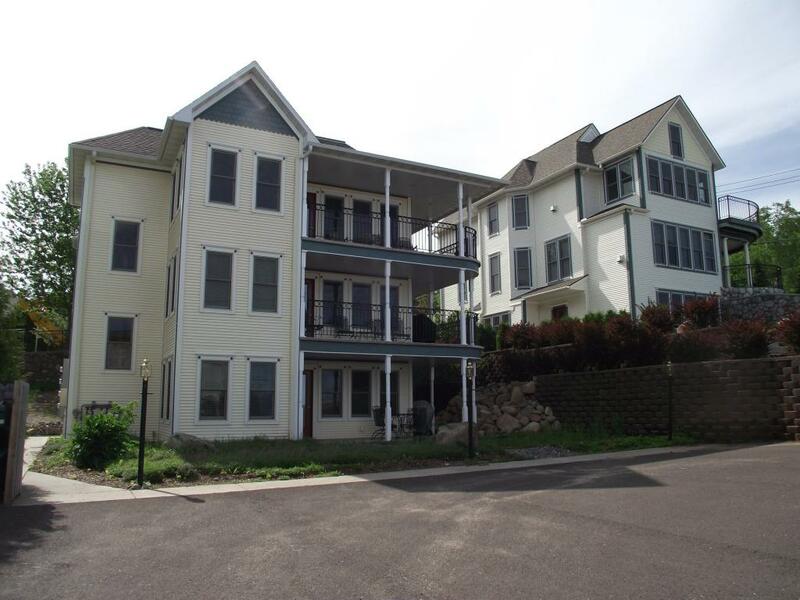 Ada O'Day 6 is a third floor condo and stairs are required. 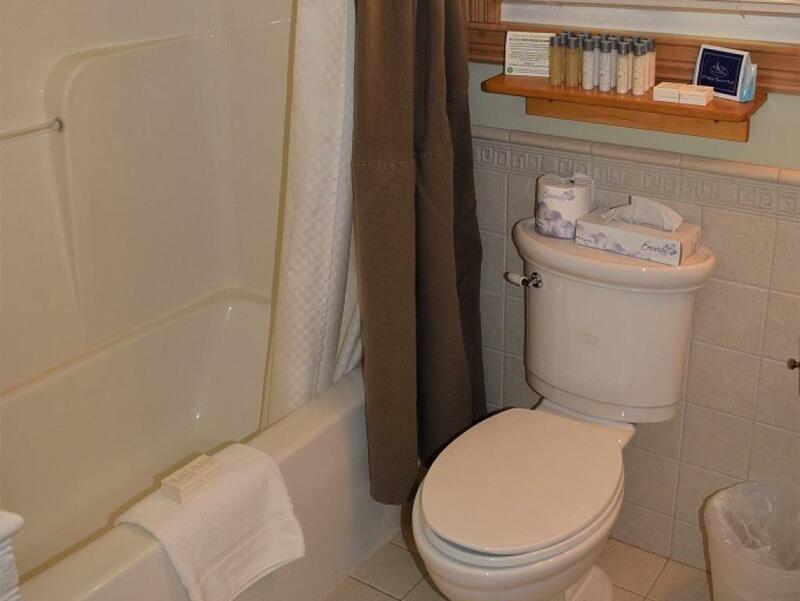 This is a beautiful 1 bedroom unit with a queen and attached full bathroom (with jetted tub). The loft has a full-size sofa sleeper, and the living room has a queen-size sofa sleeper. 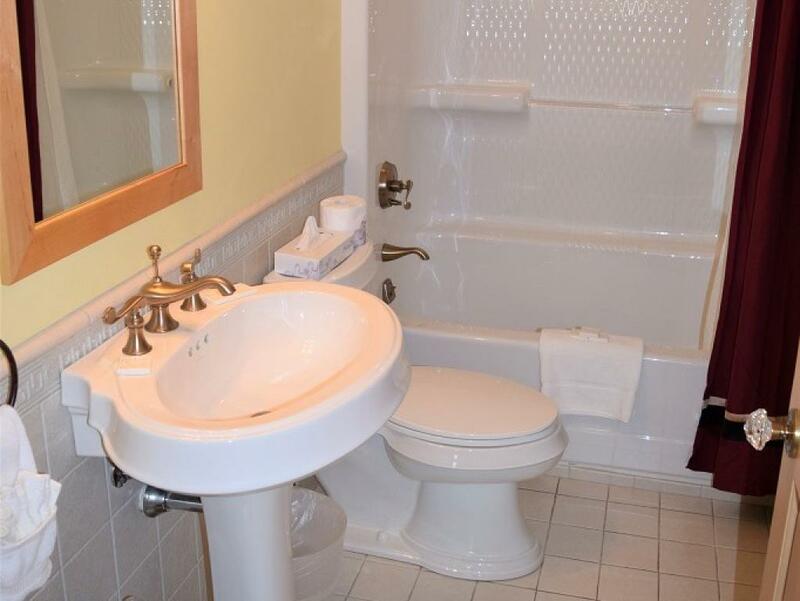 There is an additional 3/4 bathroom located off the living room. 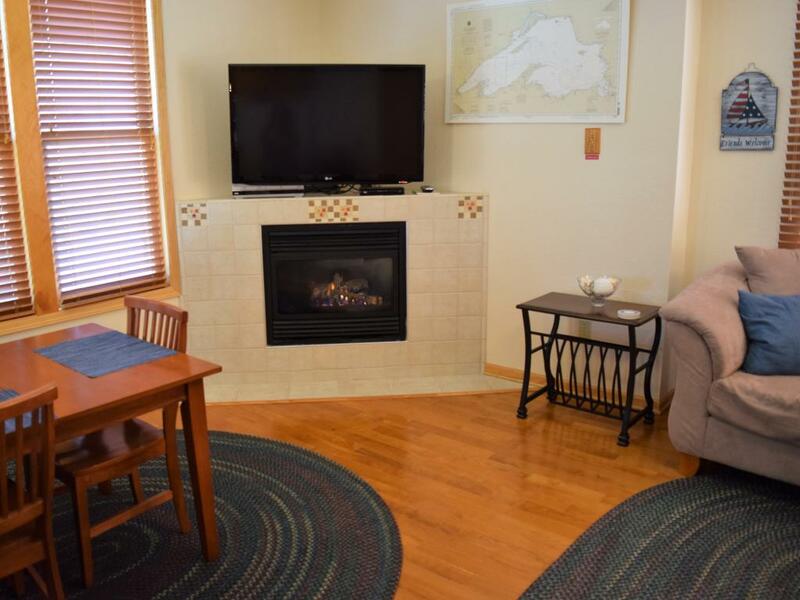 Ada O'Day 6 has a fully-equipped kitchen, a gas fireplace, breakfast bar, and dining area for 4. 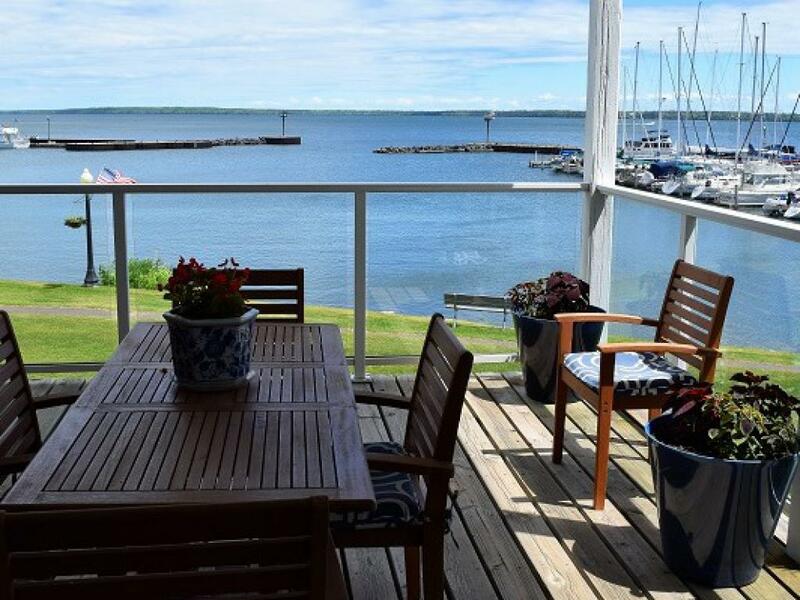 This unit offers a private wrap-around deck with gorgeous Lake Superior views. 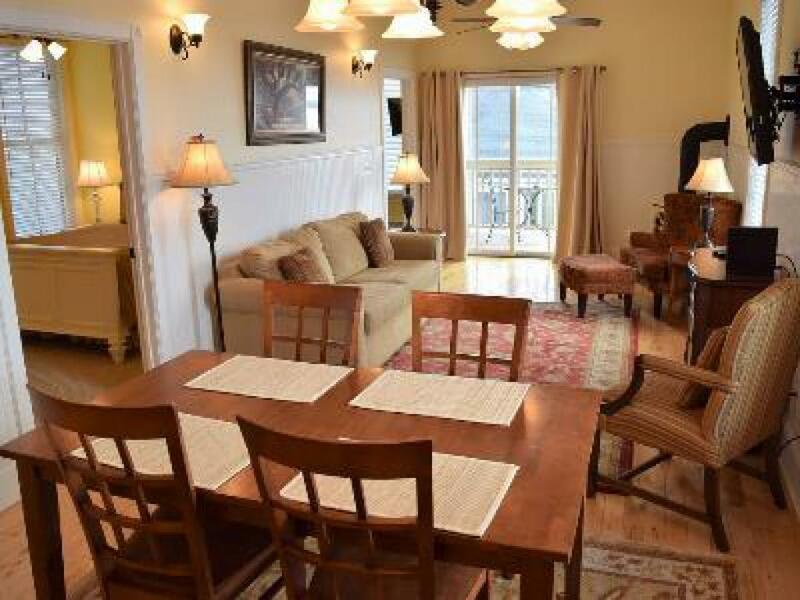 Ada O'Day 6 has new furnishings and is very modern. Private parking for 1 vehicle. No smoking, no pets. Occupancy rate based on 2 people ($20/night per additional guest). Maximum 6 adults, children under 5 stay free! Complimentary WIFI and cable included! Andrew Tate Condos are located across the street from The Bayfield Inn with a convenient downtown location. Enjoy downtown shopping, restaurants, an Apostle Island cruise, or trip to Madeline Island just steps from your accommodation. This unit is located on the 2nd floor and requires stairs. 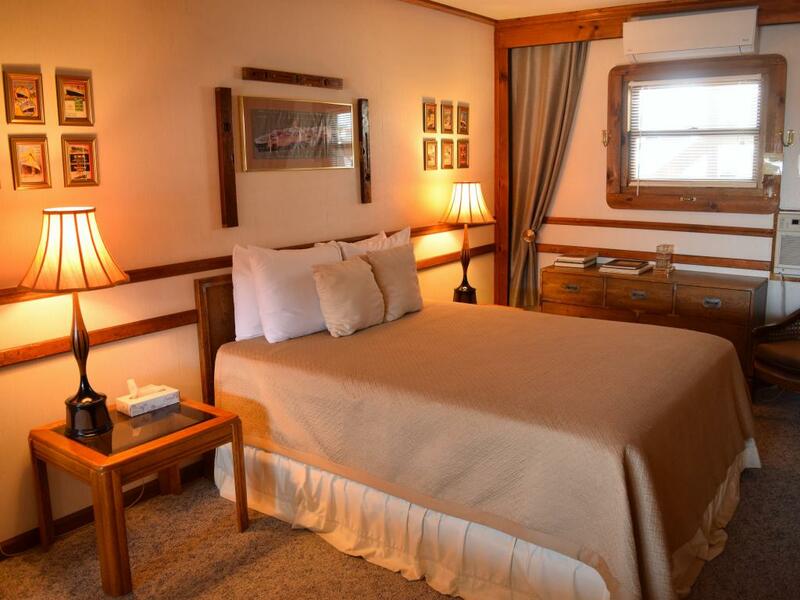 Andrew Tate 202 has 2 bedrooms with 1 queen bed each, plus a queen sofa sleeper in the living room. 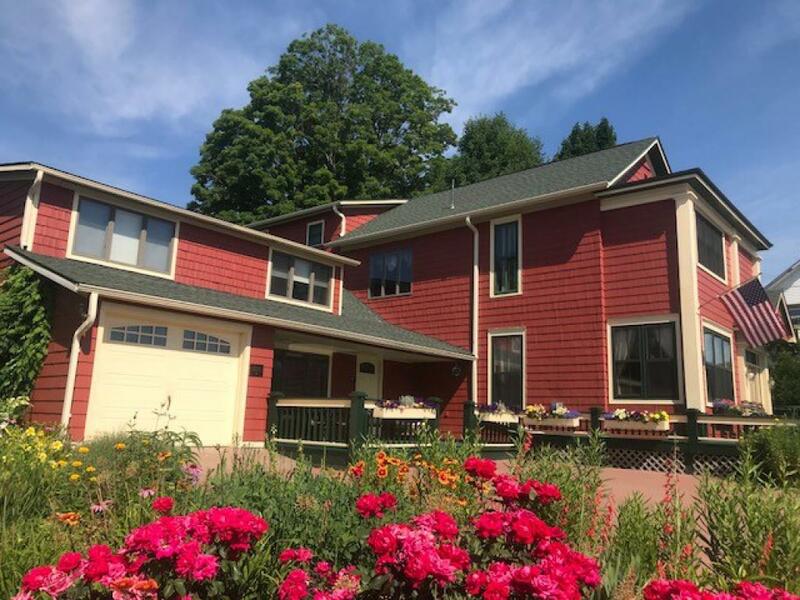 There are Victorian furnishings, modern amenities, a fully equipped kitchen, gas fireplace, & private corner deck with a great Lake Superior view. 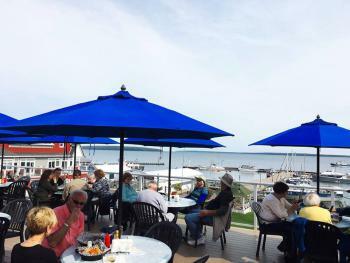 Enjoy live music next door on The Bayfield Inn's rooftop deck bar on weekends in summer on your own private deck! (Potential for Noise) Private parking for 1 vehicle. No smoking, no pets. Occupancy rate based on 4 people ($20/night per additional guest). Maximum 6 adults, children under 5 stay free! Complimentary WIFI and cable included! This beautiful 2-bedroom, 1-bath condominium is located downtown across the street from the main Bayfield Inn, right in the hot seat of Bayfield's downtown nightlife (Potential for Noise). Enjoy downtown shopping, restaurants, an Apostle Island cruise, or trip to Madeline Island just steps from your accommodation. 1 queen bed in each bedroom + full-sized sleeper sofa in living room. 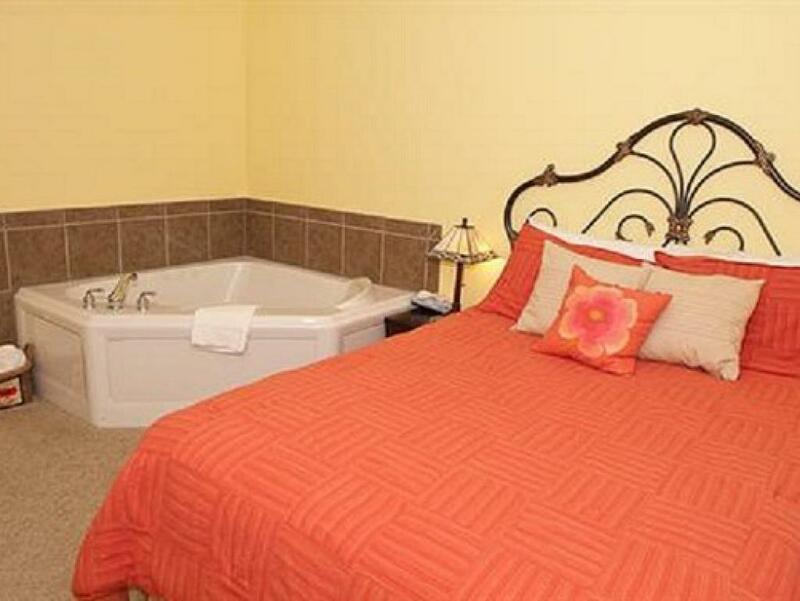 1 full bathroom between each private guest room, plus a 2-person jacuzzi tub in master bedroom! 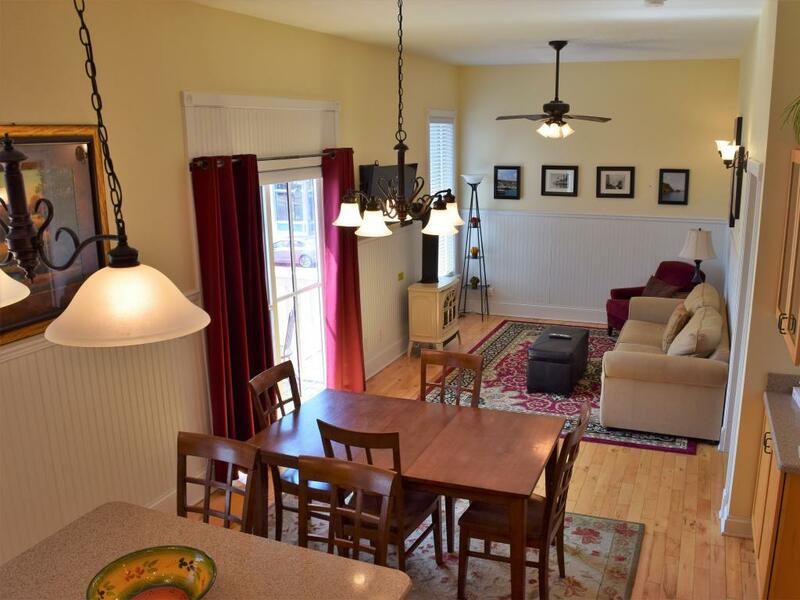 Full kitchen; kitchen seating; gas fireplace in living room. 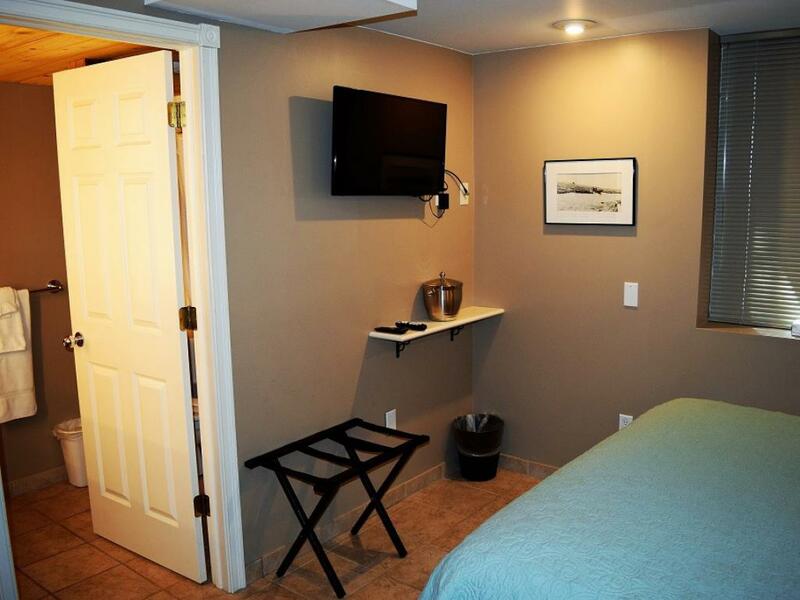 HDTV with HBO, complimentary WIFI, air conditioning, and heat. 2nd floor with elevator access. 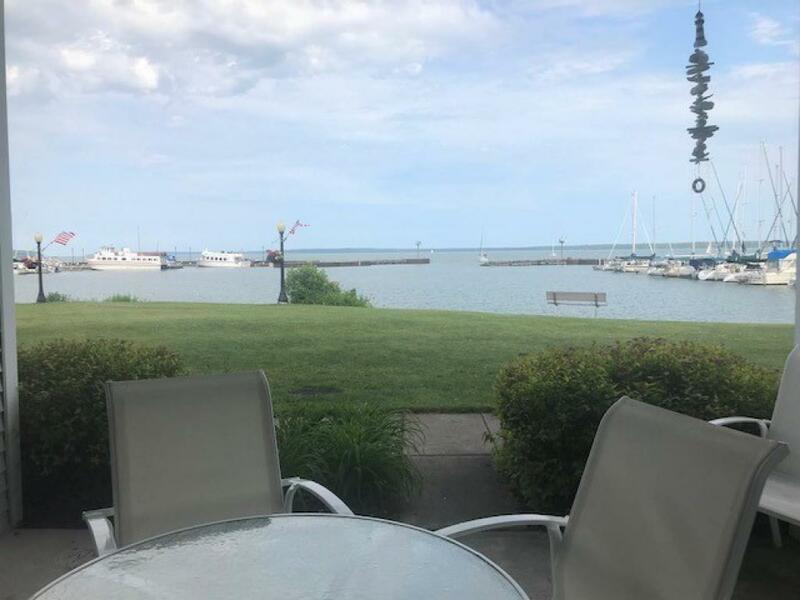 View of the Bayfield marina from the private deck off of the living room. Private parking for 1 vehicle. No smoking, no pets. 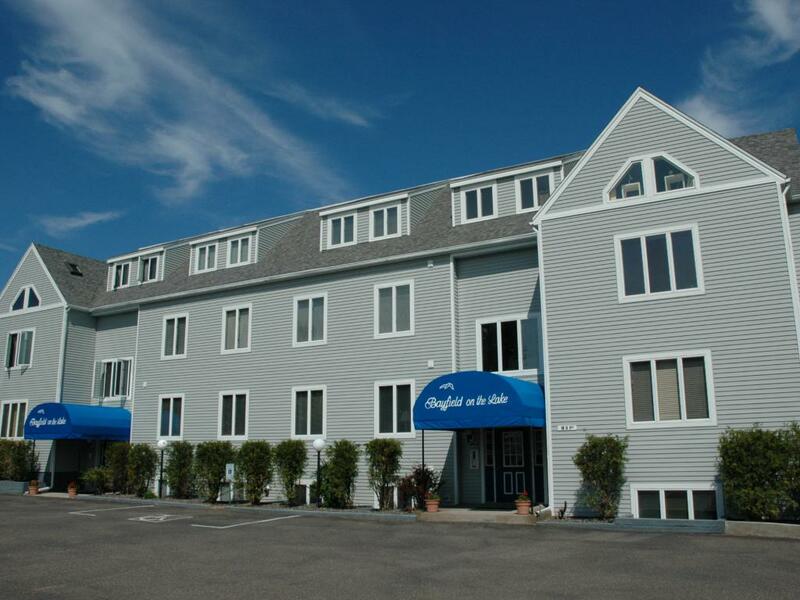 Occupancy rate based on 4 people ($20/night per additional guest). Maximum 6 adults, children under 5 stay free! Main floor of the Bodin-Ski House: a beautiful Cape Cod-style home seated downtown Bayfield. 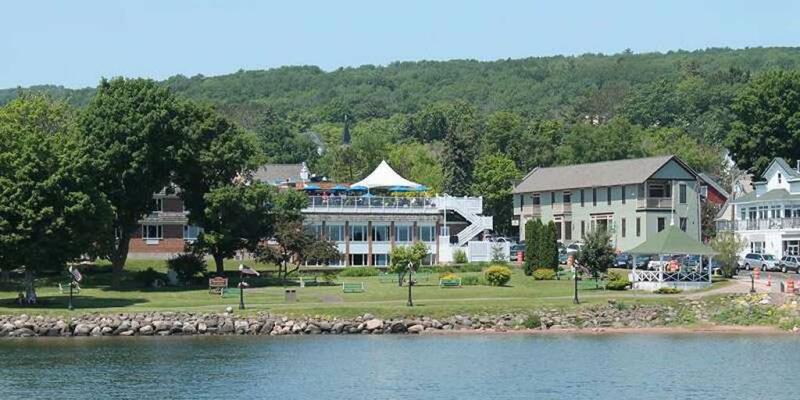 Located 1/5 block from the main Inn and just a short walk to the Madeline Island Ferry, Apostle Island Cruise Service, and all of Bayfield's downtown attractions. 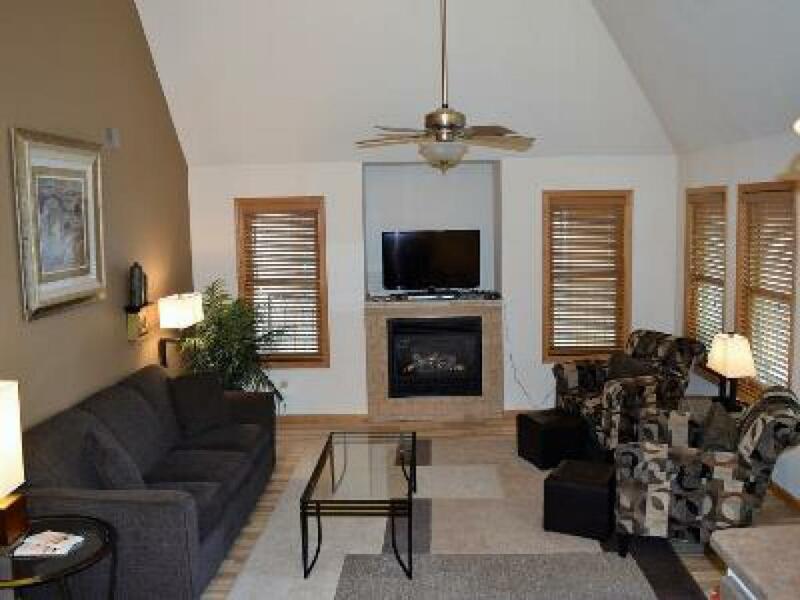 2 bedrooms (1 queen in each bedroom, master bedroom has an additional full-sized sofa sleeper), 2 full bathrooms (master bedroom has it's own attached bathroom). 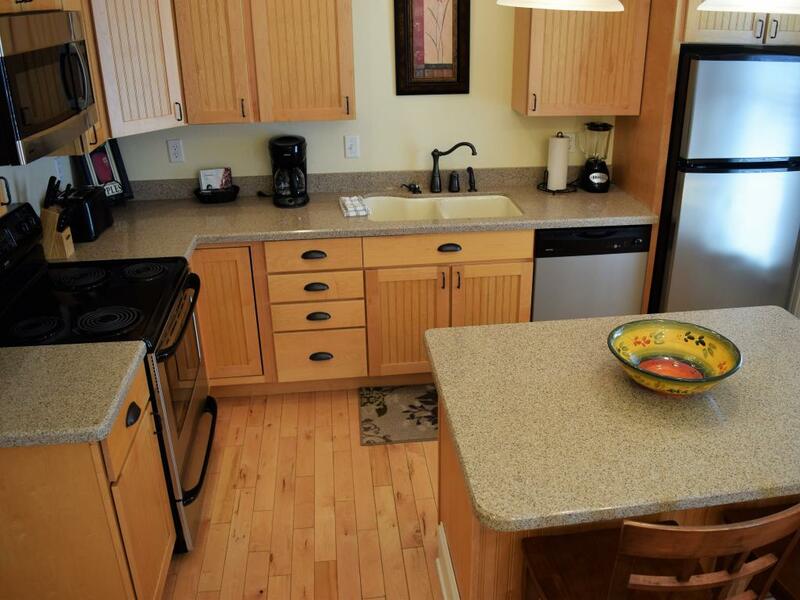 Full kitchen with dishwasher and island seating for 1-3 people, living room equipped with HDTV and complimentary WIFI. 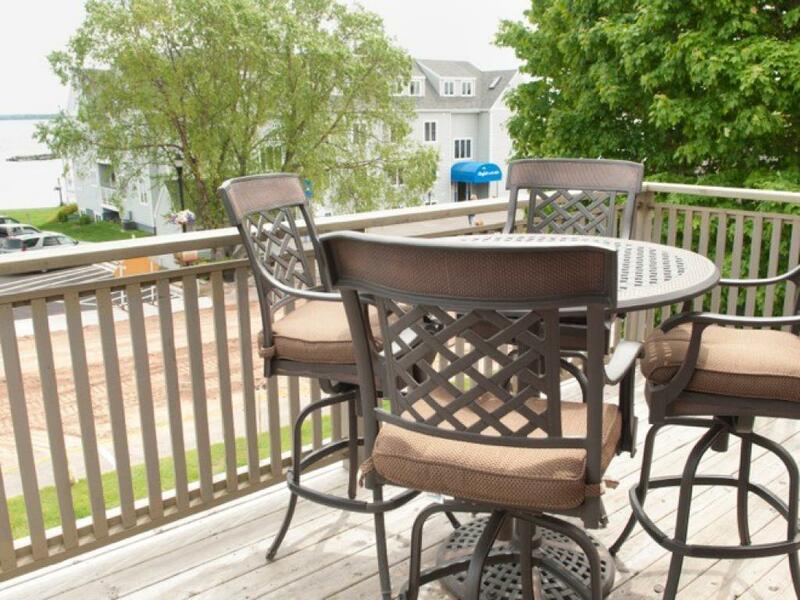 Attached deck off of the living room with partial lake views. Private parking for 2 vehicles. No smoking, no pets. 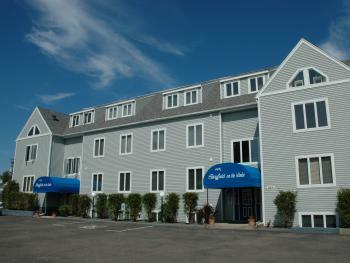 Occupancy rate based on 4 adults ($20 per extra guest per night). Maximum 6 adults, children under 5 stay free! Second floor (stairs required) of the Bodin-Ski House: a beautiful Cape Cod-style home seated downtown Bayfield. 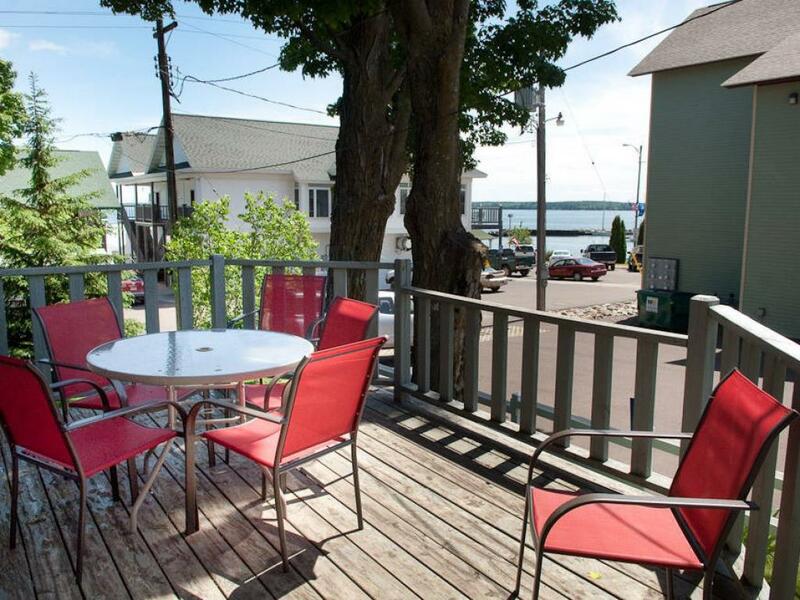 Located 1/5 block from the main Inn and just a short walk to the Madeline Island Ferry, Apostle Island Cruise Service, and all of Bayfield's downtown attractions. 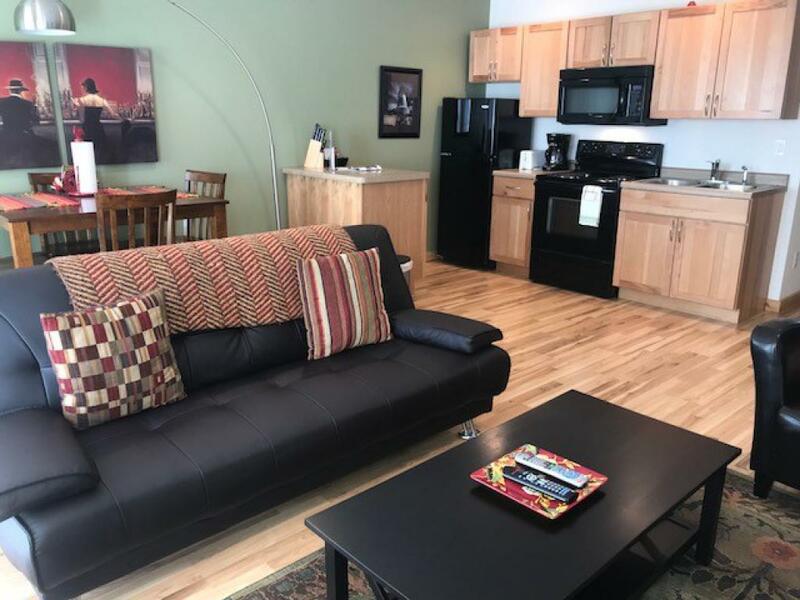 3 bedrooms (1 full bed in each bedroom) + extra den with a twin-sized pull-out sofa bed (mini fridge, microwave, and television also in den room). 1 full bathroom. 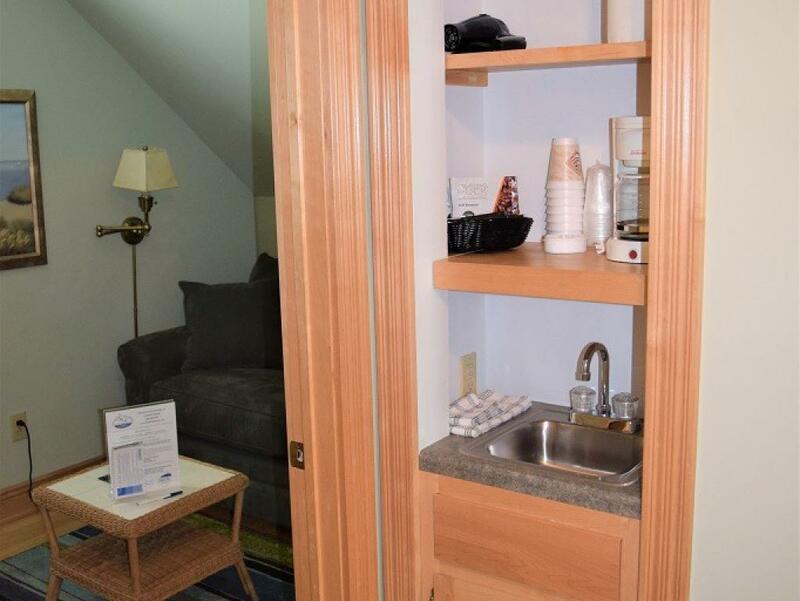 Mini fridge, coffee maker, HDTV with HBO in each bedroom, complimentary WIFI. Private entrance on the side of the home. No true lake views, but lots of windows and views of the city. No pets, no smoking. Private parking for 2 vehicles. 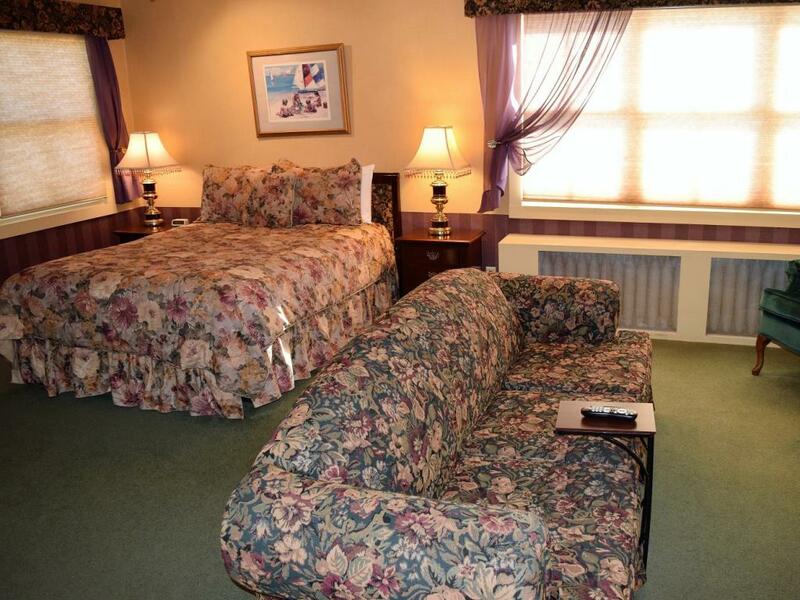 Maximum 7 adults, occupancy rate based on 6 adults (+$20/per extra guest). Children under 5 stay free! 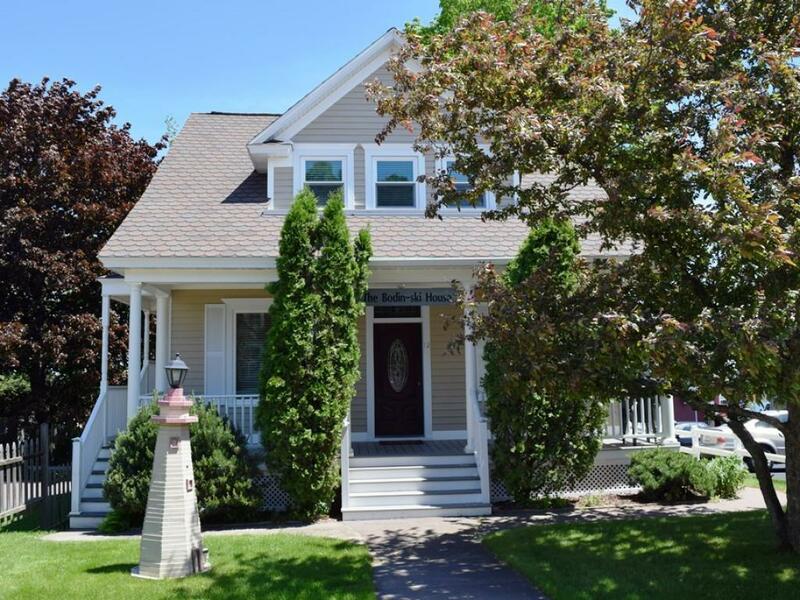 This beautiful Cape Cod-style home is seated directly in downtown Bayfield. 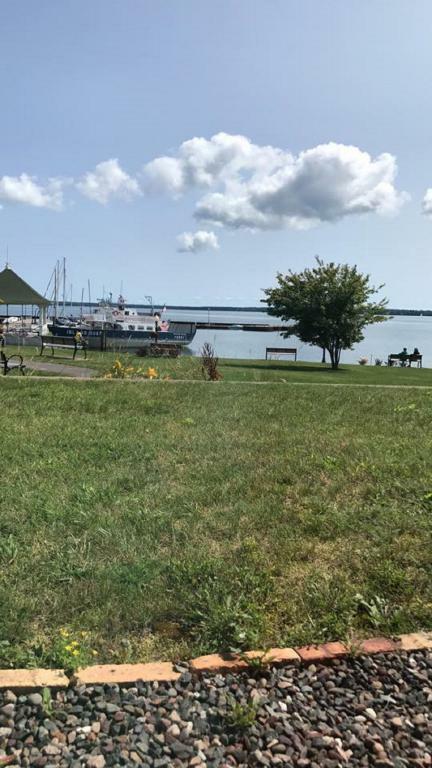 Located 1/5 block from the main Inn and just a short walk to the Madeline Island Ferry, Apostle Island Cruise Service, and all of Bayfield's downtown attractions. 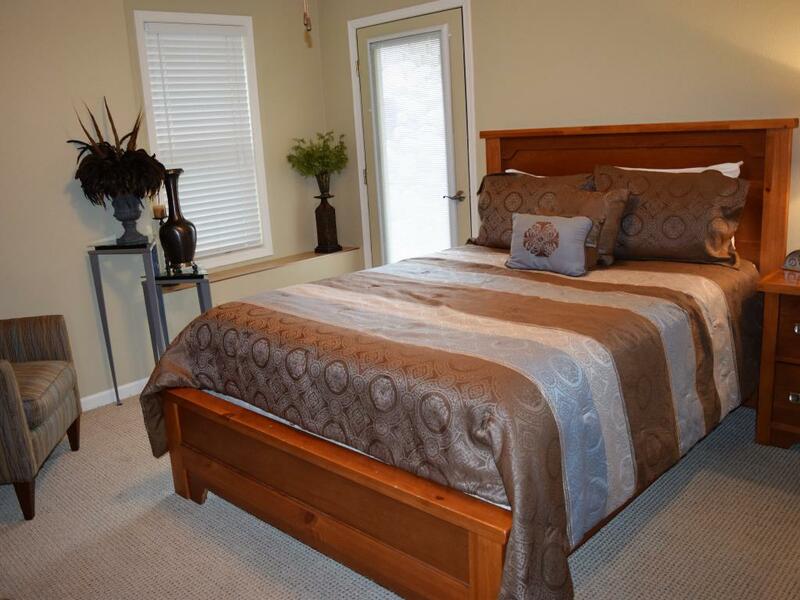 5 bedrooms (1st floor: 2 queen bedrooms + full-sized sofa sleeper in master bedroom. 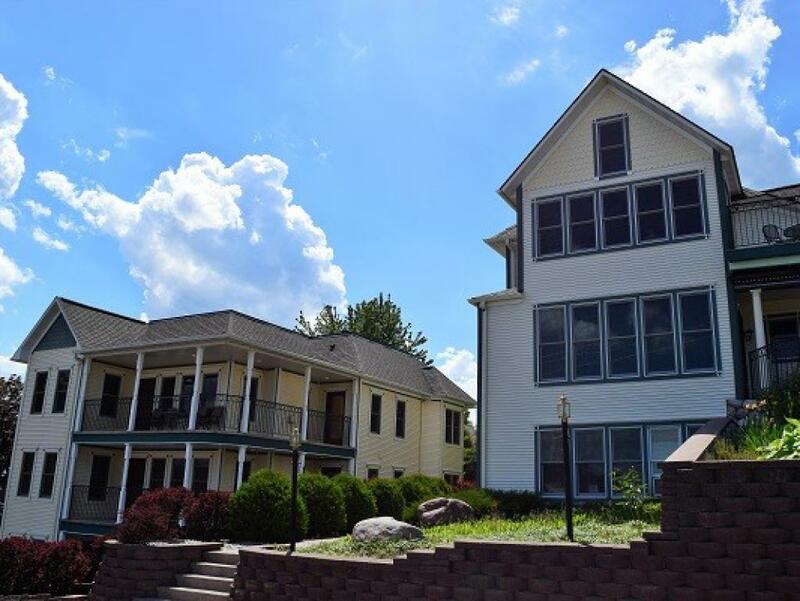 2nd floor: 3 full bedrooms + twin-sized sofa sleeper in den), 3 full bathrooms (master bedroom on 1st floor has it's own attached bathroom + additional full bathroom on 1st floor; 2nd floor has full bathroom). 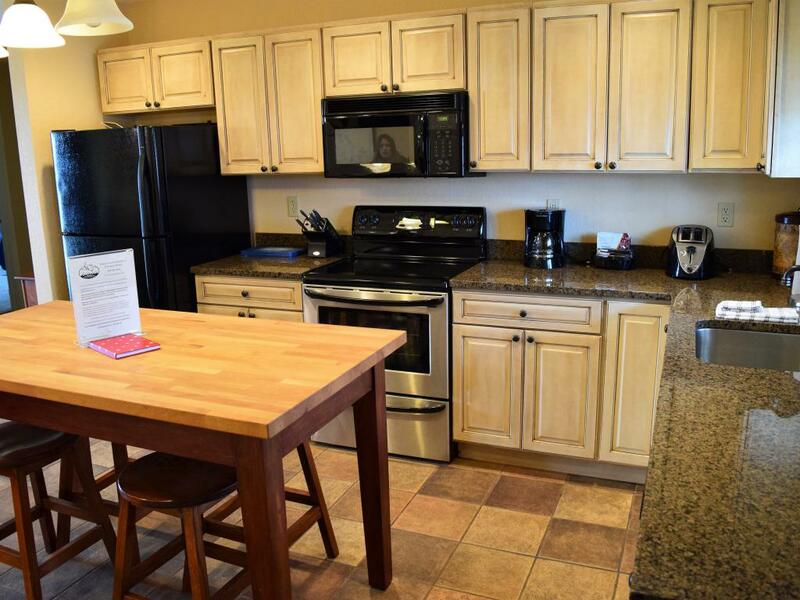 Full kitchen with dishwasher and island seating for 1-3 people (additional mini fridge, coffee maker, and microwave in 2nd floor den), living room equipped with HDTV (each bedroom also has 1 TV), complimentary WIFI. 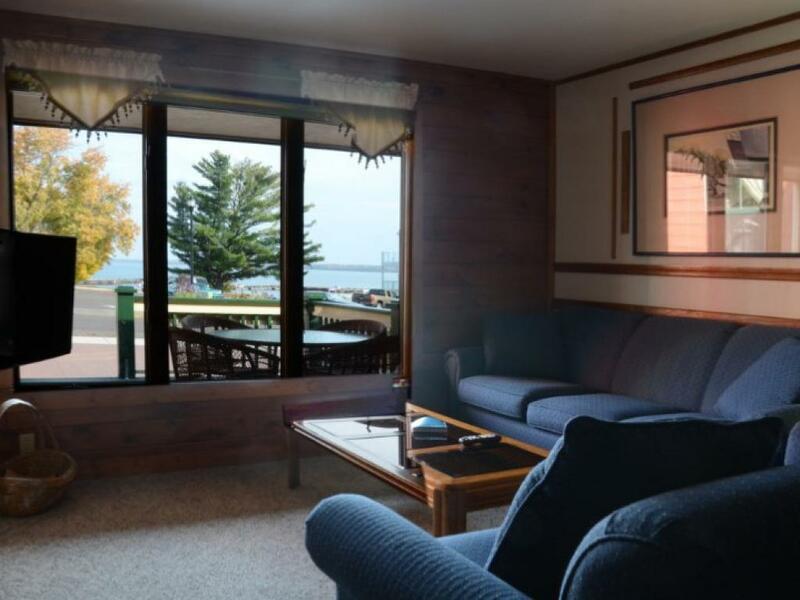 Attached deck off of the living room with partial lake views. No pets, no smoking. Maximum 10 adults, occupancy rate based on 10 adults. Private parking for 2-4 vehicles. 3-night minimum July & August. Stairs required. 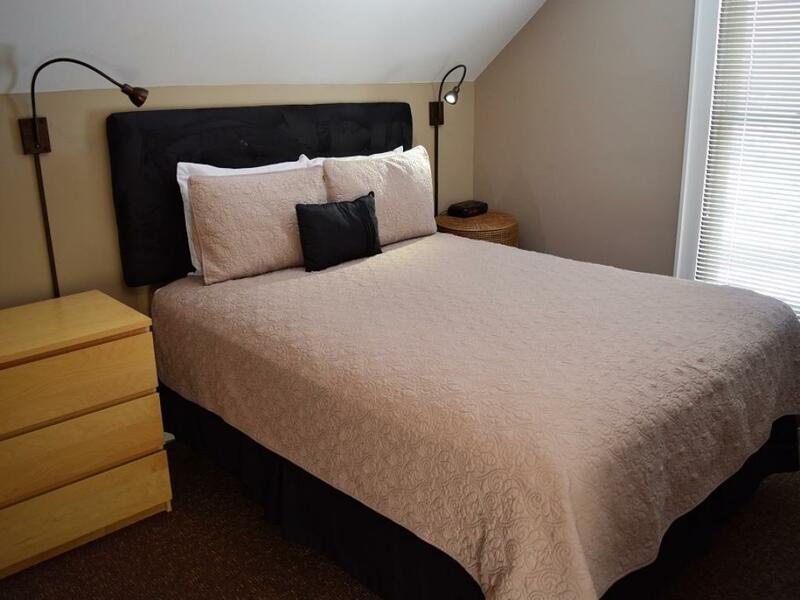 Very modern 2nd floor suite (stairs required) with 2 separate bedrooms (1 queen bed per bedroom), plus full-sized sofa sleeper in the separate living area. 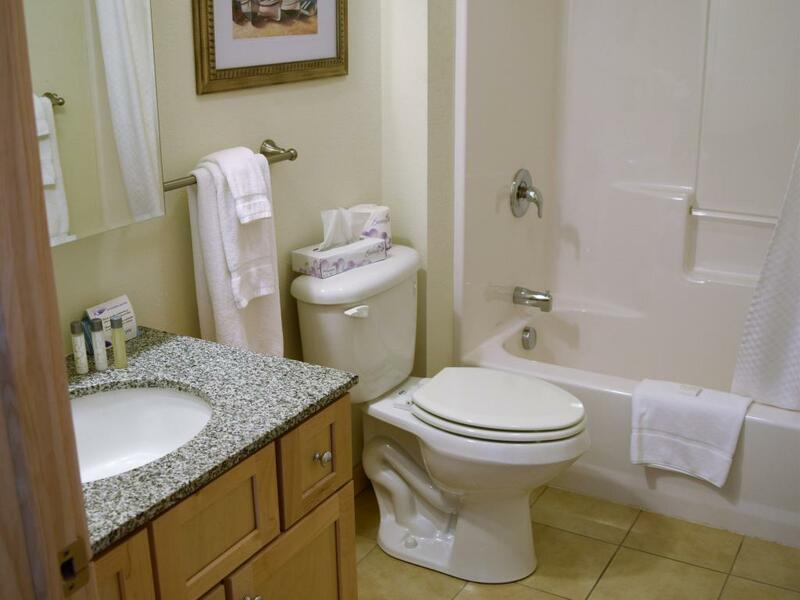 3/4 bathroom with large step-in shower (no bathtub). 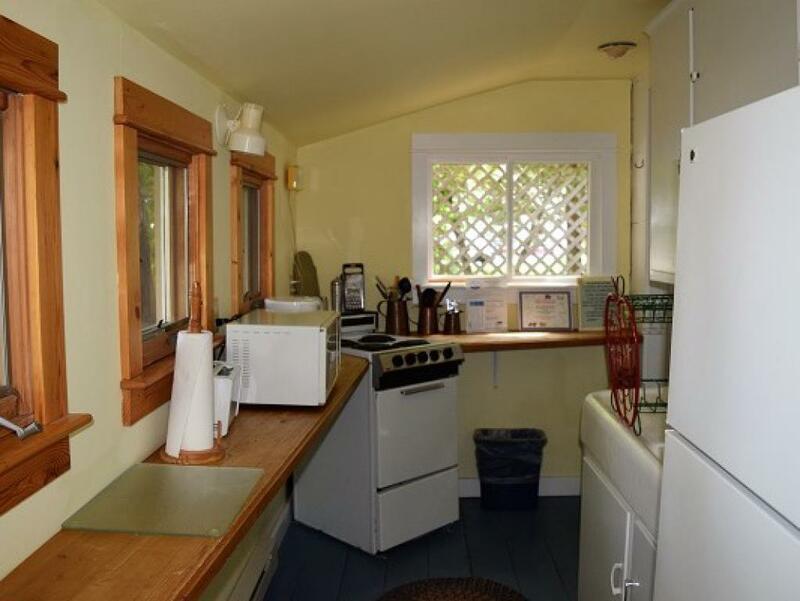 Kitchenette (mini fridge, microwave, sink, dishes, stove top burners, coffee pot). Small breakfast nook for dining seating. 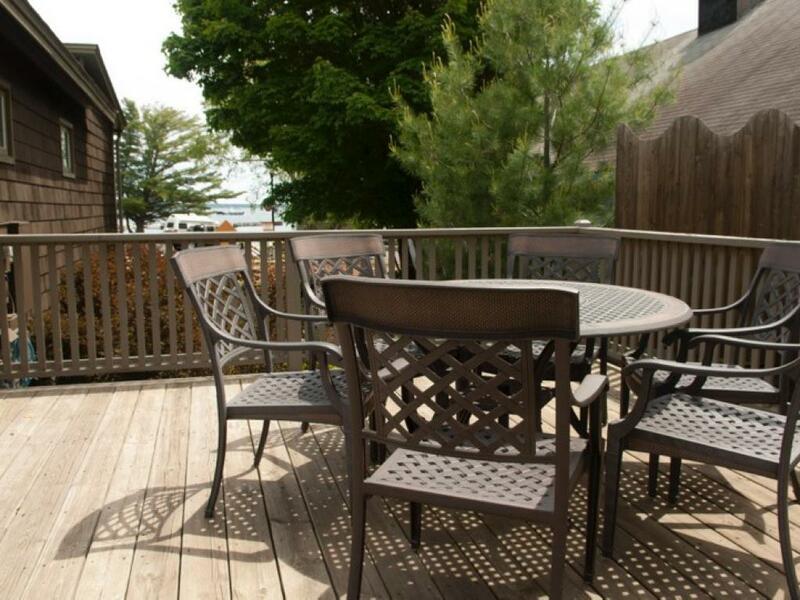 Great private deck with lake views set for 2-4 people. Located across the street from the main Inn. Private parking in back of building for 1 vehicle. No smoking, no pets. 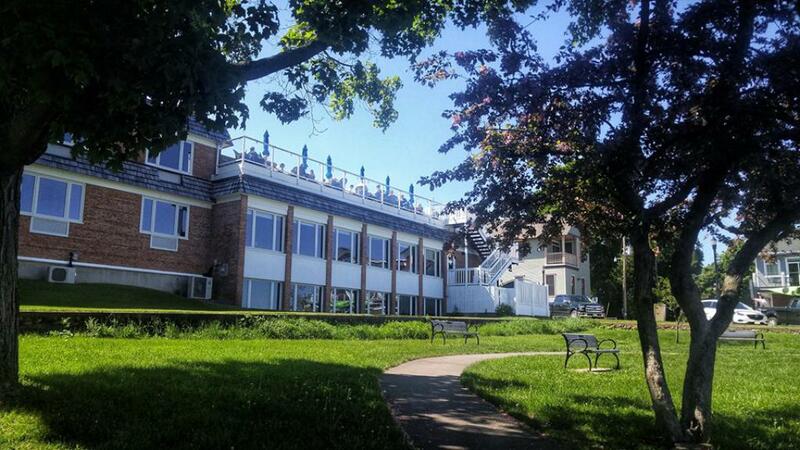 Maximum 6 adults, occupancy rate based on 4 adults (+$20/per extra guest). Children under 5 stay free. Complimentary WIFI and cable included! 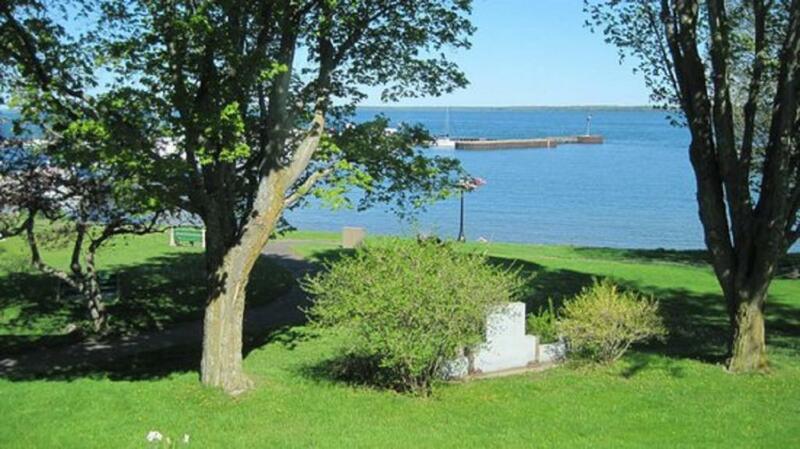 The Phoenix Suite is a large Victorian 2-room unit with 3 queen beds and views of Lake Superior and the Bayfield harbor. The main area is a living room/bedroom combo with 2 queen beds and there is a separate private bedroom with 1 queen bed (TVs in each room). 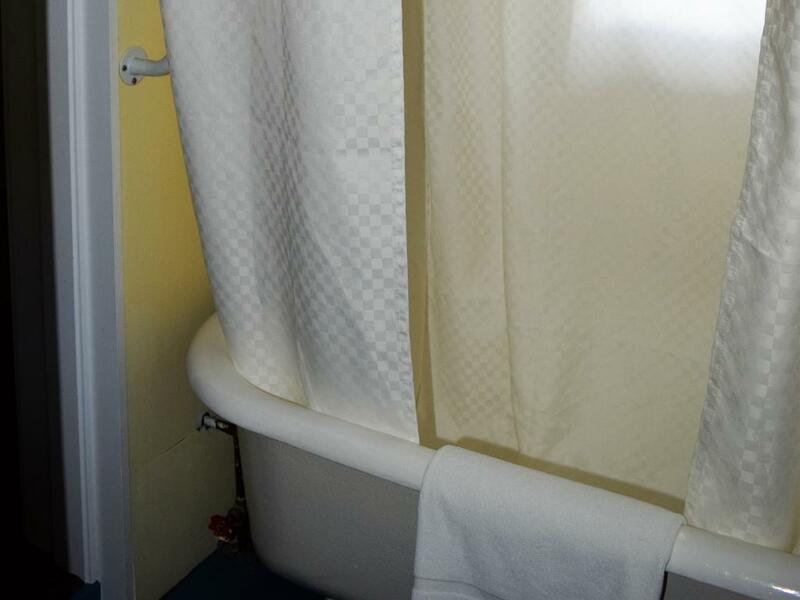 The Phoenix has a small private bath with a shower/tub. 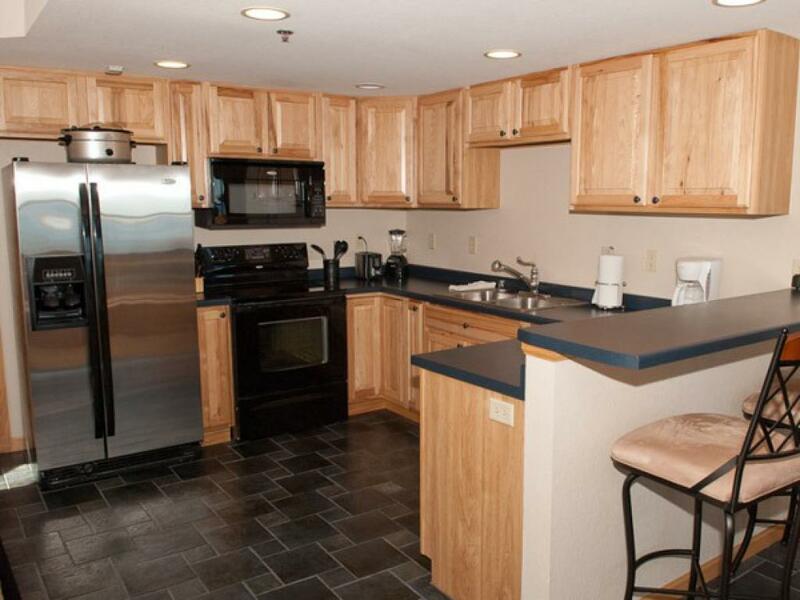 This unit also has a wet bar with sink, microwave, coffee pot, and mini fridge. 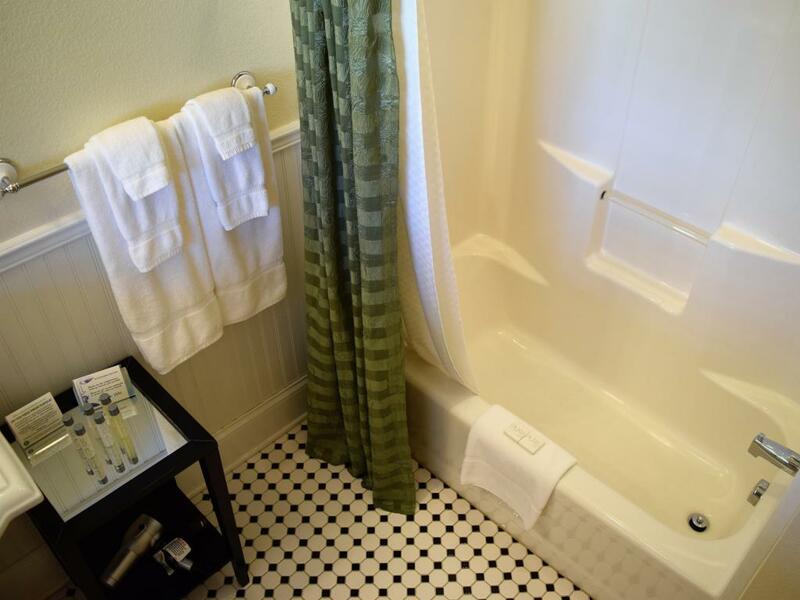 This unit features yesterday's charm with today's amenities. 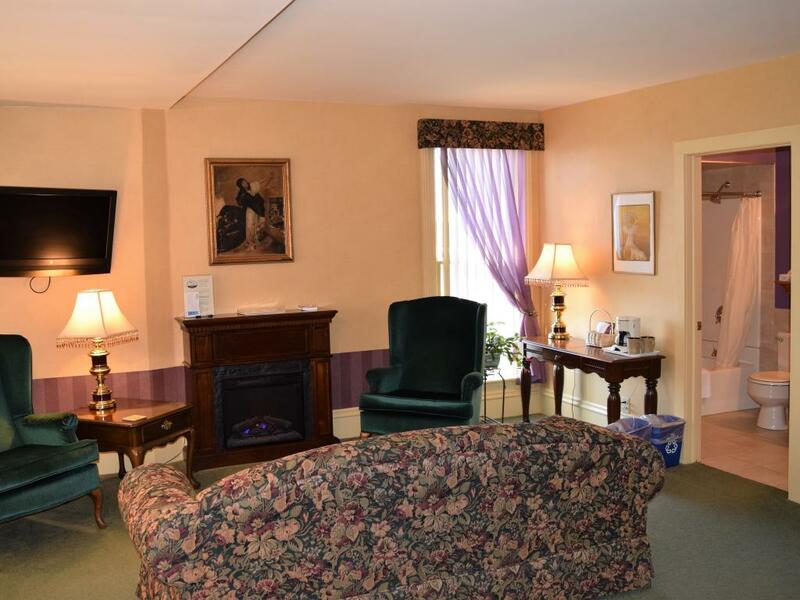 The Phoenix Suite is located on the 2nd floor of the historic Isaac Wing House. Stairs are required. 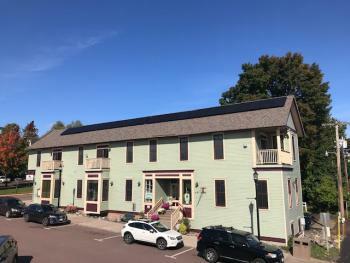 Isaac Wing House is located across the street from The Bayfield Inn. Property offers beautiful gardens surrounding the home. Pets are allowed with extra one-time, non-refundable fee of $25/pet! Occupancy rate is based on 6. Maxiumum 6 adults. Private parking for 1 vehicle. Complimentary WIFI and cable included! No smoking. 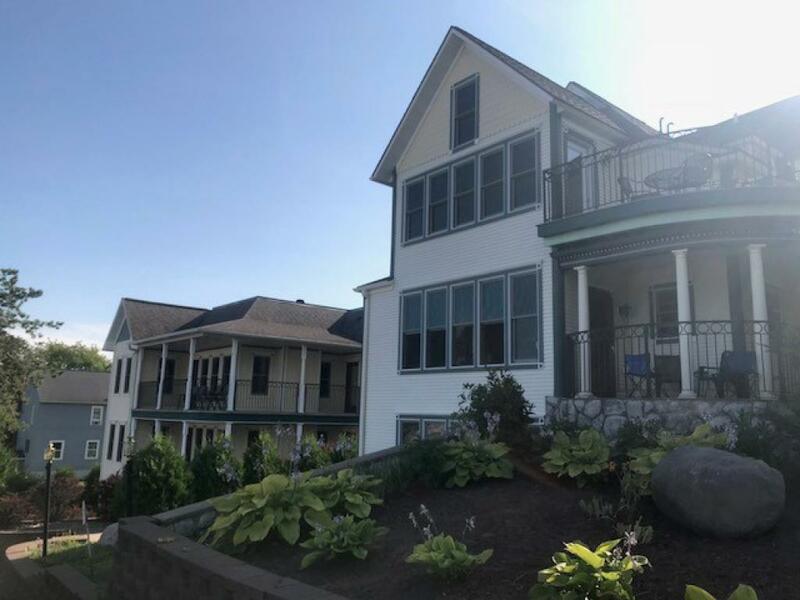 QE II is a large suite on the 1st floor of the Victorian Isaac Wing House (a few steps are required onto the porch into the unit). 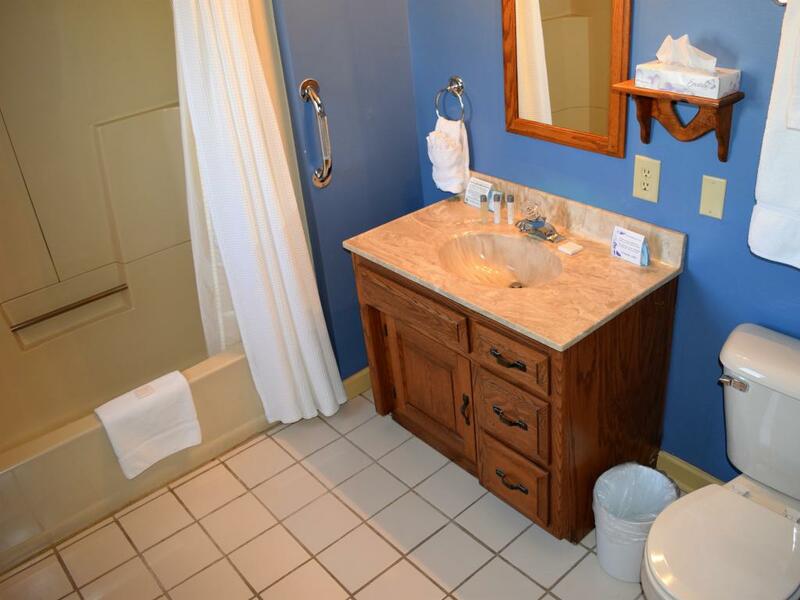 This unit features yesterday's charm with today's amenities. There are 2 bedrooms (living room/bedroom combo with 1 queen that has a privacy curtain, 2nd private bedroom with 1 full and 1 queen). 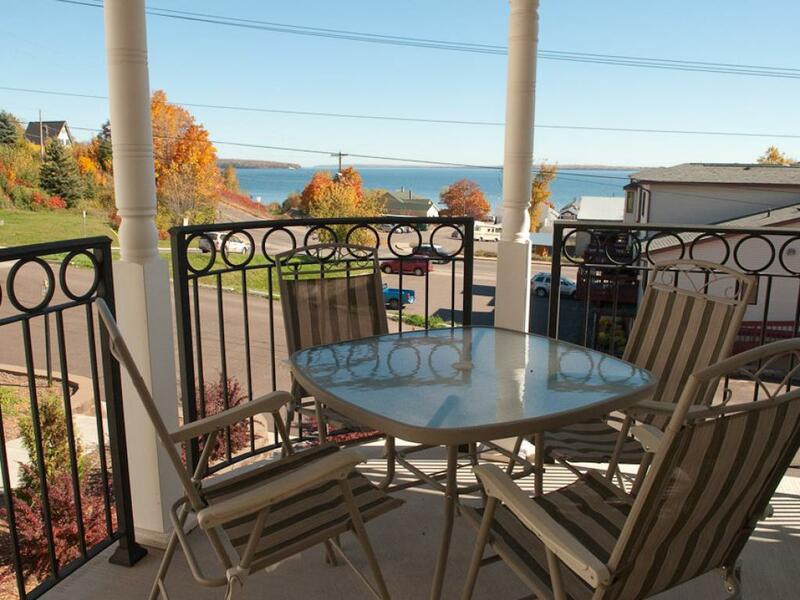 Limited Bayfield Harbor/Lake Superior view from private porch & living room. 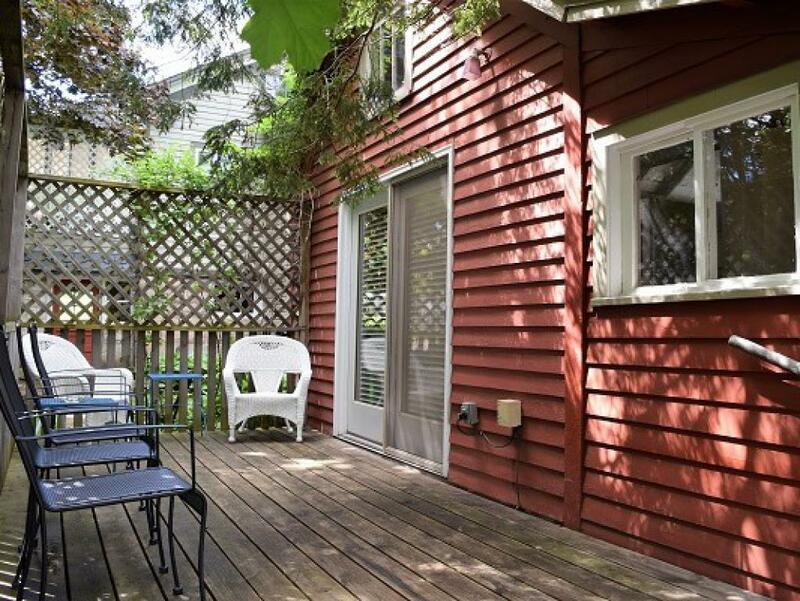 Small patio off of the 2nd guest room with garden views. 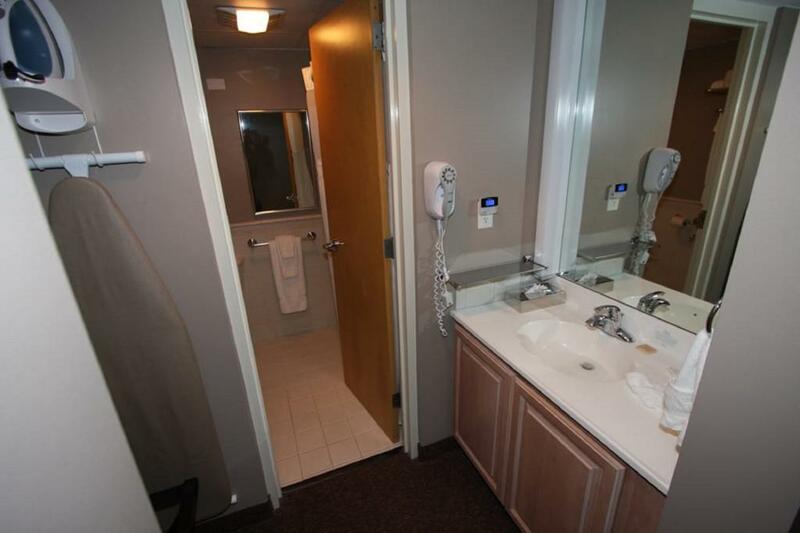 QE II has a large jacuzzi tub, separate walk-in shower, wet bar/sink, microwave, coffee pot, & mini fridge. The QE II Suite is in the historic Isaac Wing Guest House and is located across the street from The Bayfield Inn. 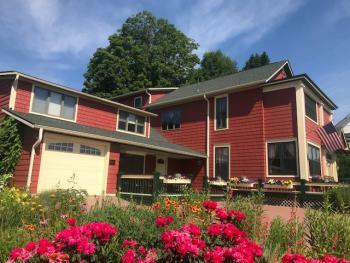 The property offers beautiful gardens surrounding the home. Pets are allowed with extra one-time, non-refundable fee of $25/pet! Occupancy rate is based on 6. Maximum 6 adults. Walk-out private parking for 1 vehicle. Complimentary WIFI and cable included! No smoking. 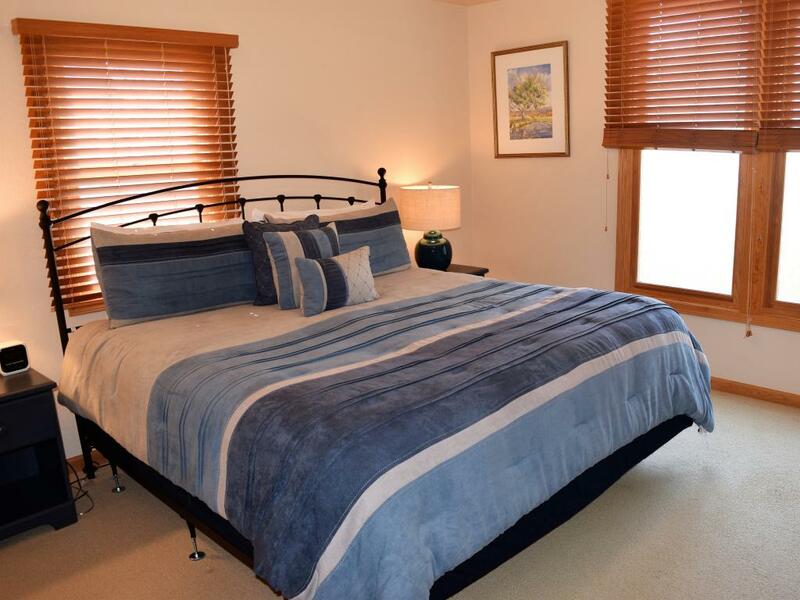 1st floor room (no stairs required) with 1 king bed, city view. 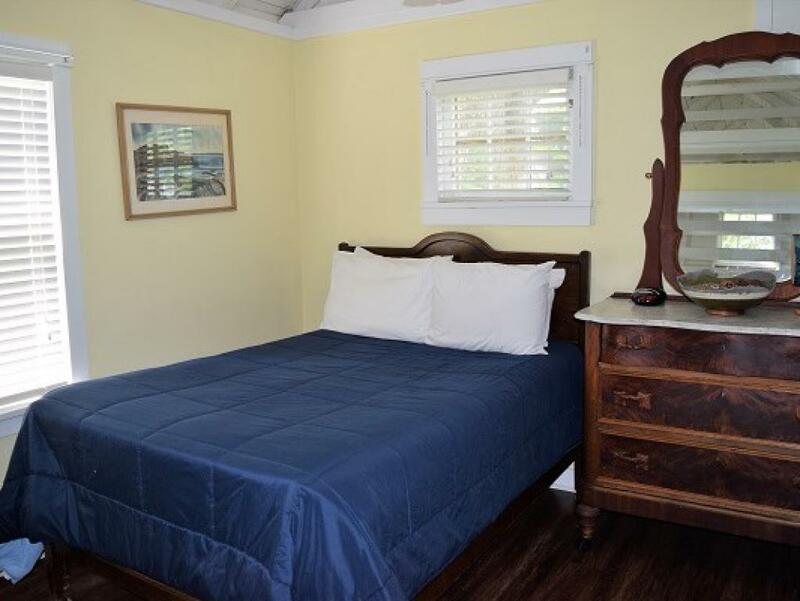 Newly renovated room includes new Serta DreamWeaver Bed. 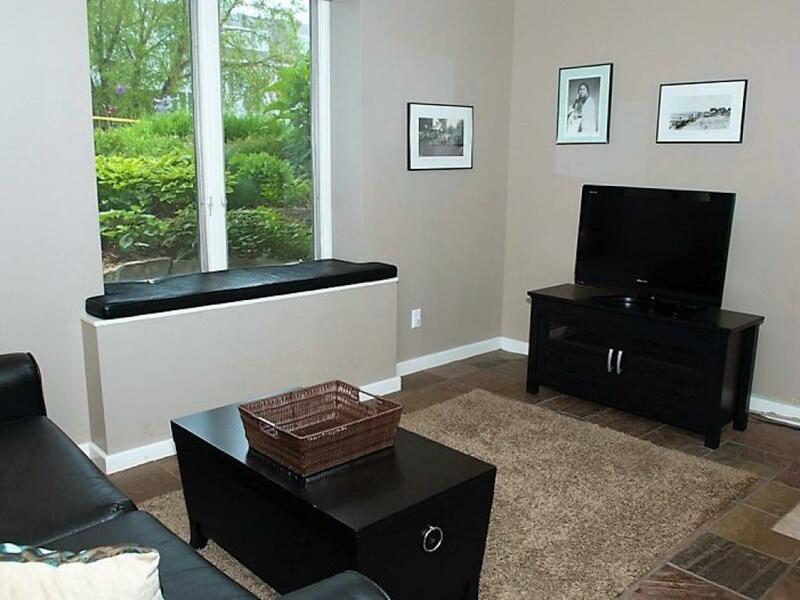 HDTV with HBO, coffee maker, & mini fridge, complimentary WIFI. Largest standard room. 1st room off of the lobby, restaurant, vending machines, and staircase. Grab bars in bathroom, plus detachable shower head in tub/shower combo. Maximum 2 adults, occupancy rate based on 2 adults. No pets, no smoking. Private parking. 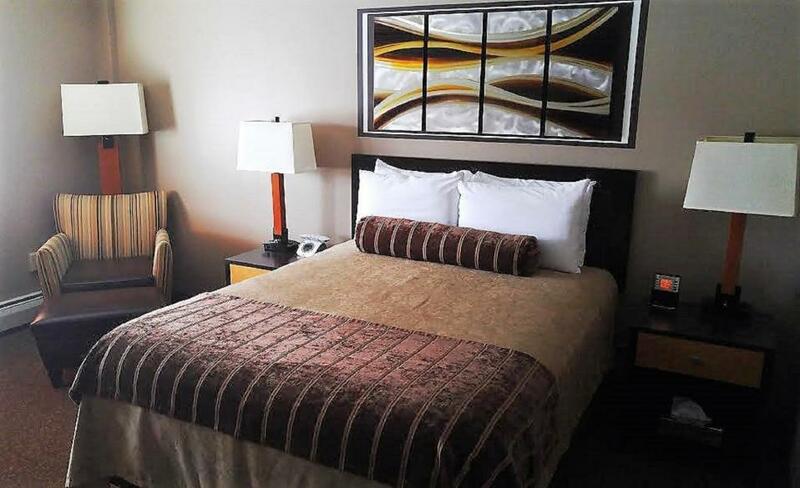 1st floor room (no stairs required) with 1 queen bed, city view. Newly renovated room includes new Serta DreamWeaver Bed. 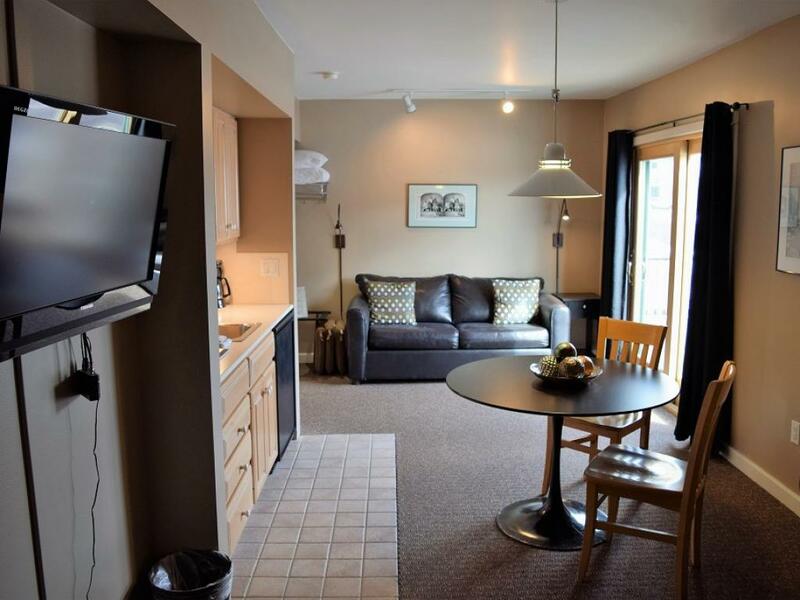 HDTV with HBO, coffee maker, & mini fridge, complimentary WIFI. Maximum 2 adults, occupancy rate based on 2 adults. No pets, no smoking. Private parking. 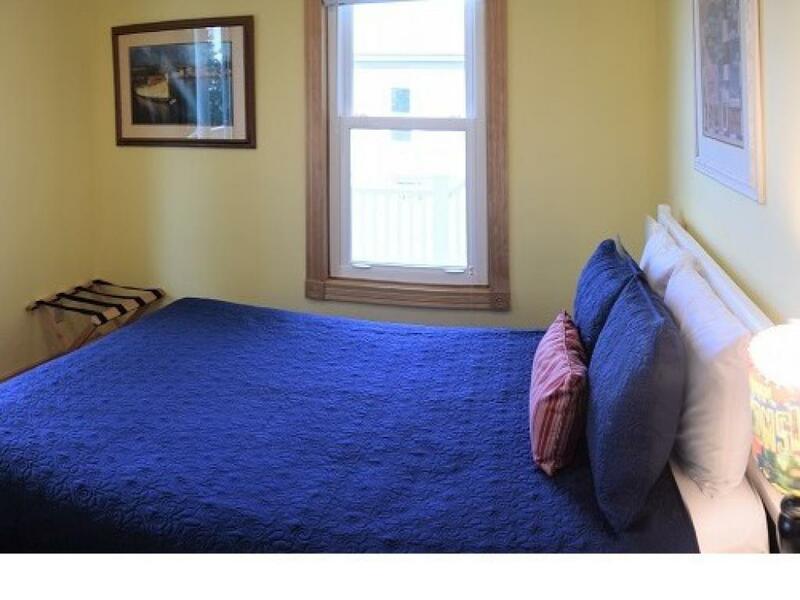 2nd floor room (stairs required, near deck bar) with 1 queen bed, city view. 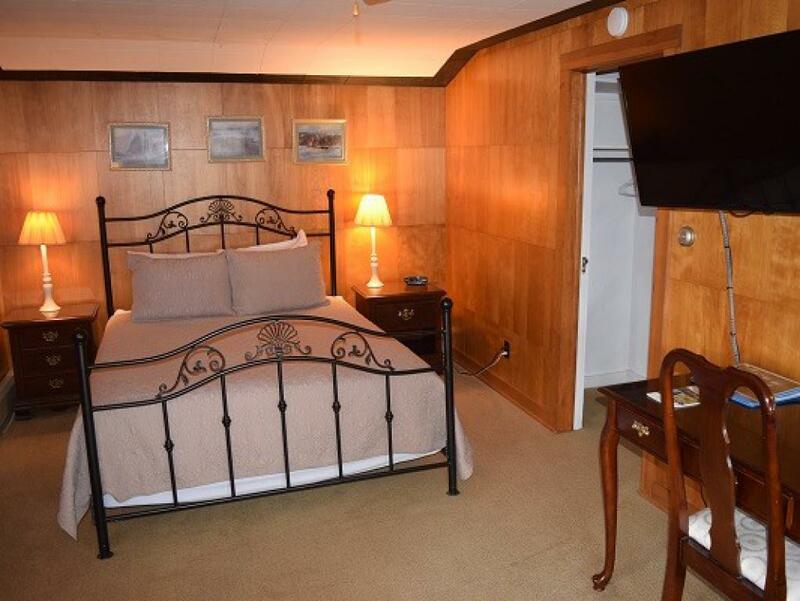 Newly renovated room includes new Serta DreamWeaver Bed. 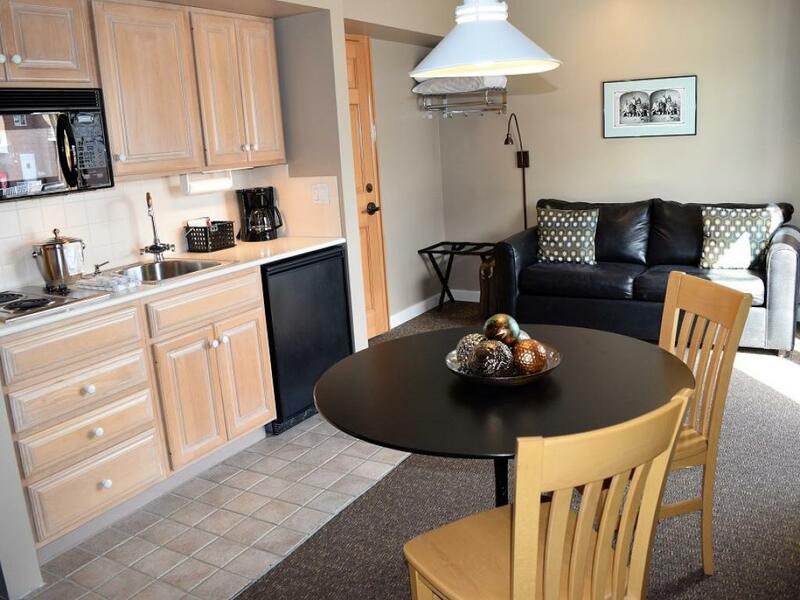 HDTV with HBO, coffee maker, & mini fridge, complimentary WIFI. Occupancy based on 2, maximum occupancy 2 adults. No pets, no smoking. Private parking. 2nd floor room (stairs required) with 1 king bed, city view. 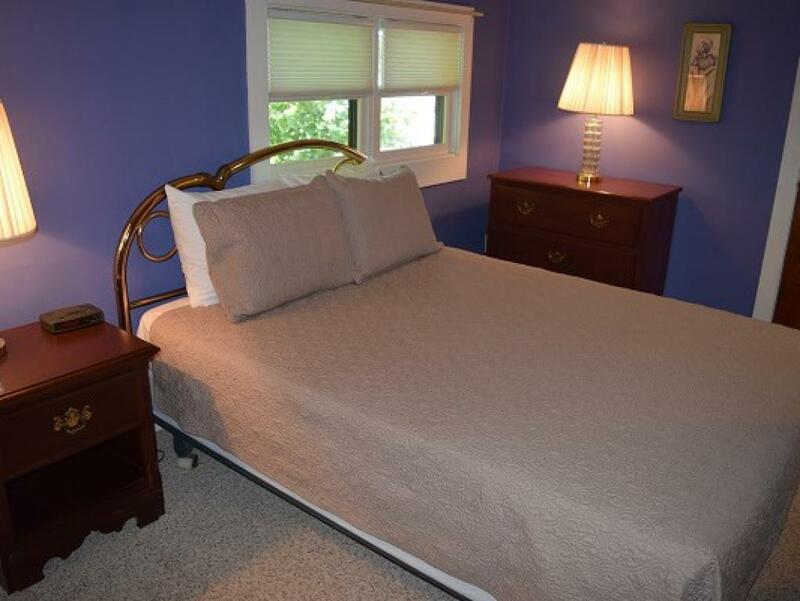 Newly renovated room includes new Serta DreamWeaver Bed. 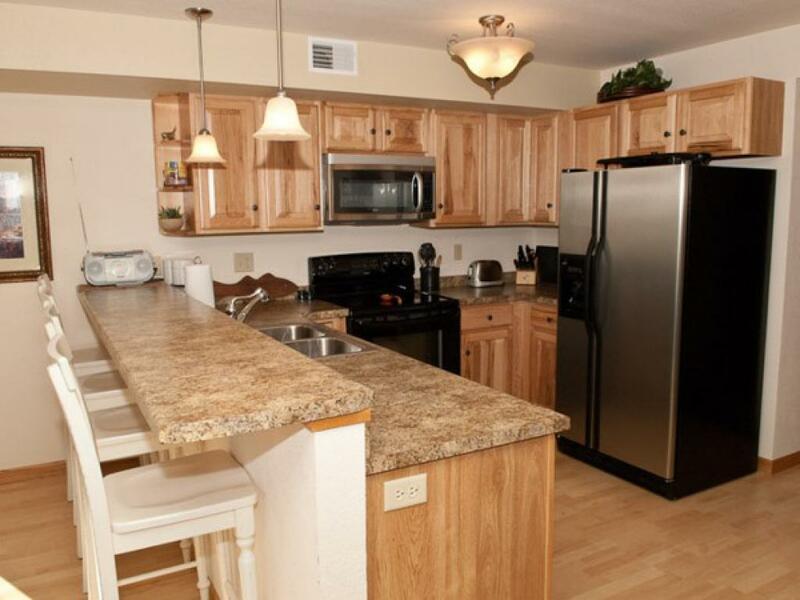 HDTV with HBO, coffee maker, & mini fridge, complimentary WIFI. Occupancy based on 2, maximum occupancy 2 adults. No pets, no smoking. Private parking. 2nd floor room (stairs required) with 1 king bed, city view. Quiet room at the end of the hallway near the south building entrance. Newly renovated room includes new Serta DreamWeaver Bed. 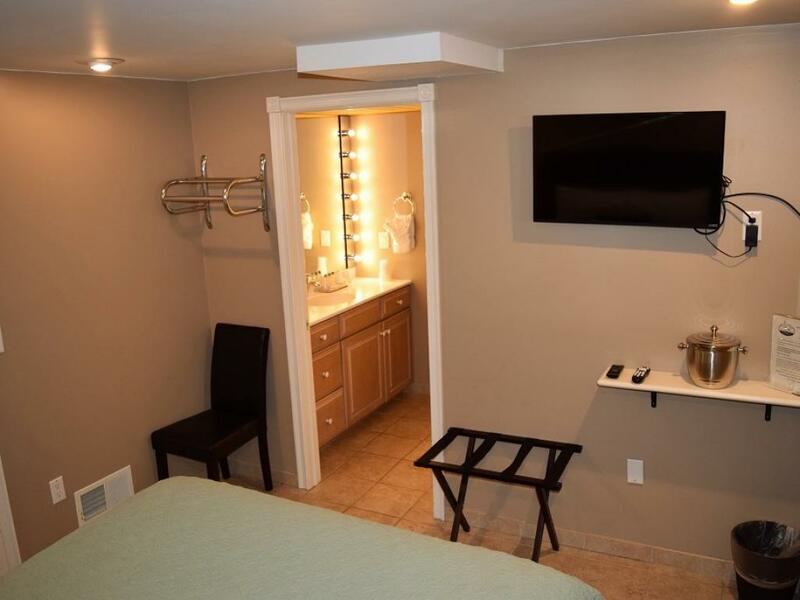 HDTV with HBO, coffee maker, & mini fridge, complimentary WIFI. Occupancy based on 2, maximum occupancy 2 adults. No pets, no smoking. Private parking. 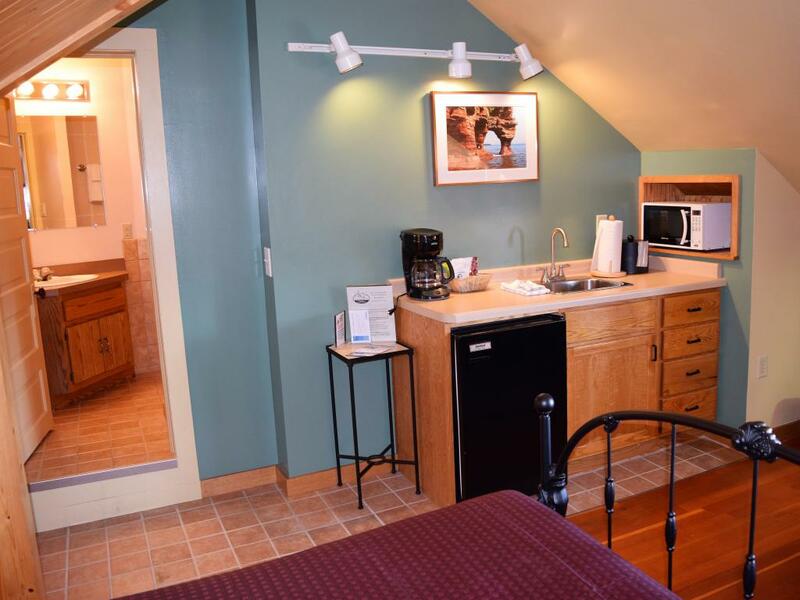 Very small, modern garden level (downstairs) suite with 1 queen bed. 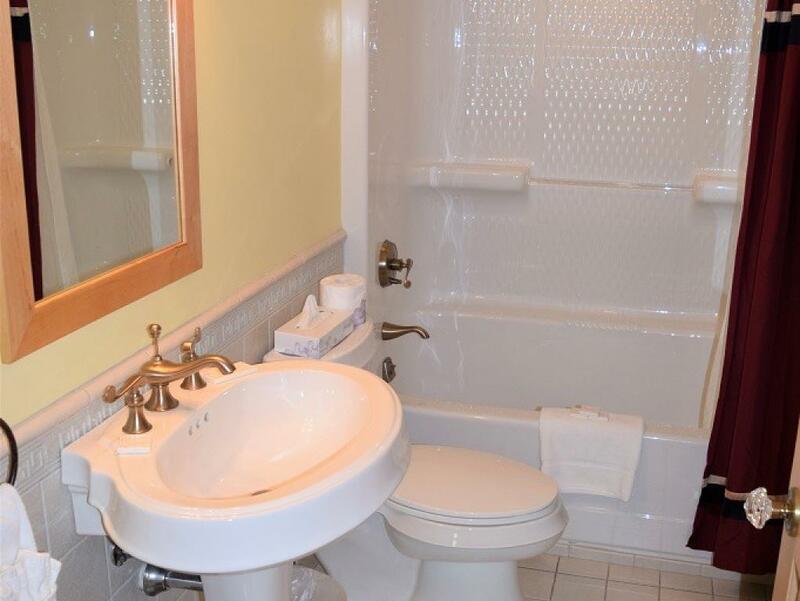 1 large, full attached bathroom. Stairs are required for this unit. 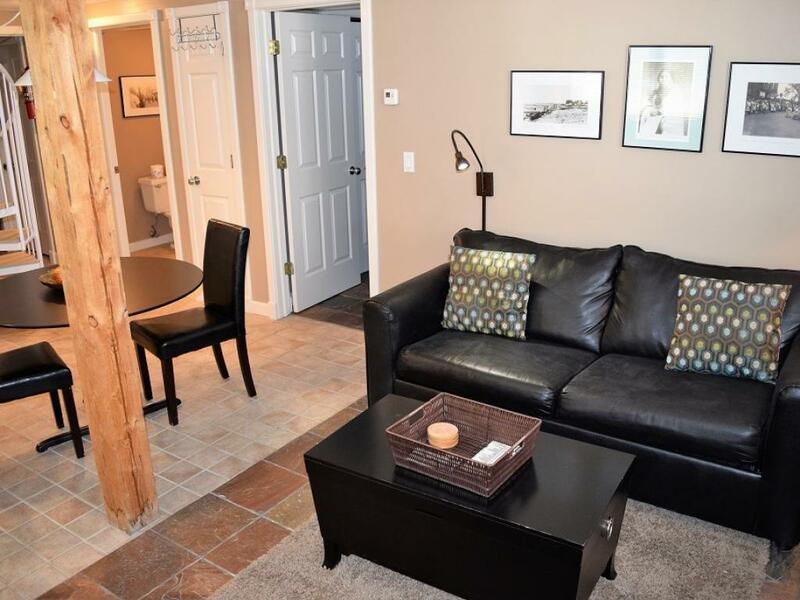 This economy room is perfect for guests looking for somewhere clean and contemporary to sleep in the heart of downtown Bayfield without the need for added bells and whistles. 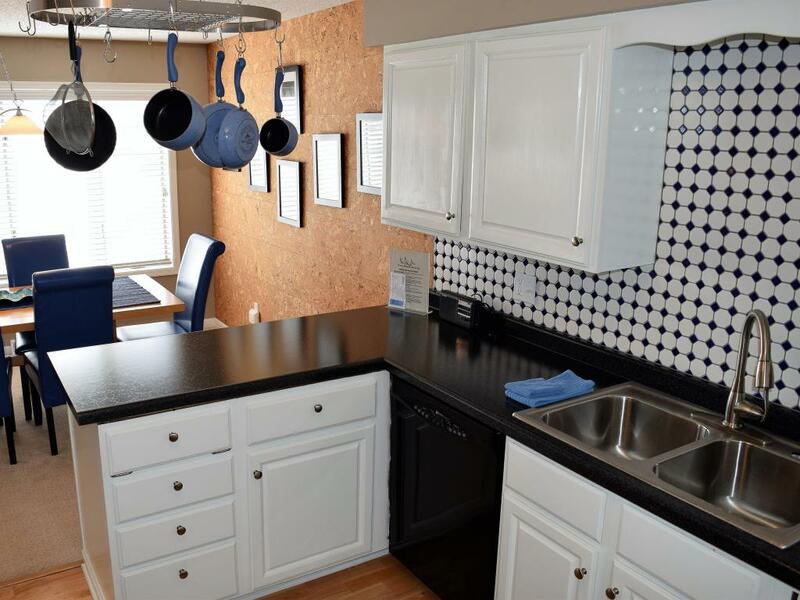 Tile flooring throughout unit. No view, 1 well window in bedroom for natural light, plus all of today's amenities (HDTV with HBO, coffee maker, mini fridge, air conditioning/heat). Garden surrounding the house offers a patio area for guests to enjoy. Private parking in back of building for 1 vehicle. No smoking, no pets. Occupancy rate based on 2 adults. Maximum 2 adults. 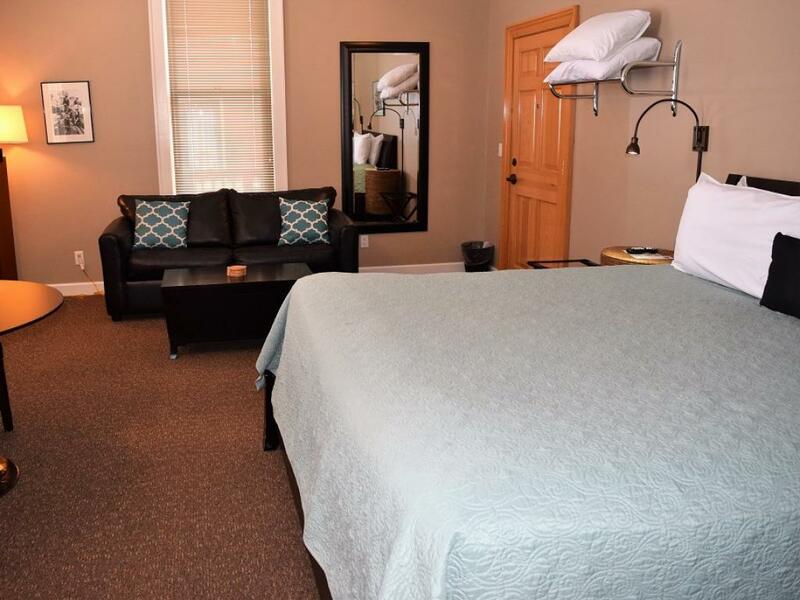 The Blue Suite is a 2-room suite located in the Victorian Isaac Wing House with a queen bed, living area, and private bath. It is on the 2nd floor of the historic Isaac Wing House and requires stairs. 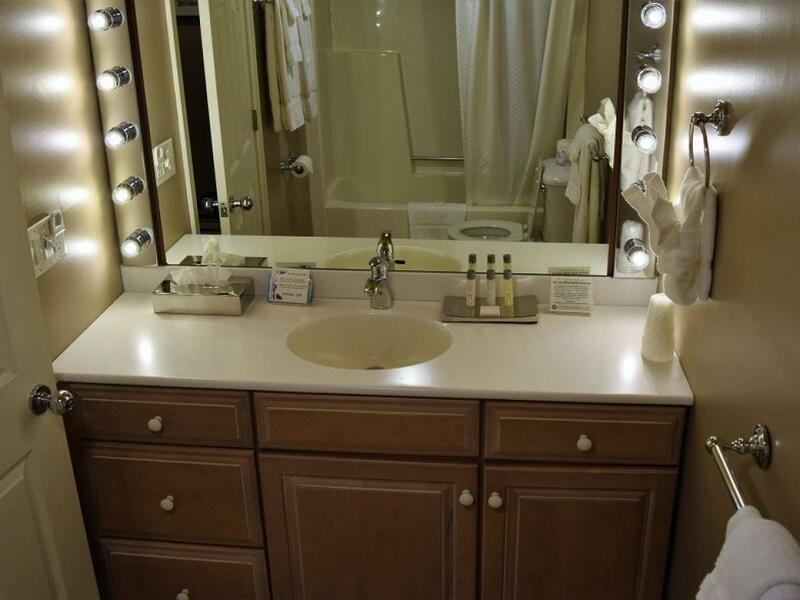 This unit features yesterday's charm with today's amenities. There is no lake view, but the windows overlook the beautiful gardens surrounding the house. 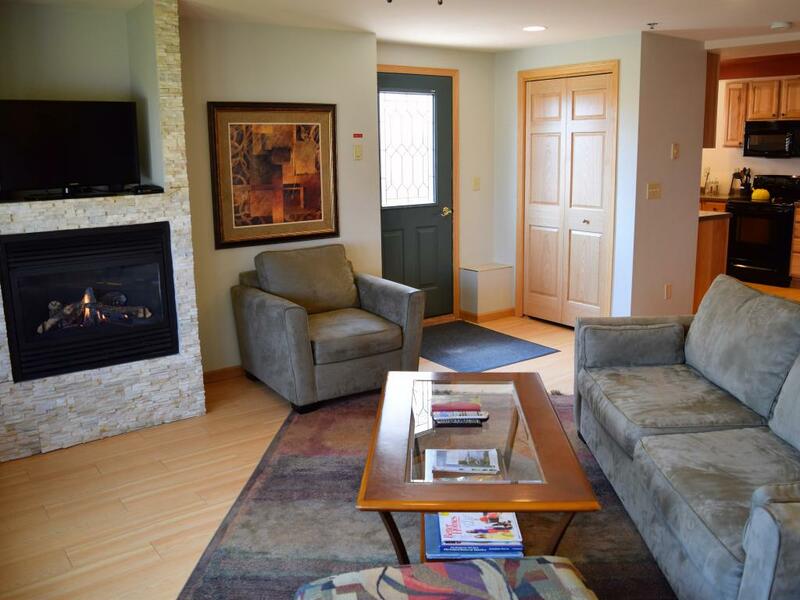 The living area has an electric fireplace and flatscreen TV. 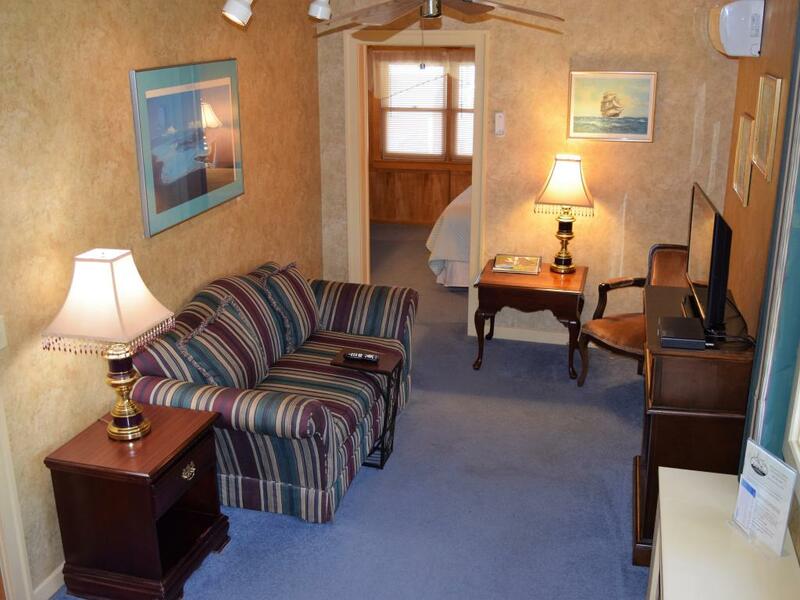 This suite also includes a mini fridge, microwave, and coffee pot. 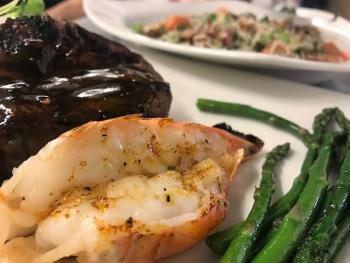 Isaac Wing House is located across the street from The Bayfield Inn. Pets are allowed with extra one-time, non-refundable fee of $25/pet! Occupancy rate is based on 2. Maximum 2 adults. Private parking for 1 vehicle. Complimentary WIFI and cable included! No smoking. The Emerald Suite is a large suite with Bayfield harbor & Lake Superior views. It is located on the 2nd floor of the historic Isaac Wing House and requires stairs. 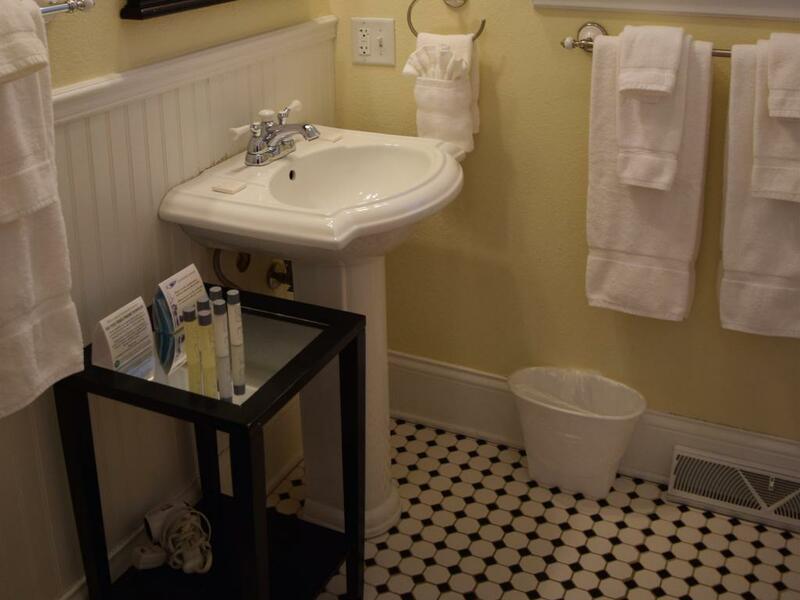 This unit features yesterday's charm with today's amenities. 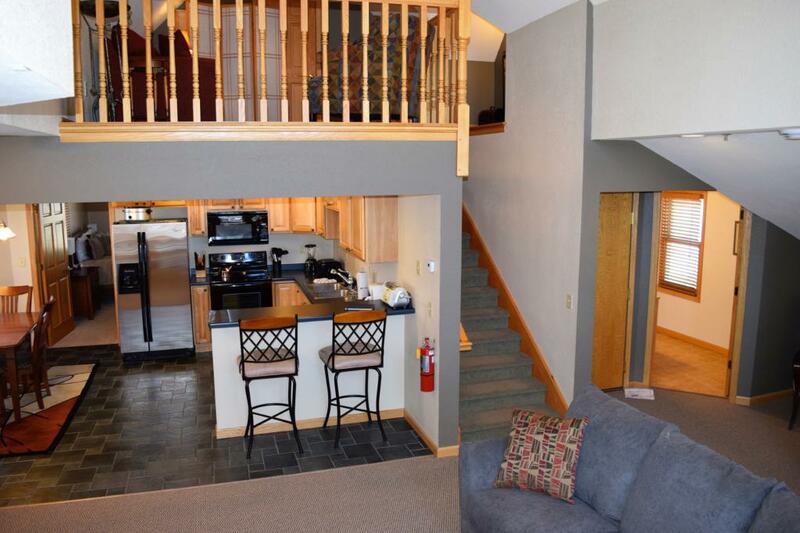 This 1 room suite has a queen bed, sitting area with electric fireplace, mini fridge, coffee pot, and 1 full private bath. 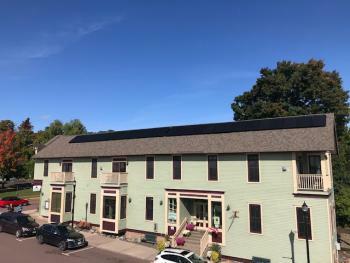 The historic Isaac Wing House is located across the street from The Bayfield Inn. 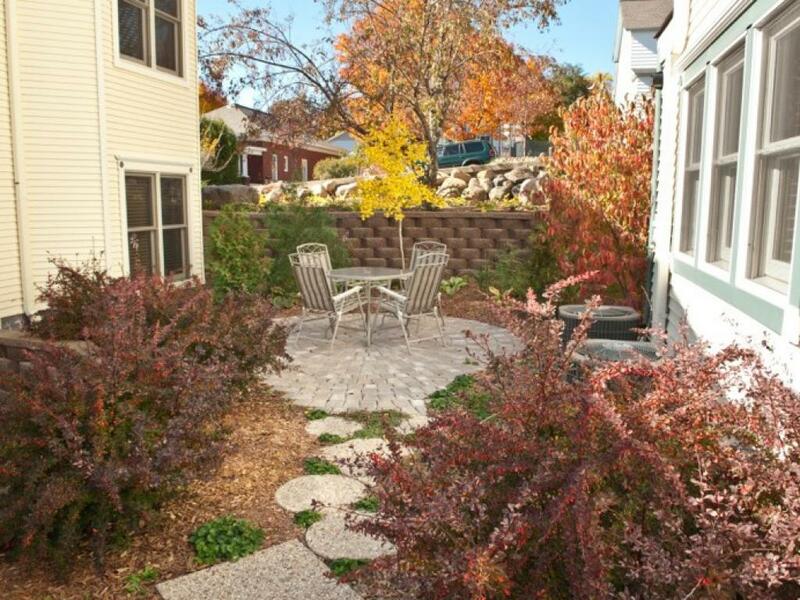 This property offers beautiful gardens surrounding the home. Pets are allowed with extra one-time, non-refundable fee of $25/pet! Occupancy rate is based on 2. Maximum 2 adults. Private parking for 1 vehicle. Complimentary WIFI and cable included! No smoking. 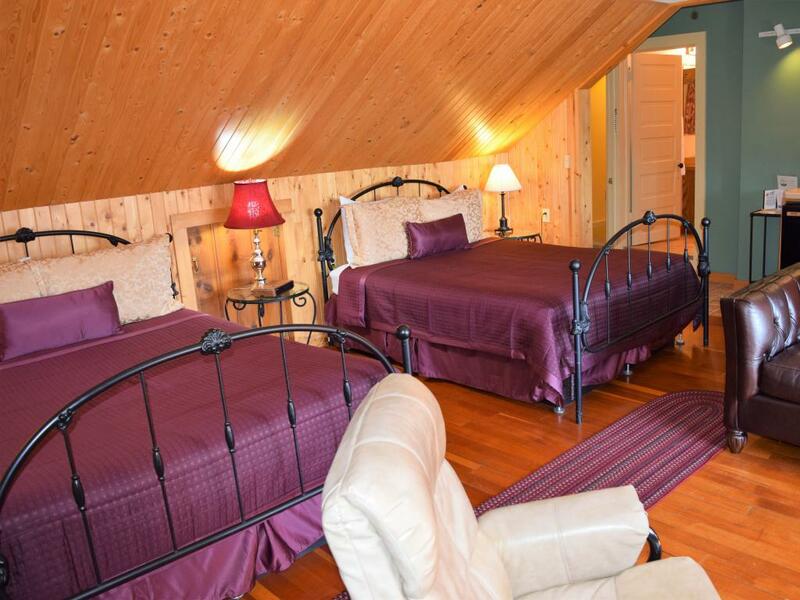 Garden-level Honeymoon Suite (stairs required) with 1 king bed. 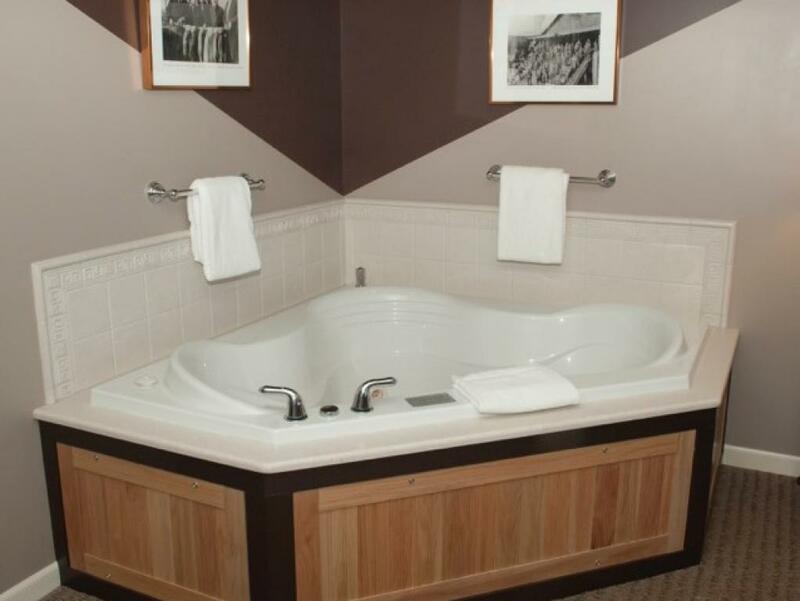 Spacious suite includes romantic gas fireplace, great lake view through large windows, and 2-person jacuzzi tub in-room. 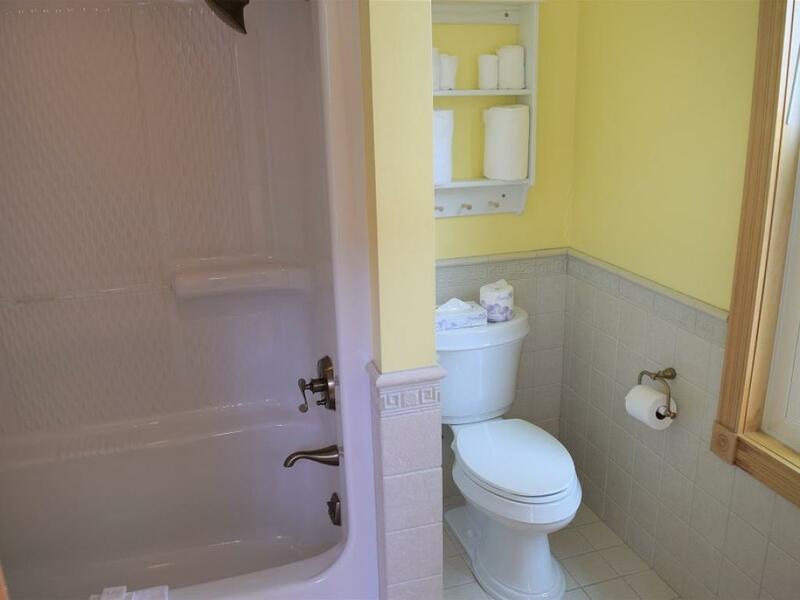 Separate bathroom with walk-in shower. 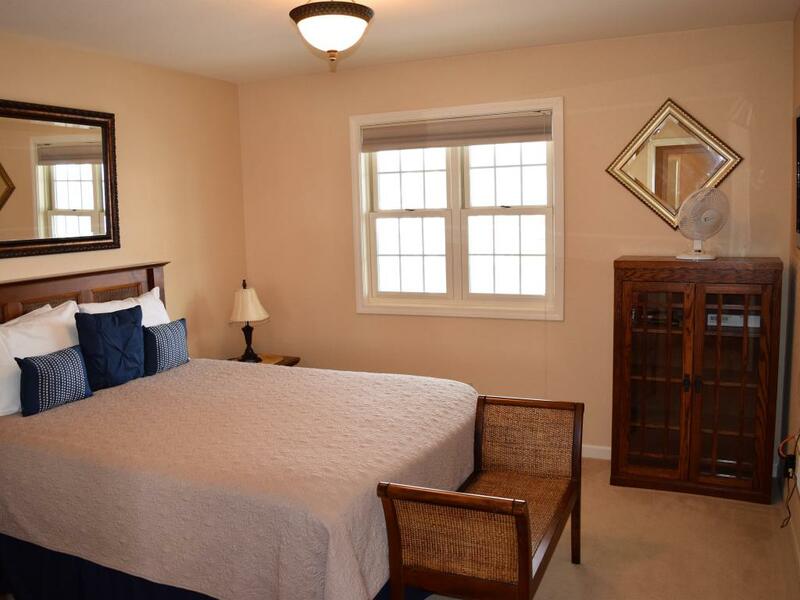 Newly renovated room includes new Serta DreamWeaver Bed. HDTV with HBO, coffee maker, & mini fridge. Complimentary WIFI. Occupancy rate based on 2 adults. Maximum 2 adults. No smoking, no pets. Private parking. 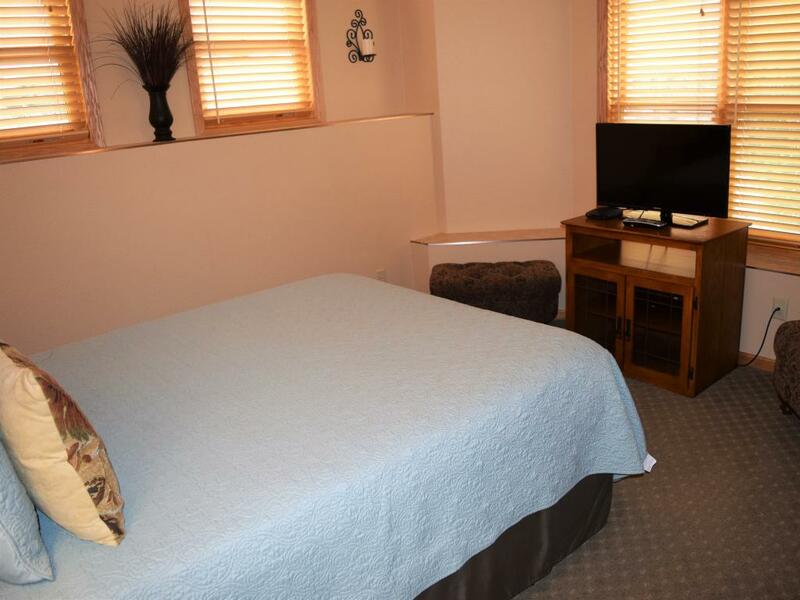 1st floor room with 1 queen bed, lakeview. 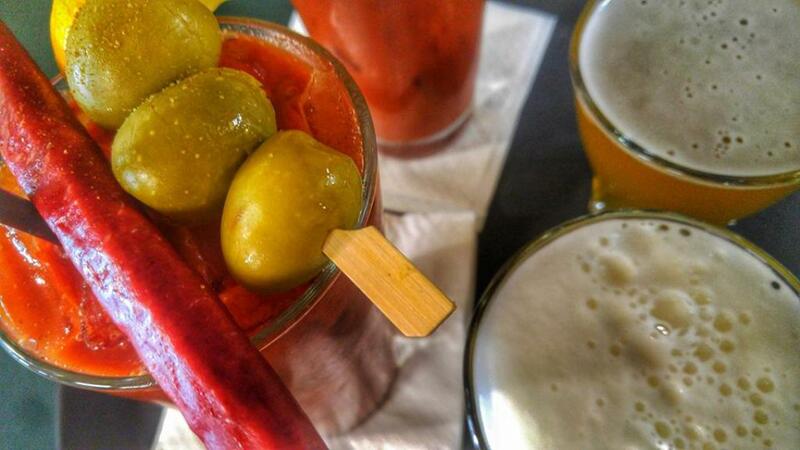 No stairs required. 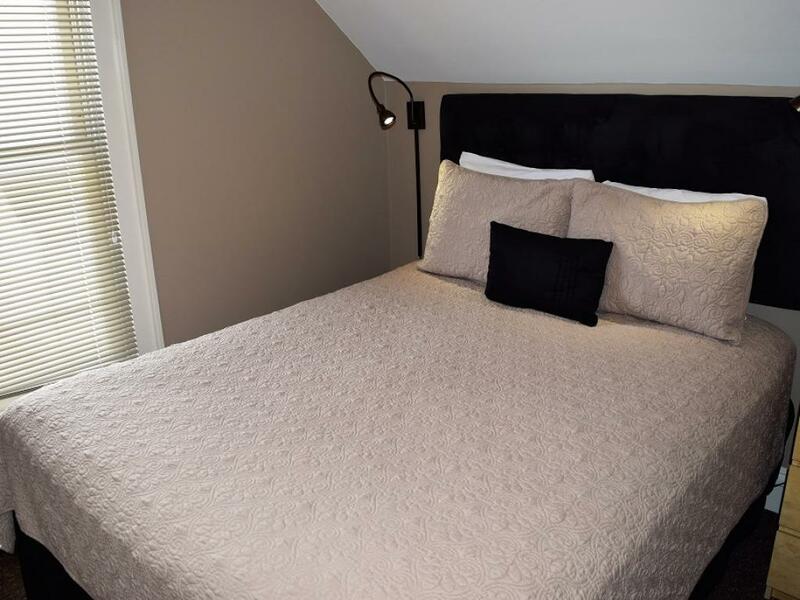 Newly renovated room includes new Serta DreamWeaver Beds. HDTV with HBO, coffee maker, & mini fridge. Complimentary WIFI. Occupancy rates based on 2 adults. Maximum 2 adults. No smoking, no pets. Private parking. 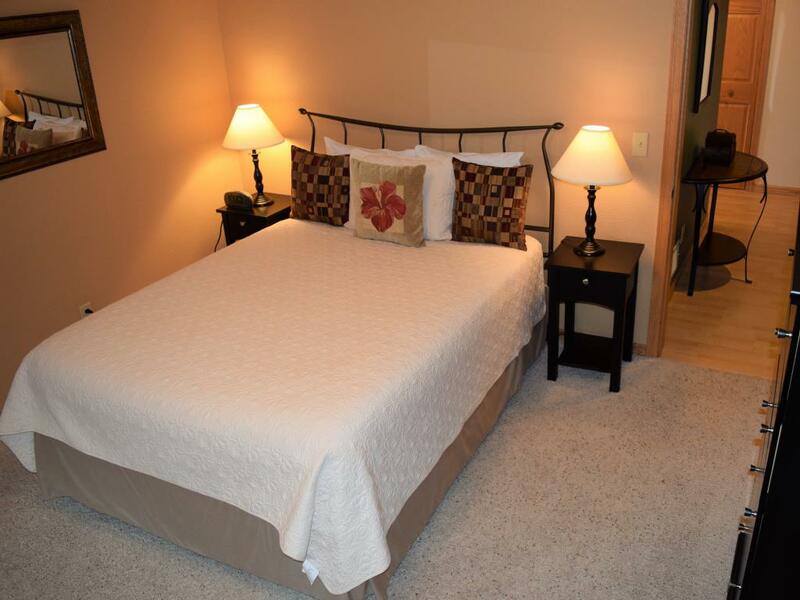 1st floor room with 1 king bed, lakeview. No stairs required. 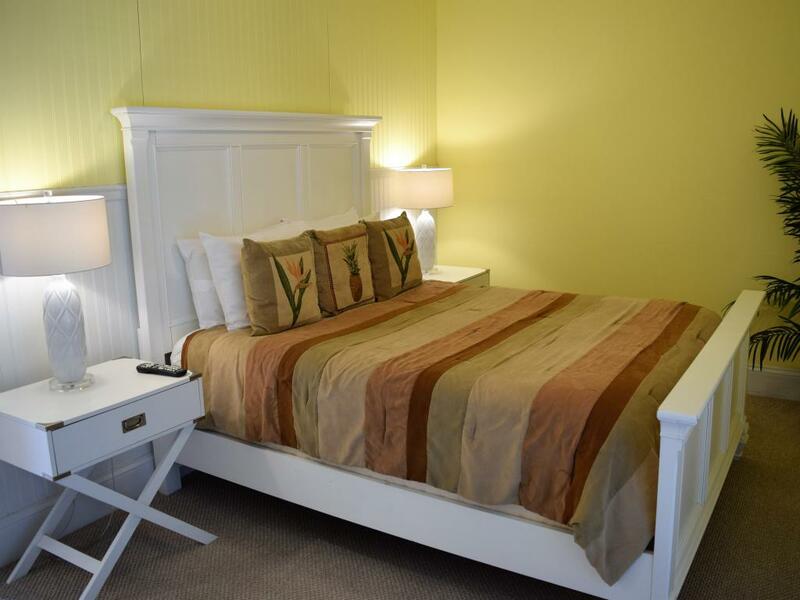 Newly renovated room includes new Serta DreamWeaver Beds. HDTV with HBO, coffee maker, & mini fridge. Complimentary WIFI. Occupancy rates based on 2 adults. Maximum 2 adults. No smoking, no pets. Private parking. 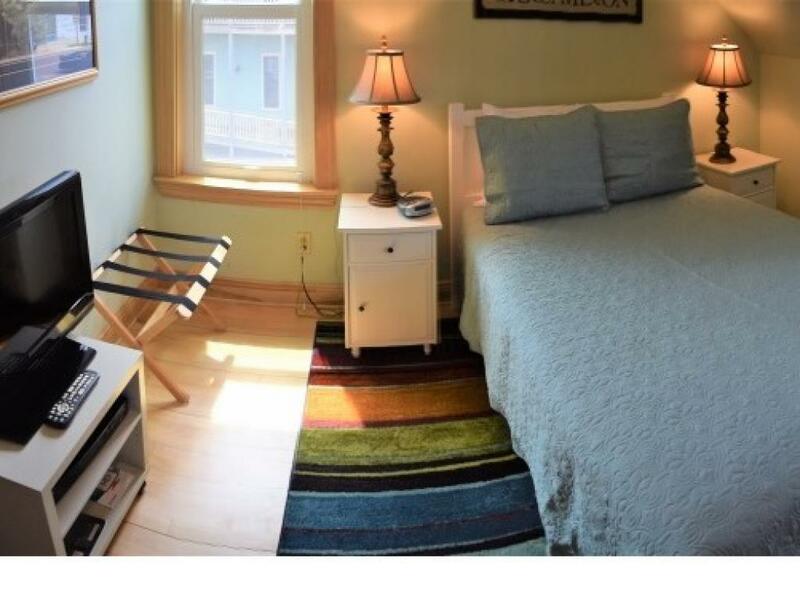 2nd floor room (stairs required) with 1 queen bed, lakeview. 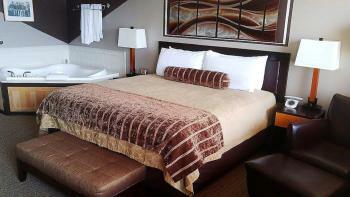 Newly renovated room includes new Serta DreamWeaver Beds. HDTV with HBO, coffee maker, & mini fridge. Complimentary WIFI. 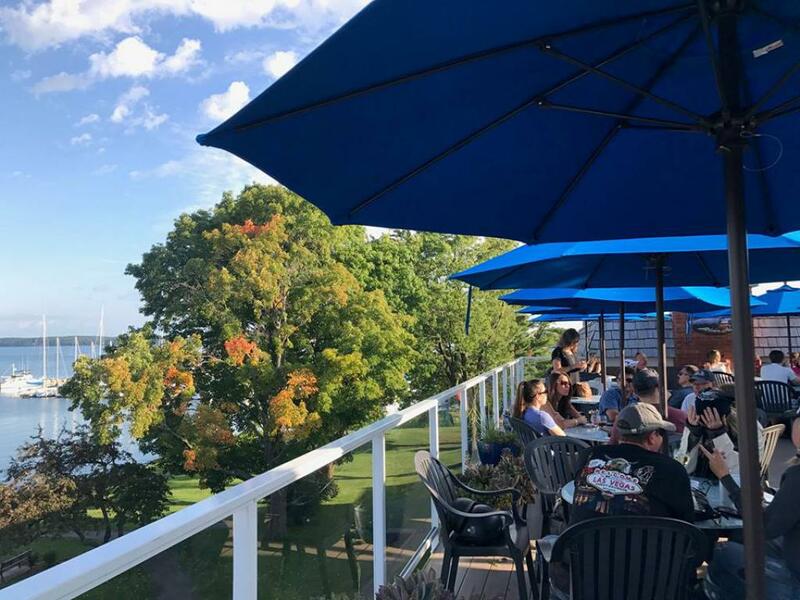 Closest room to the Deck Restaurant & Bar (live music on weekend evenings in the summer months) and it has the best lake view of our standard rooms. Occupancy rate based on 2 adults. Maximum 2 adults. No smoking, no pets. Private parking. 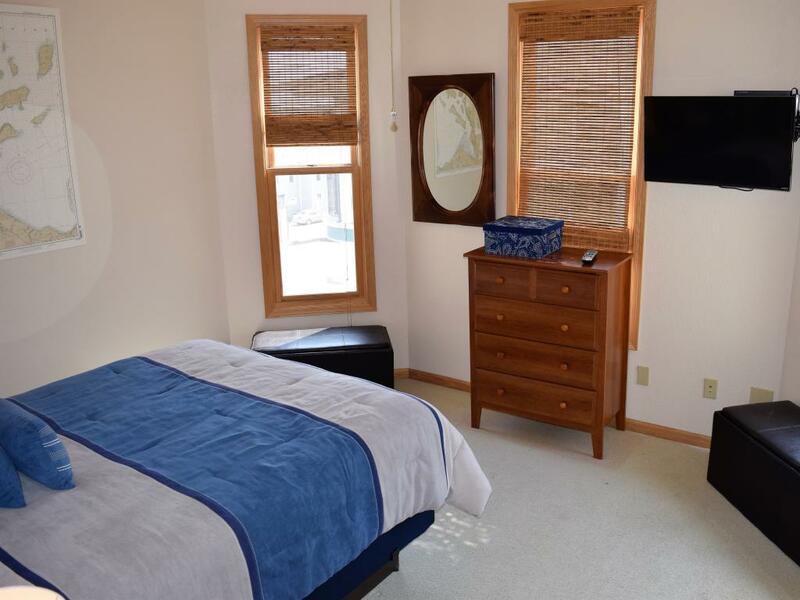 2nd floor room (stairs required) with 1 king bed, lakeview. Newly renovated room includes new Serta DreamWeaver Bed. HDTV with HBO, coffee maker, & mini fridge. Complimentary WIFI. Occupancy rate based on 2 adults. Maximum 2 adults. No smoking, no pets. Private parking. 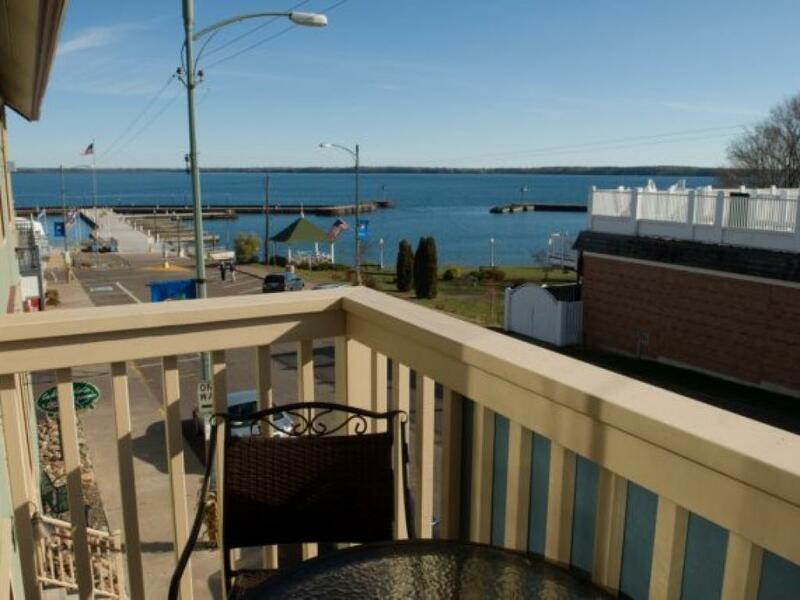 Ada O'Day Condos are located just 2 blocks from The Bayfield Inn, 2 blocks from Lake Superior and the Madeline Island Ferry Line, and 1 block from all downtown Bayfield. 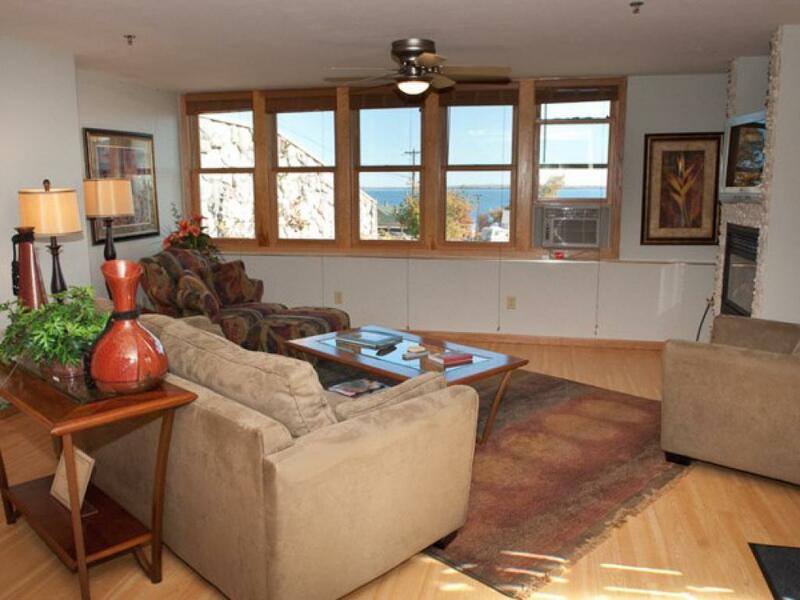 Ada O'Day 4 is a ground floor condo with partial Lake Superior views from the living room. 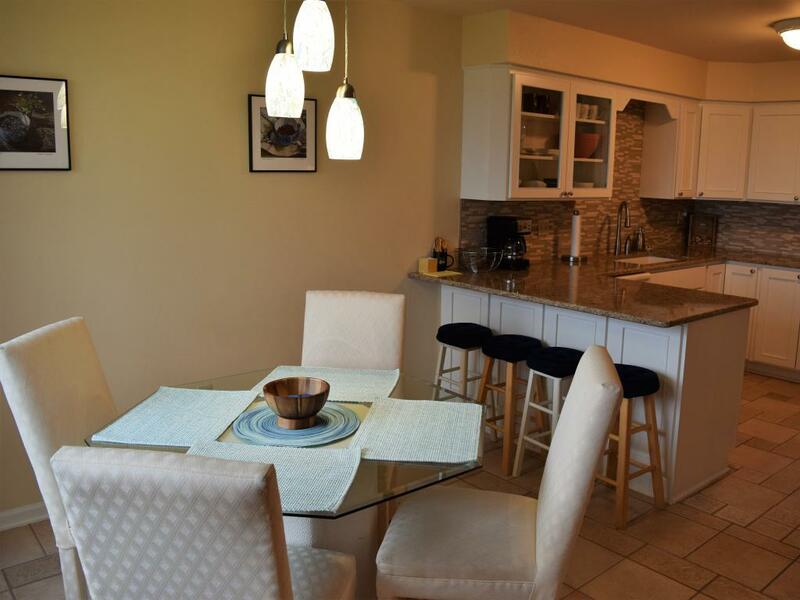 This beautiful condo has a great location and does require a very small set of steps to and from the parking lot. 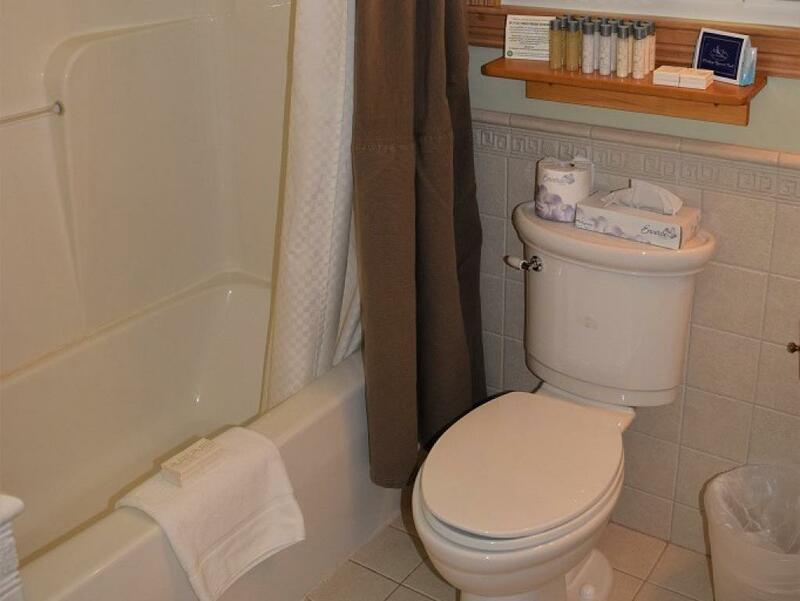 This 1 bedroom unit has 1 queen bed with attached bathroom (full bathroom with jetted tub). There is a full-size sleeper sofa in the living room. There is a 2nd 3/4 bathroom off of the living room. 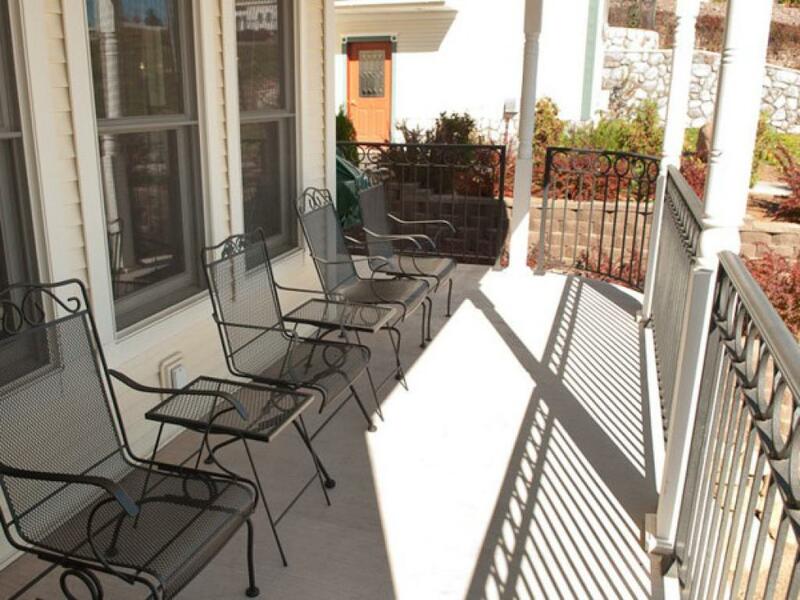 An outdoor patio is just 5 yards from the front door on side of the building. 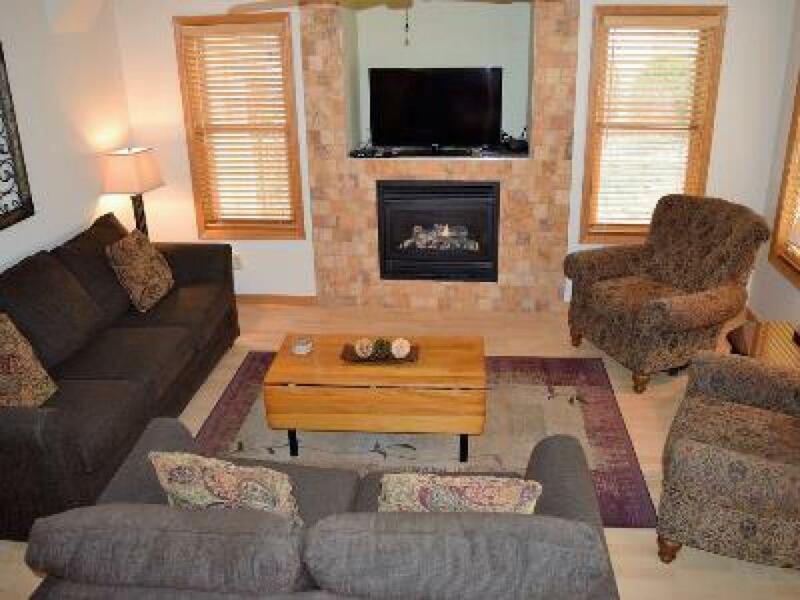 Ada O'Day 4 has a fully equipped kitchen (with bistro seating for 2), modern furnishings, and a gas fireplace in living room. Private parking for 1 vehicle. No smoking, no pets. Maximum 4 adults, children under 5 stay free! Complimentary WIFI and cable included! 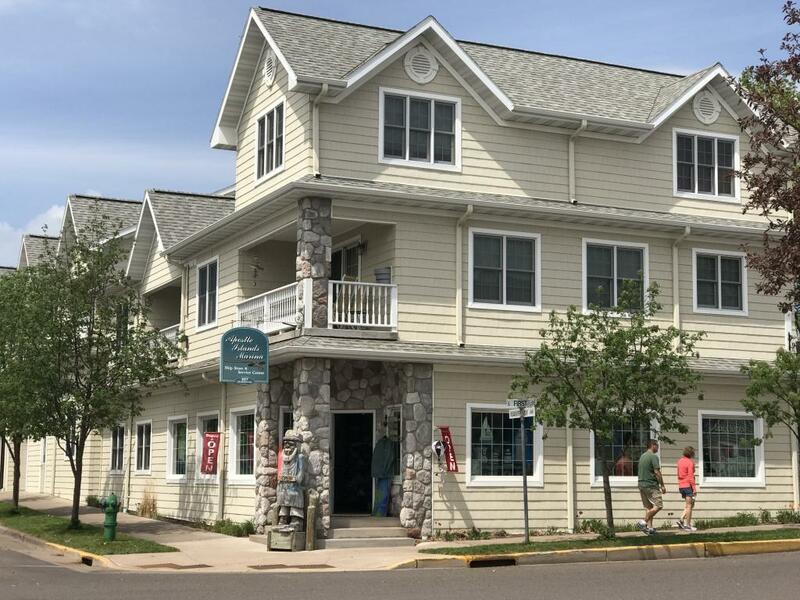 Ada O'Day Condos are located just 2 blocks from The Bayfield Inn, 2 blocks from Lake Superior and the Madeline Island Ferry Line, and 1 block from all downtown Bayfield. 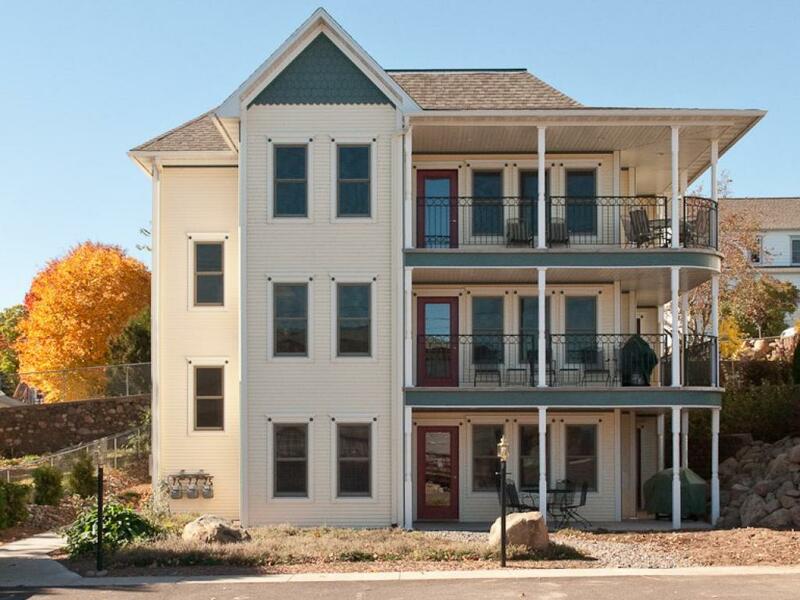 Ada O'Day 5 is a second floor unit, but no stairs are required from the street entrance, just a short walk from the private parking lot. 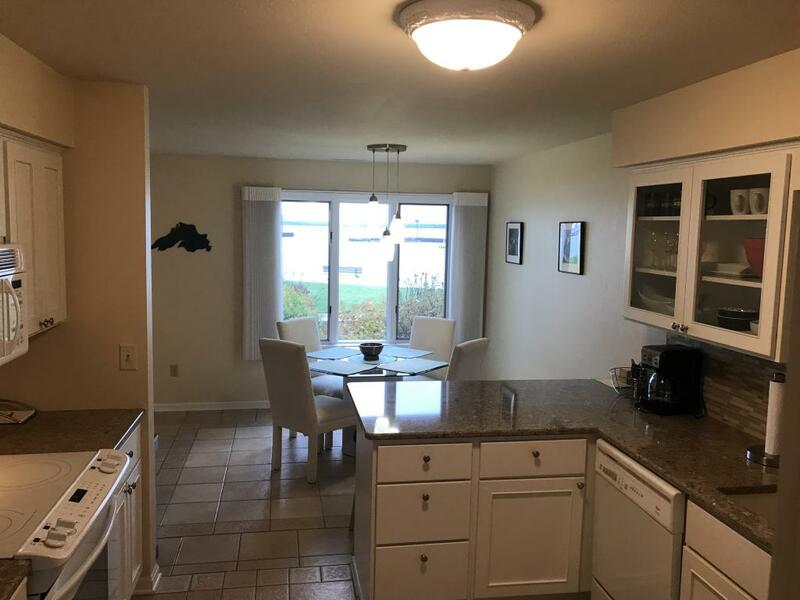 This unit has 2 bedrooms (1 queen, 1 king) and 2 bathrooms (master bedroom has attached 3/4 bathroom, 2nd full bathroom with jetted tub is off the living room area that has a brand new full-sized sofa sleeper). 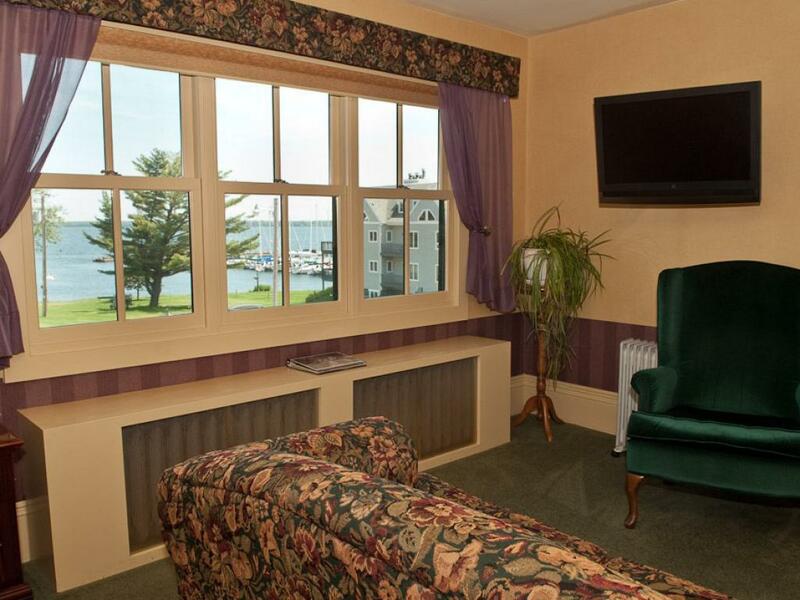 There are flat screen TVs in each guest room. 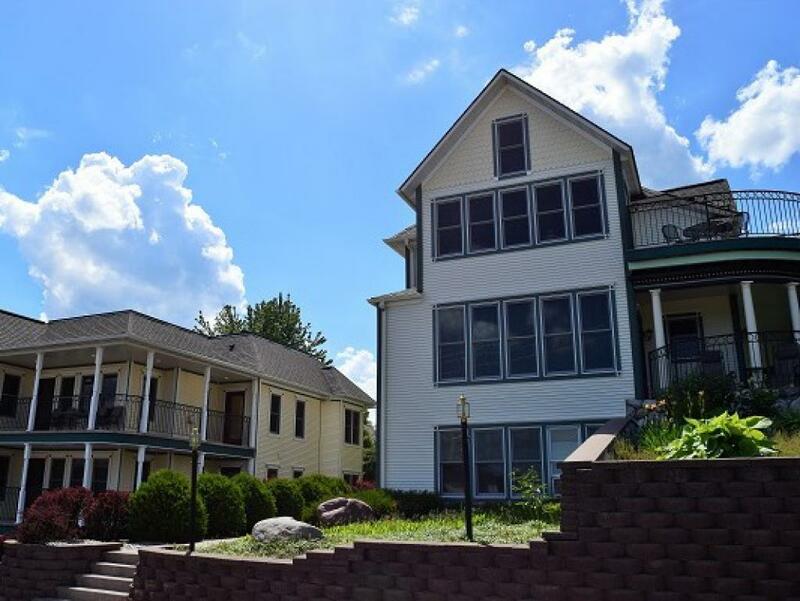 Ada O'Day 5 has a fully equipped kitchen, a gas fireplace in the living room, parking in back of building, new furnishings and is very modern. 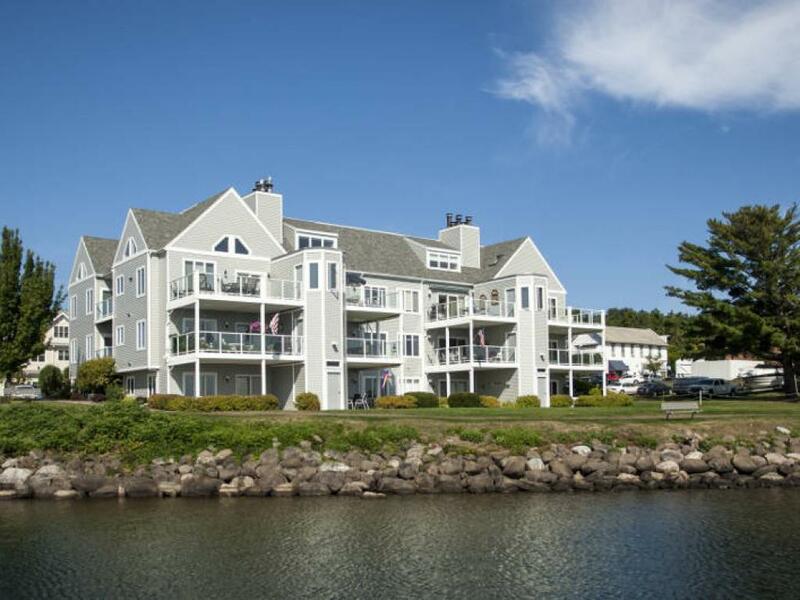 This unit has a private deck with beautiful Lake Superior views. Private parking for 1 vehicle. No smoking, no pets. Occupancy rate based on 4 people ($20/night per additional guest). Maximum 6 adults, children under 5 stay free! Complimentary WIFI and cable included! 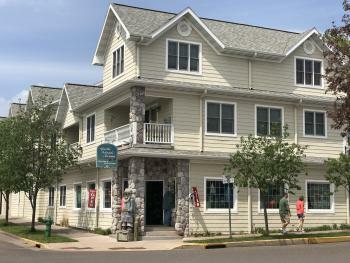 Andrew Tate Condos are located across the street from The Bayfield Inn with a convenient downtown location. 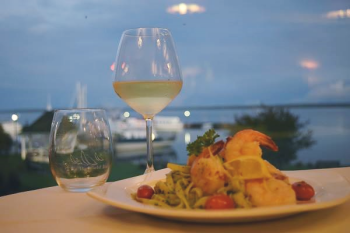 Enjoy downtown shopping, restaurants, an Apostle Island cruise, or trip to Madeline Island just steps from your accommodation. This unit is located on the 2nd floor and requires stairs. 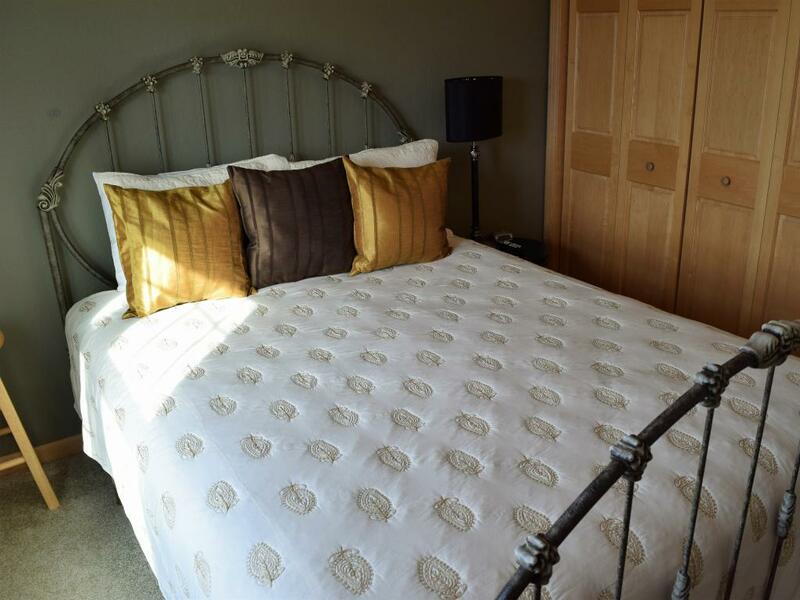 Andrew Tate 201 has 1 bedroom with a queen bed, plus a queen sofa sleeper in the living room. There are Victorian furnishings, modern amenities, a fully equipped kitchen, gas fireplace, & private deck with a great Lake Superior view. 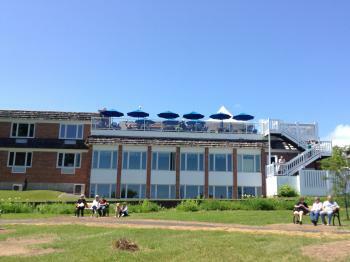 Enjoy live music next door on The Bayfield Inn's rooftop deck back on weekends in summer from your own private deck! (Potential for Noise) Private parking for 1 vehicle. No smoking, no pets. Occupancy rate based on 2 people ($20/night per additional guest). Maximum 4 adults, children under 5 stay free! Complimentary WIFI and cable included! 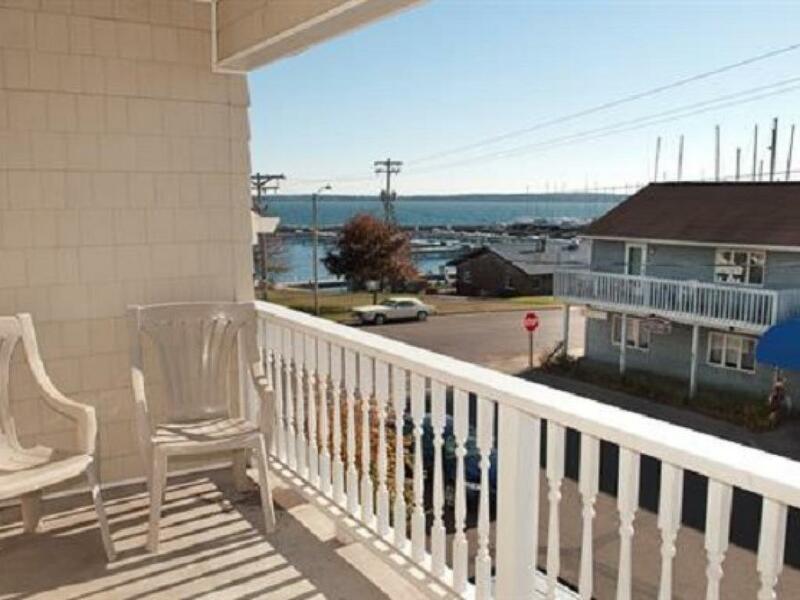 This beautiful 2-bedroom, 1-bath condominium is located downtown across the street from the main Bayfield Inn, right in the hot seat of Bayfield's downtown nightlife (Potential for Noise). 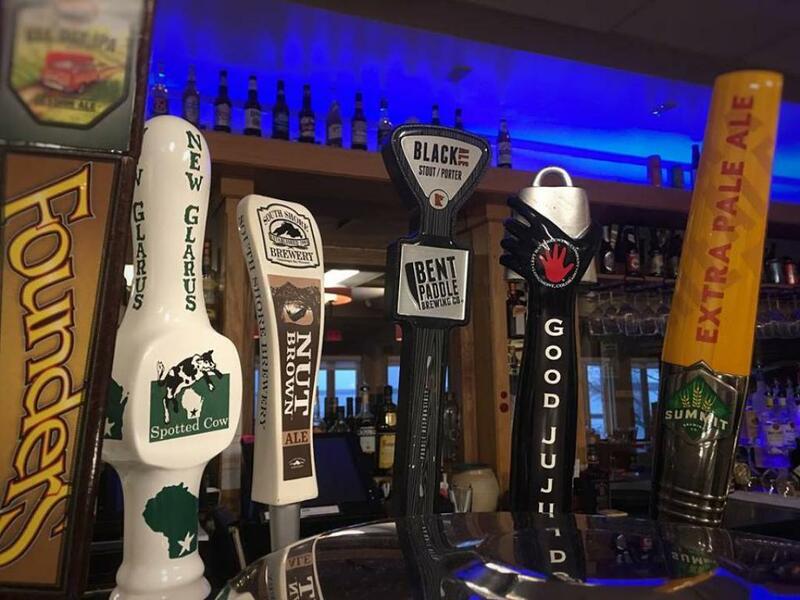 Enjoy downtown shopping, restaurants, an Apostle Island cruise, or trip to Madeline Island just steps from your accommodation. 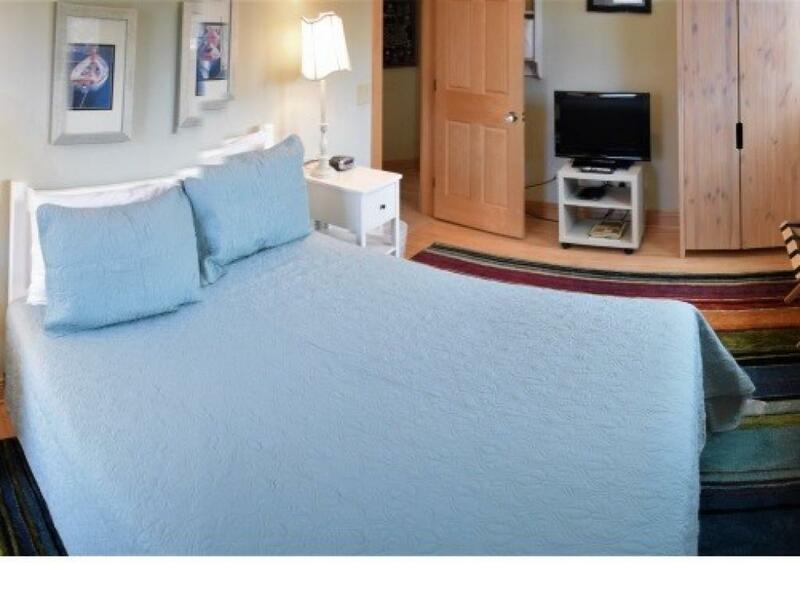 1 queen bed in master bedroom, 2 twin-sized beds in 2nd bedroom + full-sized sleeper sofa in living room. 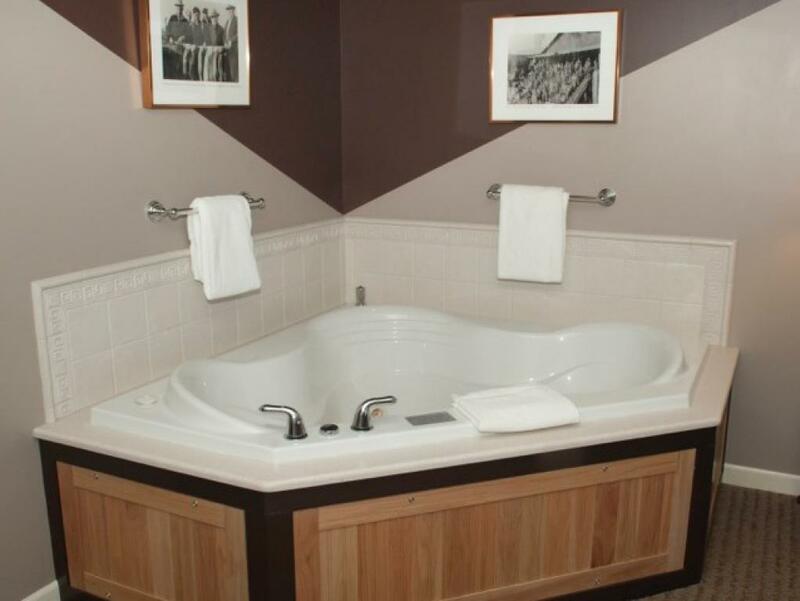 1 full bathroom between each private guest room with jetted tub. 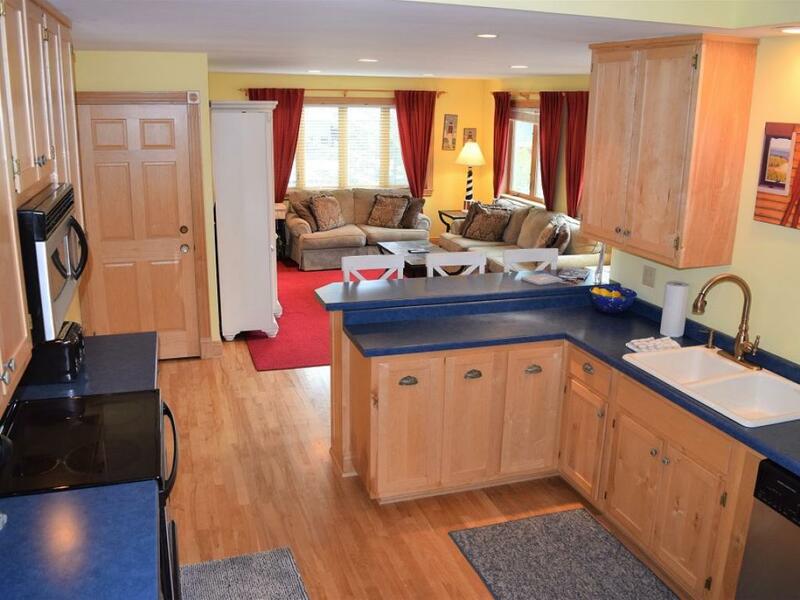 Full kitchen; kitchen seating; gas fireplace in living room. 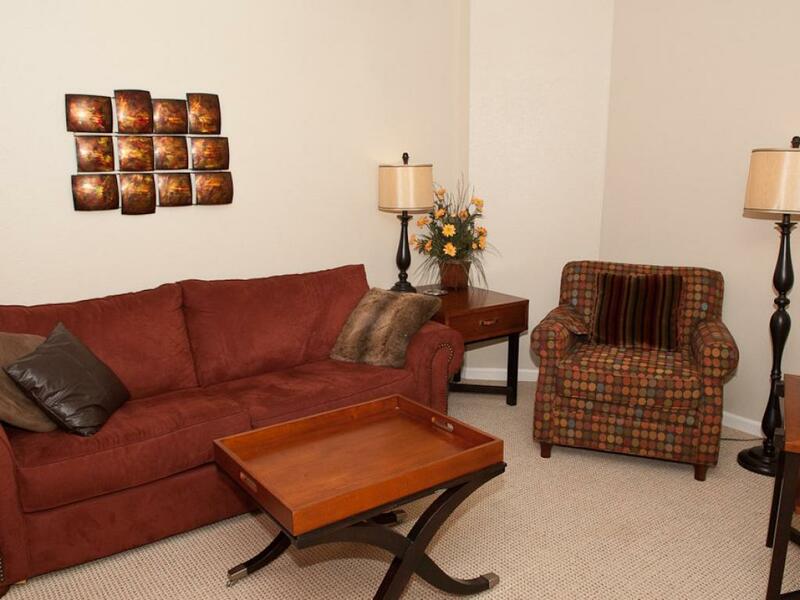 HDTV with HBO, complimentary WIFI, air conditioning, heat. 2nd floor with elevator access. 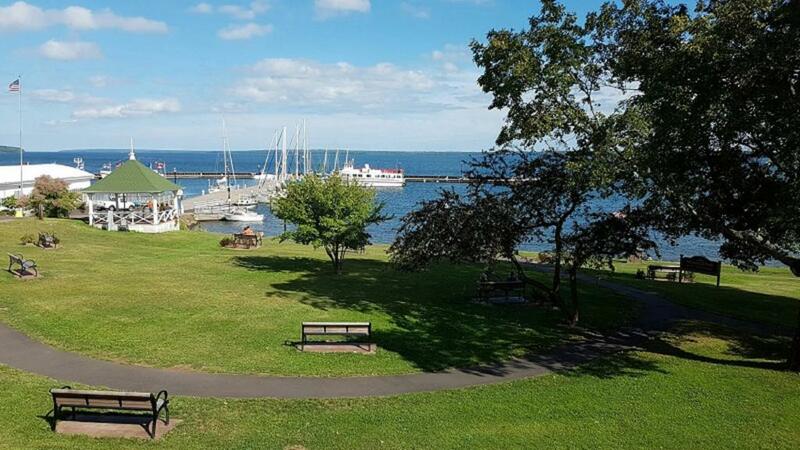 View of the Bayfield marina from the private deck off of the living room. Private parking for 1 vehicle. No smoking, no pets. Occupancy rate based on 4 people ($20/night per additional guest). Maximum 6 adults, children under 5 stay free! 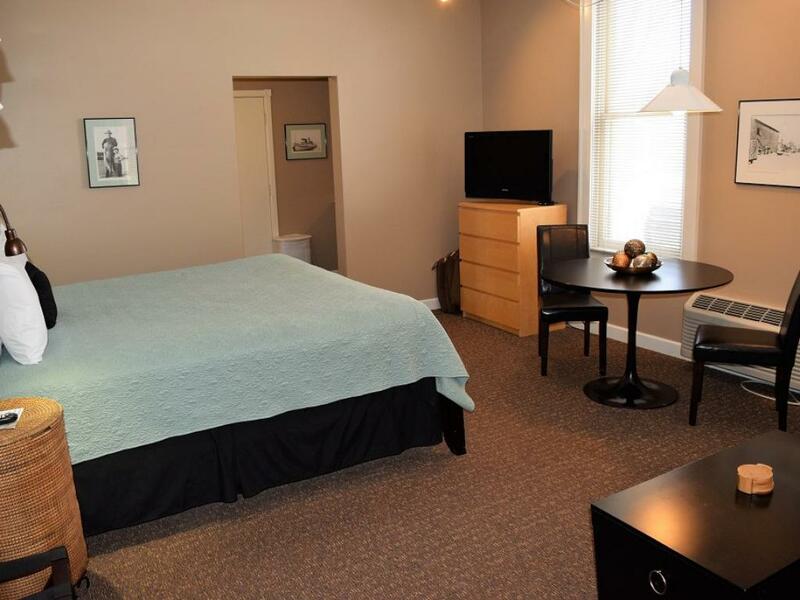 1st floor room (no stairs required) with 2 double beds, city view. Newly renovated room includes new Serta DreamWeaver Beds. 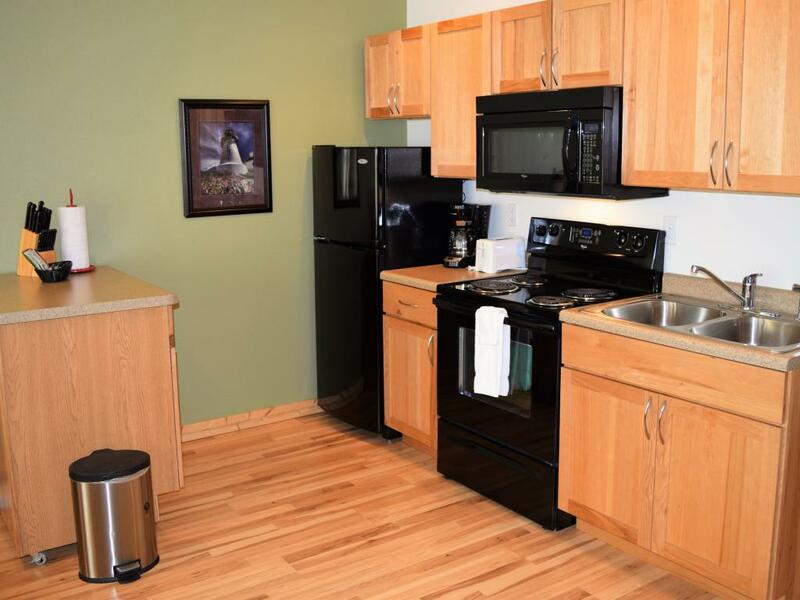 HDTV with HBO, coffee maker, & mini fridge, complimentary WIFI. Maximum 4 adults, occupancy rate based on 2 adults ($15/per extra guest). Children under 5 stay free. No pets, no smoking. Private parking. 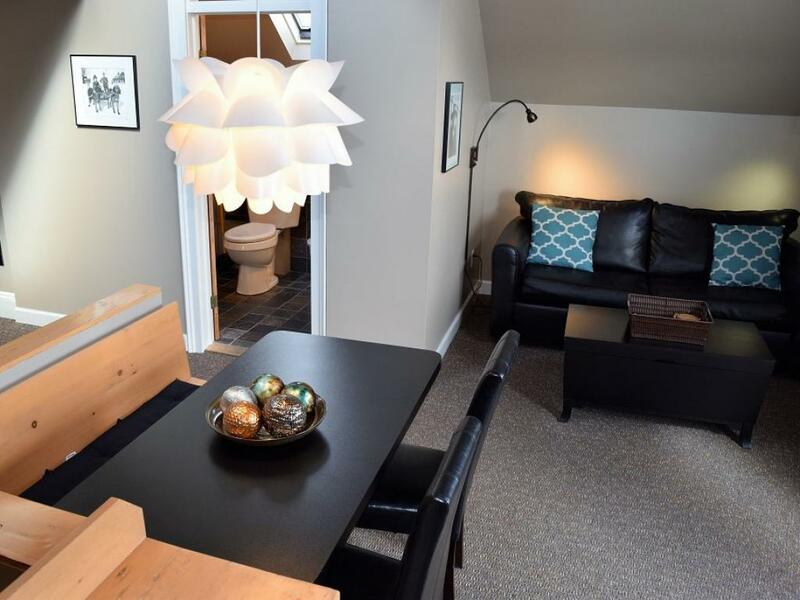 1st floor room (no stairs required) with 2 full beds, city view. Quiet room at the end of the hallway near south entrance to the building. 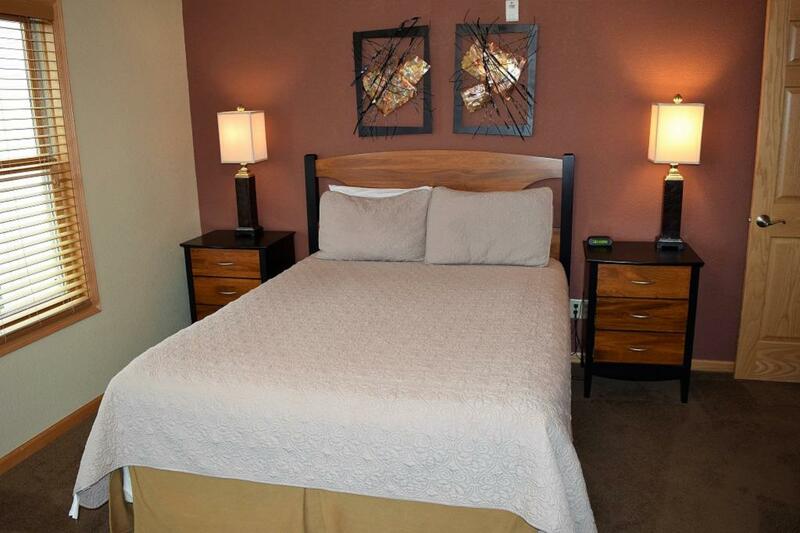 Newly renovated room includes new Serta DreamWeaver Beds. 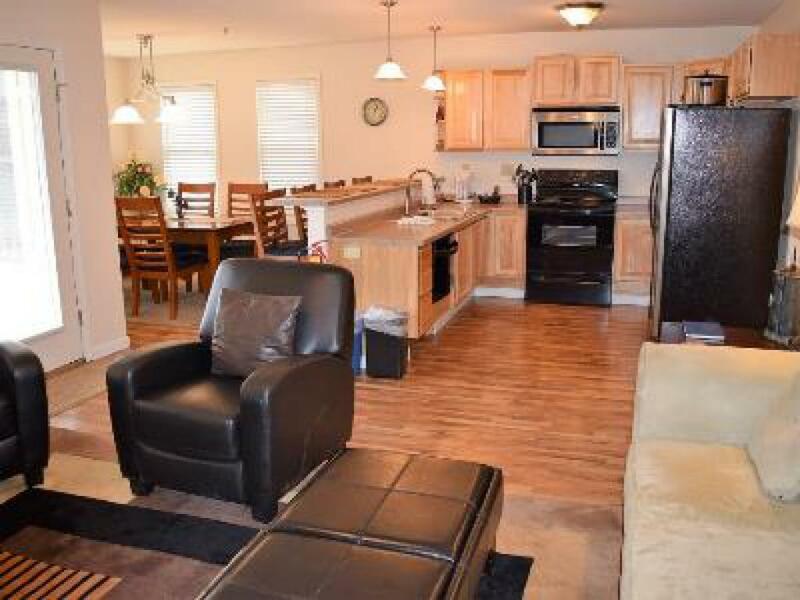 HDTV with HBO, coffee maker, & mini fridge, complimentary WIFI. Maximum 4 adults, occupancy rate based on 2 adults ($15/per extra guest). Children under 5 stay free. No pets, no smoking. Private parking. 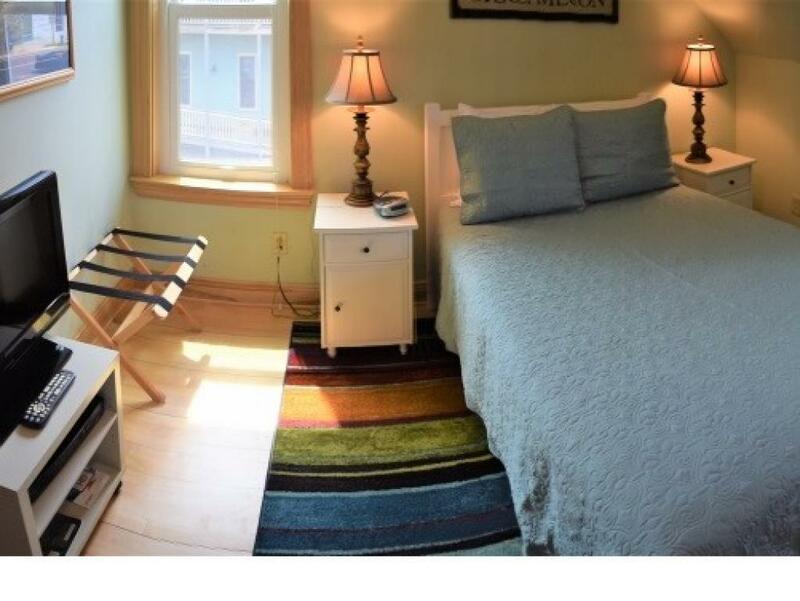 2nd floor room (stairs required) with 2 full beds, city view. 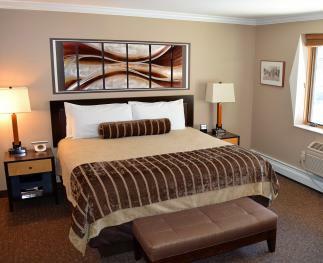 Newly renovated room includes new Serta DreamWeaver Beds. 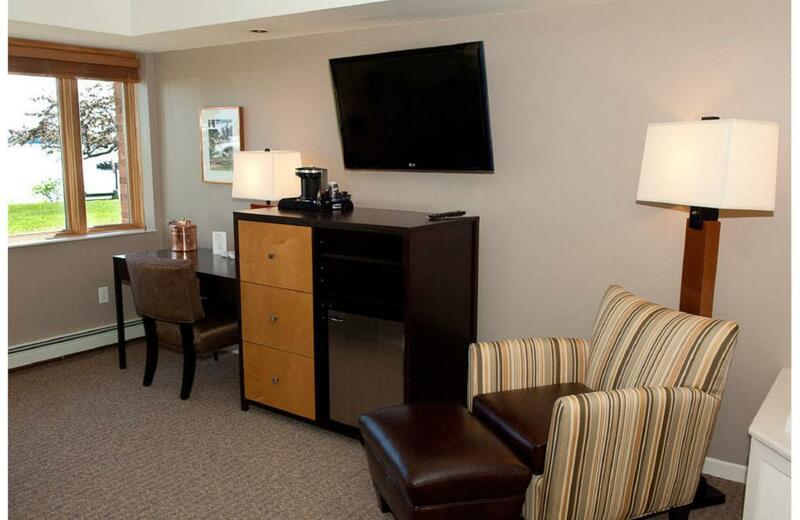 HDTV with HBO, coffee maker, & mini fridge, complimentary WIFI. Occupancy based on 2. 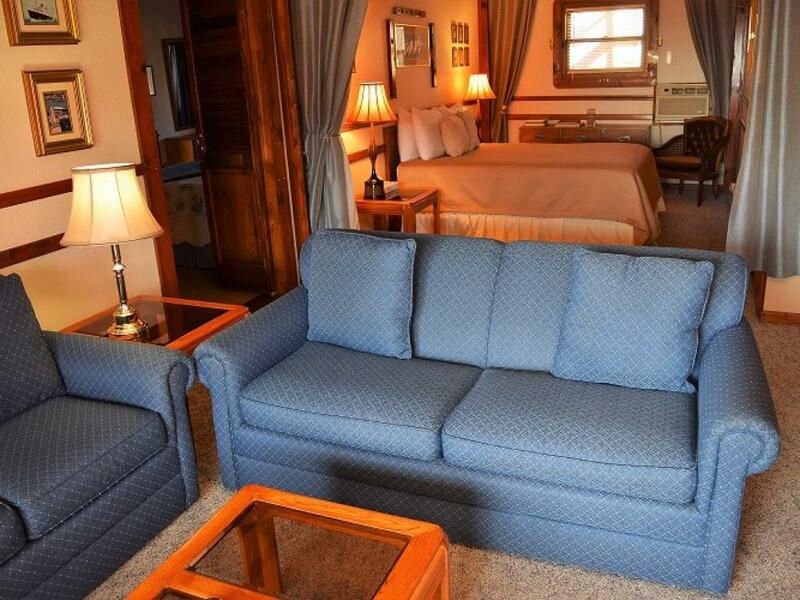 Maximum 4 adults, occupancy rate based on 2 adults ($15/per extra guest). Children under 5 stay free. No pets, no smoking. Private parking. 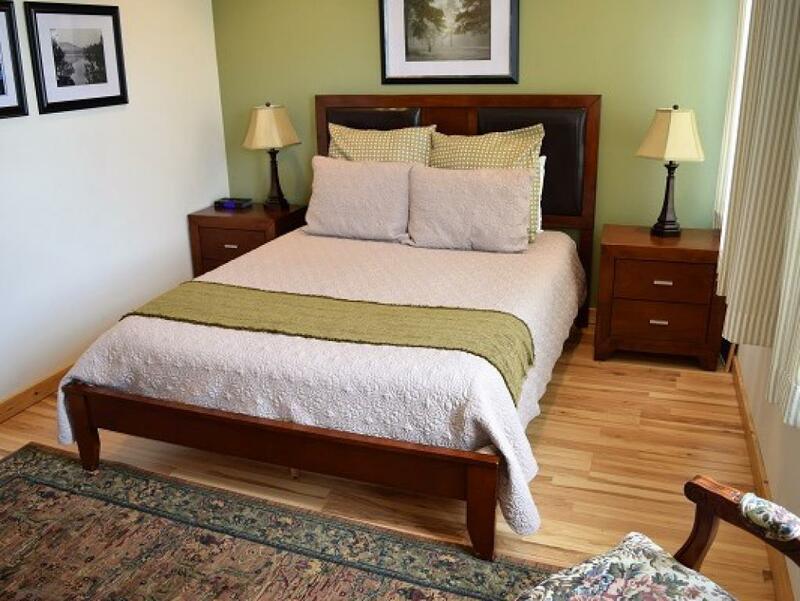 Very modern, smaller 1st floor suite (a few stairs required onto deck) with 1 bedroom (1 king bed), plus full-sized sofa sleeper in the living area attached to the bedroom. 1 full bathroom. 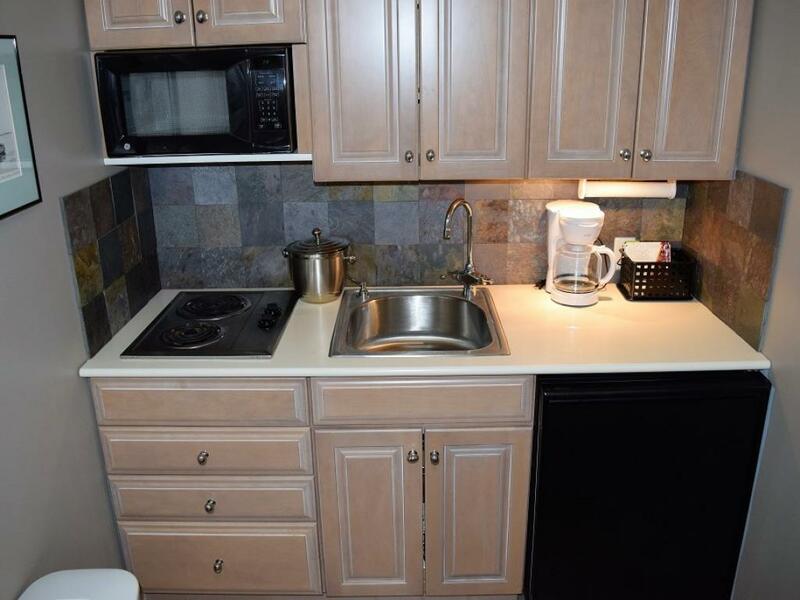 Kitchenette (mini fridge, microwave, sink, dishes, stove top burners, coffee pot). 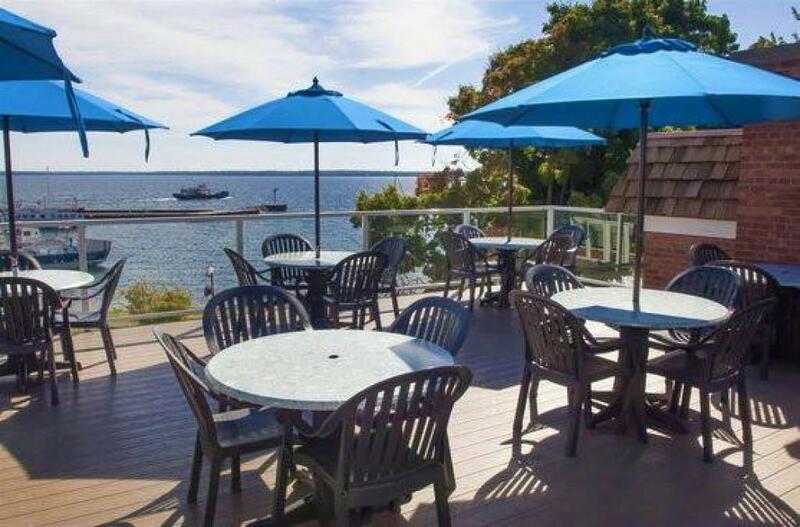 Great private deck with lake views and seating for 2-4 people. Located across the street from the main Inn. Private parking in back of building for 1 vehicle. No smoking, no pets. 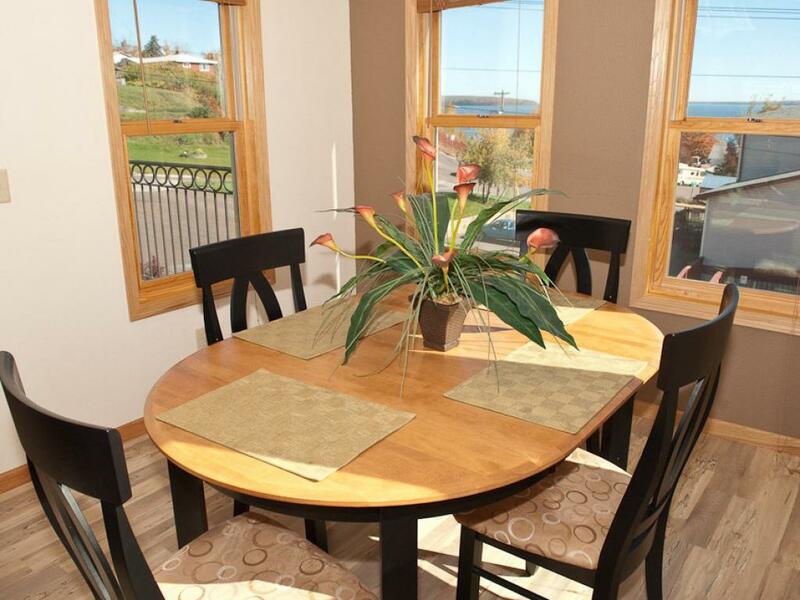 Maximum 4 adults, occupancy rate based on 2 adults (+$20/per extra guest). Children under 5 stay free. Complimentary WIFI and cable included! 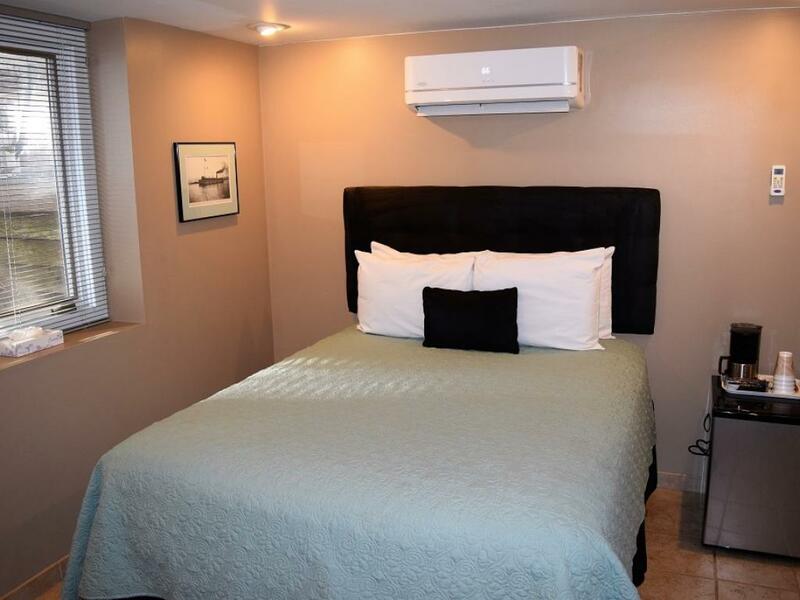 Very modern, large 1st floor suite (a few stairs required into building) with 1 bedroom (1 king bed), plus full sofa sleeper in the living area attached to the bedroom. 1 full bathroom. 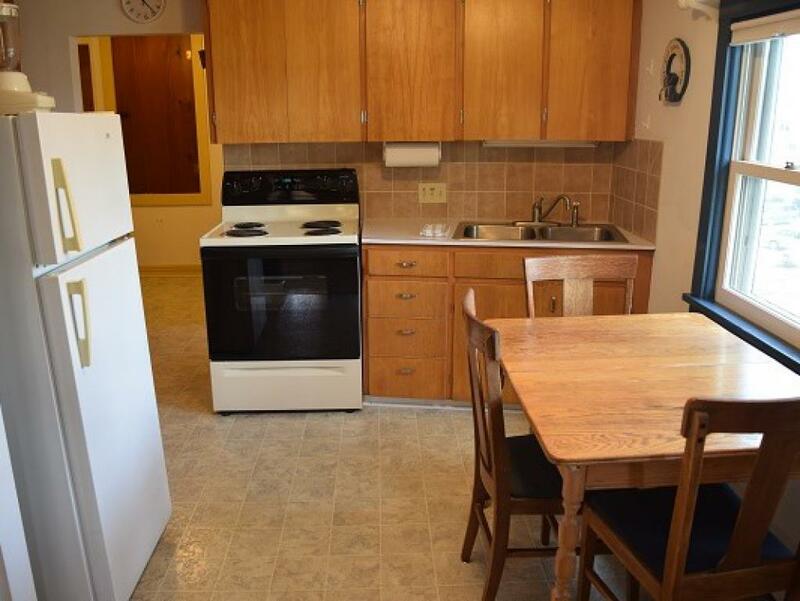 Kitchenette (mini fridge, microwave, sink, dishes, stove top burners, coffee pot). 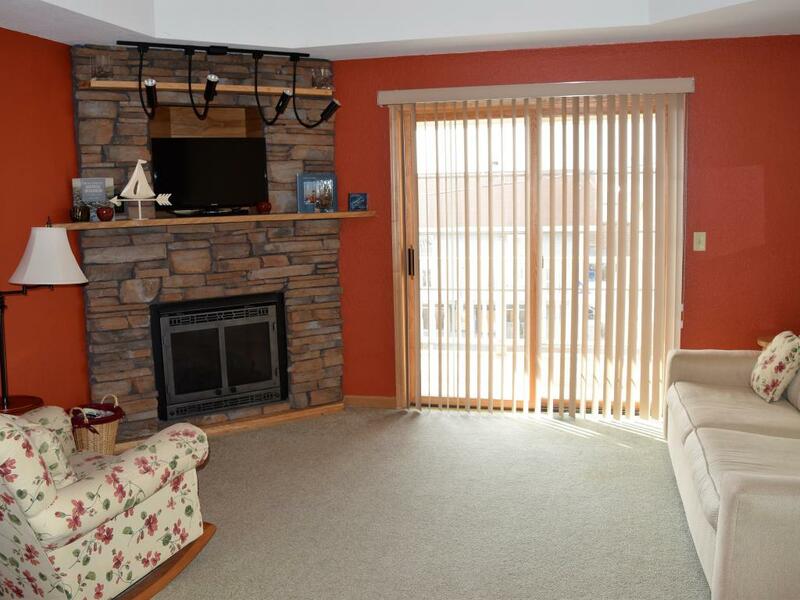 No lake view from windows, but lots of natural light. Great private deck with peaks of the lake setup for 2-4 people. 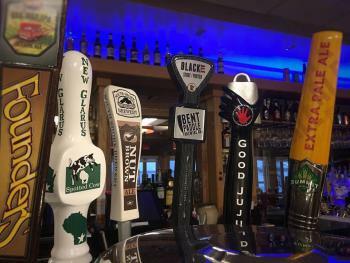 Located across the street from the main Inn. Private parking in back of building for 1 vehicle. No smoking, no pets. 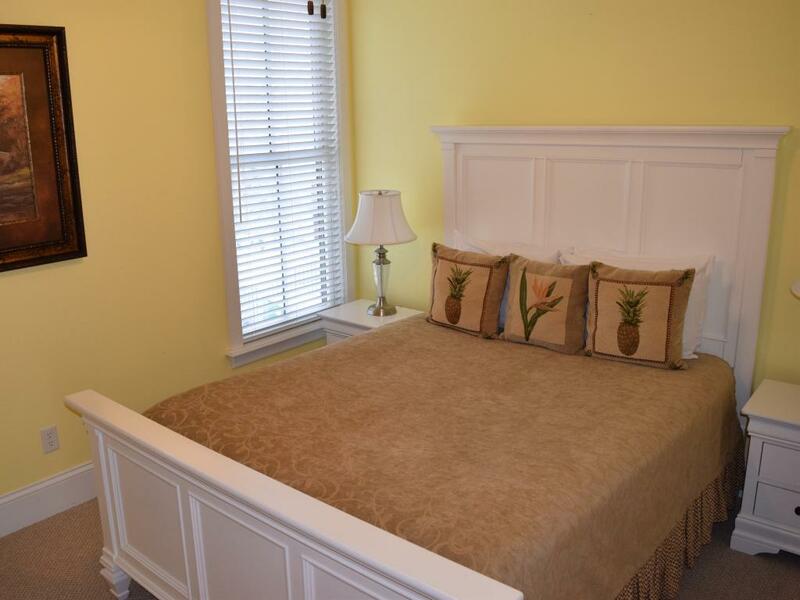 Maximum 4 adults, occupancy rate based on 2 adults (+$20/per extra guest). Children under 5 stay free. Complimentary WIFI and cable included! 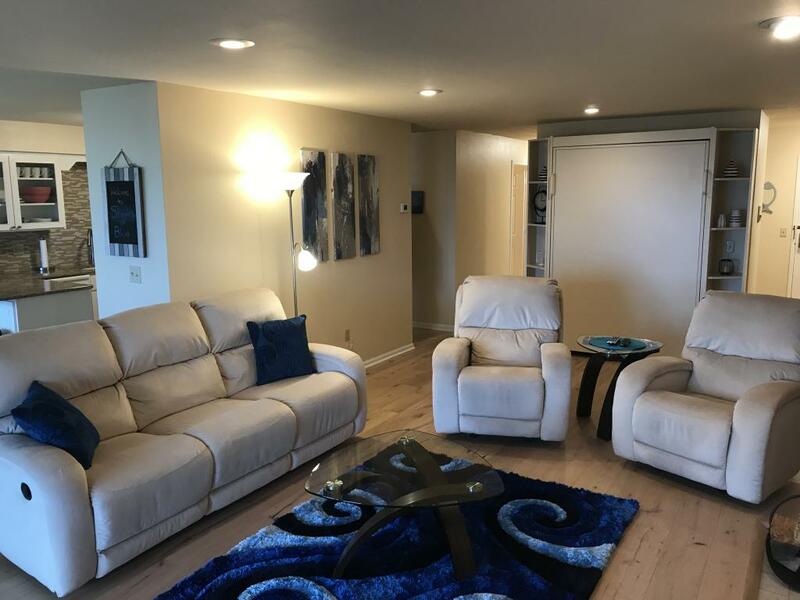 Very modern, very large, garden level (downstairs) suite with 1 bedroom (1 king bed), plus full sofa sleeper in the separate living room with TV. 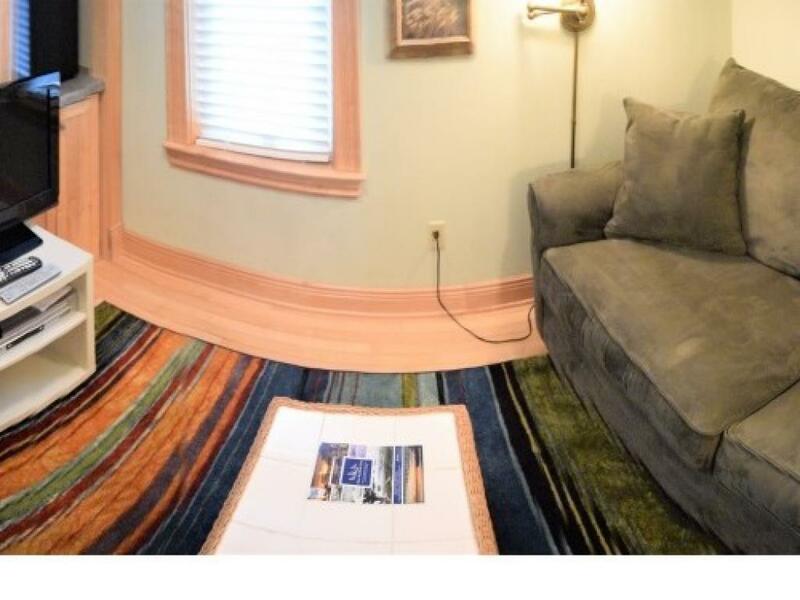 This unit requires stairs. Floor tile throughout suite. 1 full bathroom. 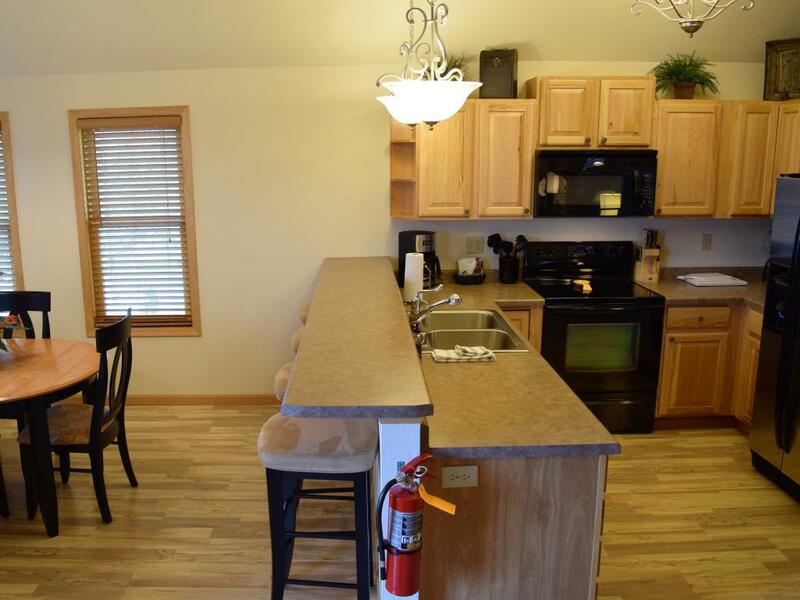 Full kitchen (fridge/freezer, microwave, sink, dishes, oven/stove top, coffee pot) with dining table set for 2-4 people. 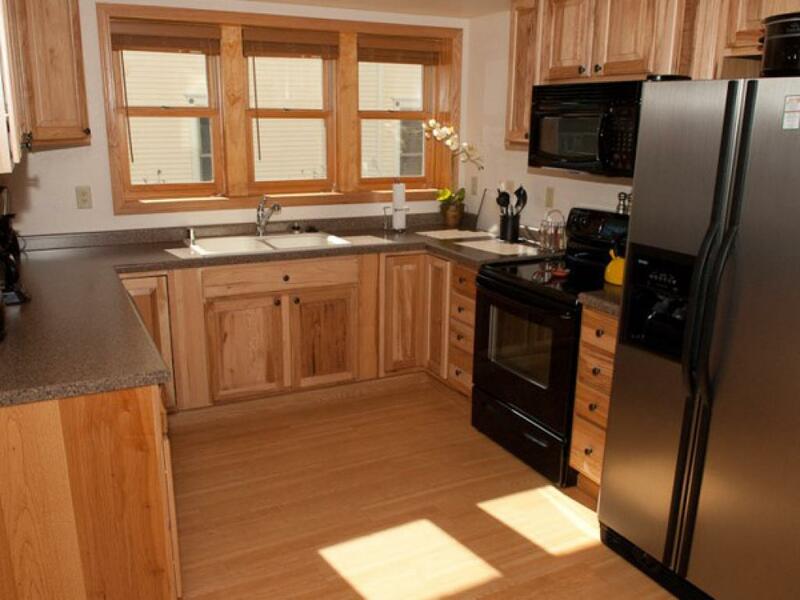 Well windows throughout unit for lots of natural light. No lake views. Patio area for guests near parking area. 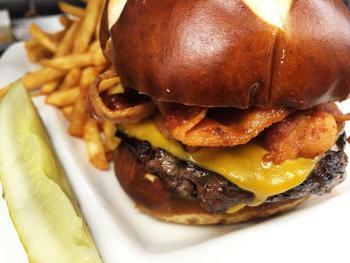 Located across the street from the main Inn. Private parking in back of building for 1 vehicle. No smoking, no pets. 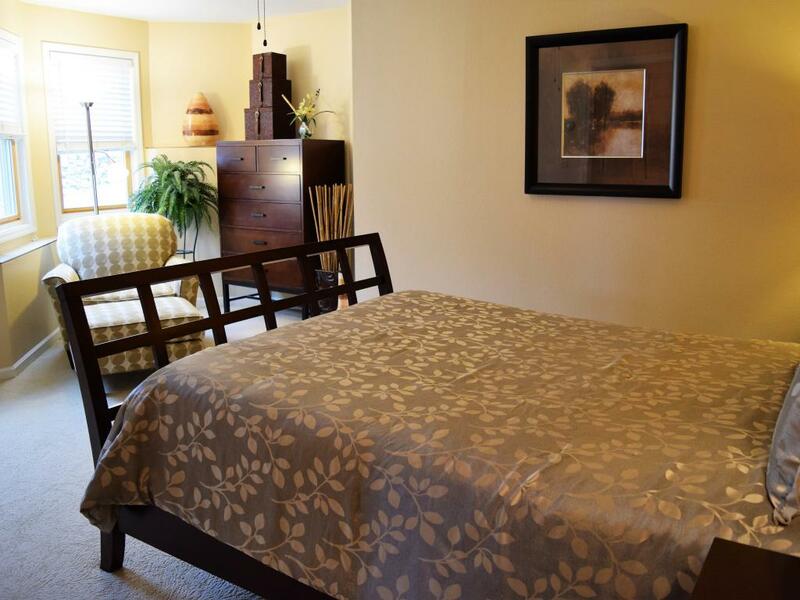 Maximum 4 adults, occupancy rate based on 2 adults (+$20/per extra guest). Children under 5 stay free. Complimentary WIFI and cable included! 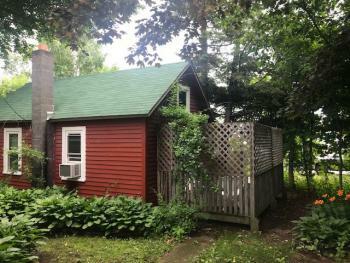 Hidden Cottage is a darling rustic cottage "hidden" in downtown Bayfield just 1/2 block from the main Bayfield Inn. 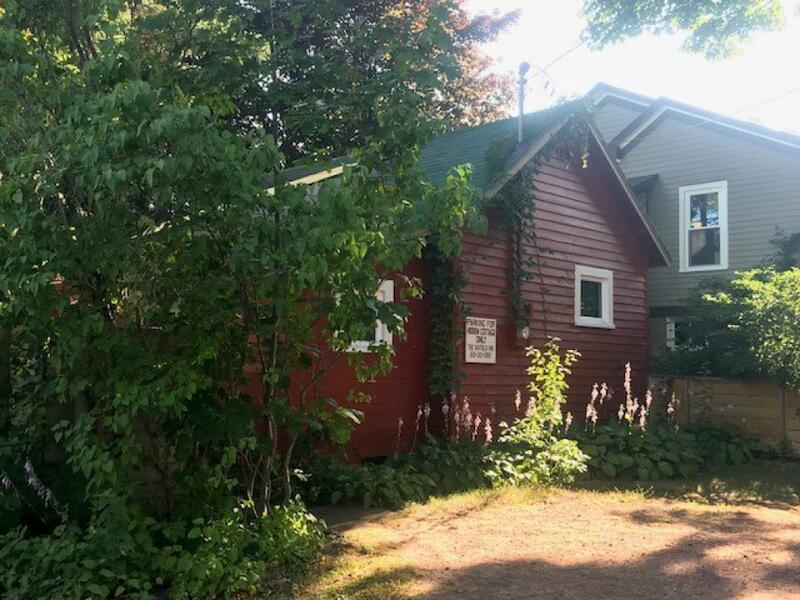 Enjoy complete privacy in your own pet-friendly cottage that is just steps from restaurants, shopping, galleries, Madeline Island Ferry Line, and Apostle Island Cruise service. 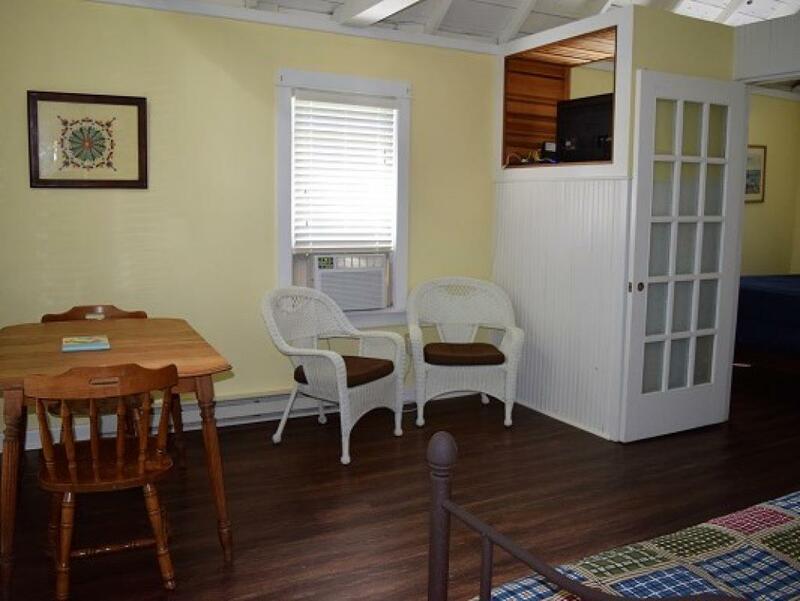 With tons of personality and charm, this unit has traditional furnishings and a vaulted ceiling with open beams. New flooring throughout. 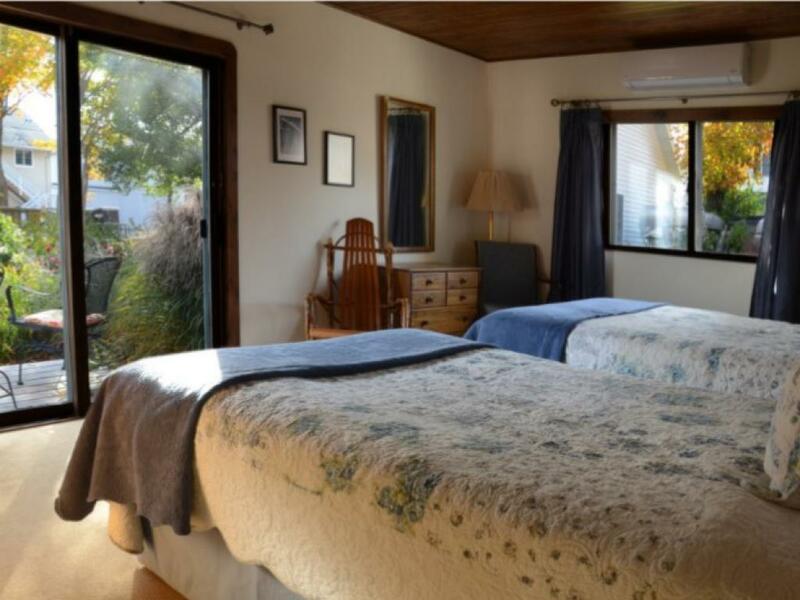 1 bedroom with a full bed, living room area with a 2-twin trundle bed. 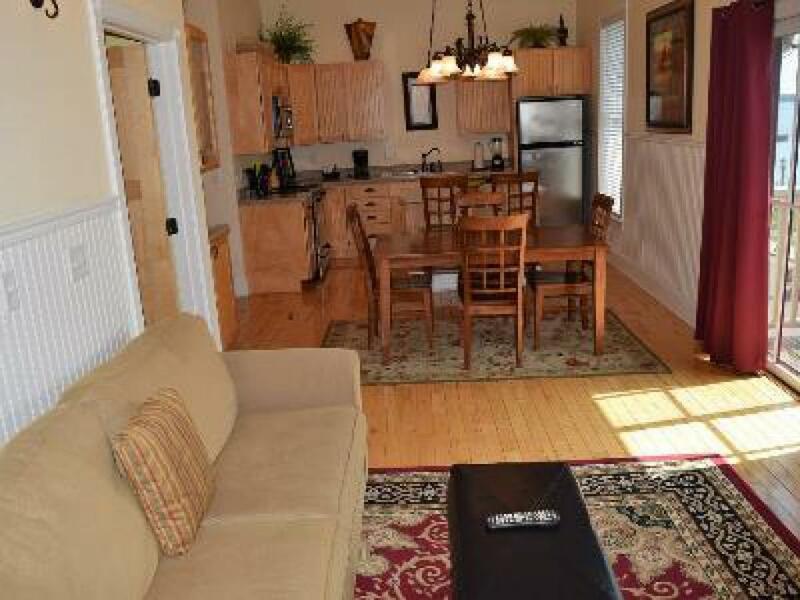 There is a full, small kitchen, 1.5 baths, flat screen TV in the bedroom, and private patio/deck. Pets are allowed with extra one-time, non-refundable fee of $25/pet! Occupancy rate is based on 2. 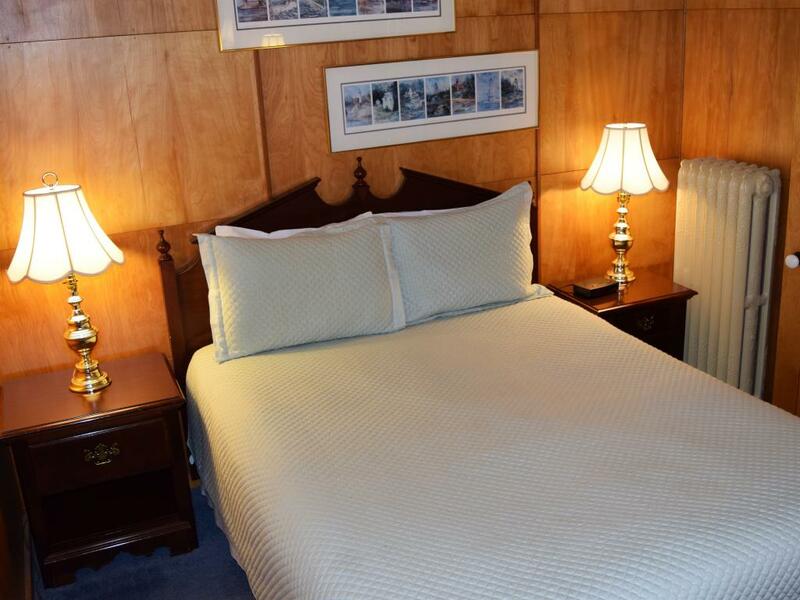 Maximum 4 adults (+$20/extra guest per night). Children under 5 stay free! Private parking for 1 vehicle. Complimentary WIFI and cable included! A few stairs required. 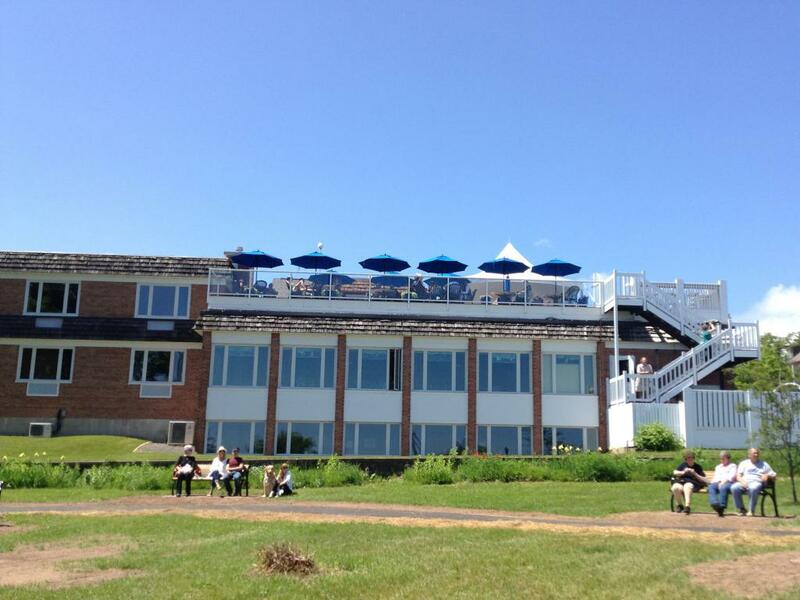 The Crow's Nest is located on the entire third floor of the historic Isaac Wing House. 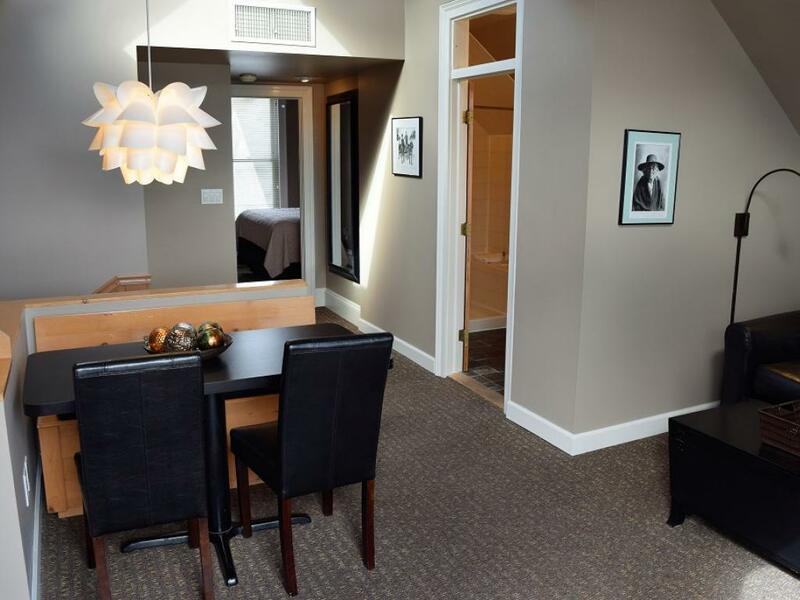 This unit features yesterday's charm with today's amenities. 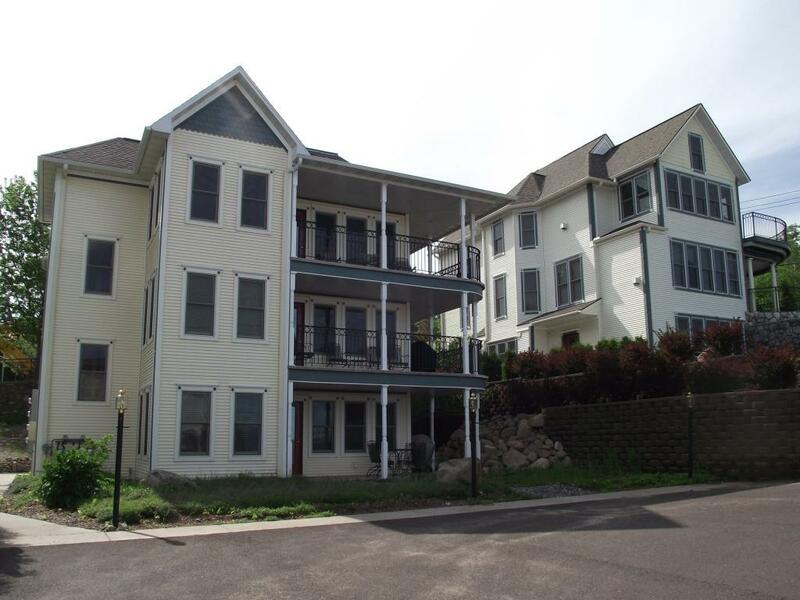 This apartment style unit has a private entrance and requires flights of stairs to the third floor (not suited for those with mobility issues). 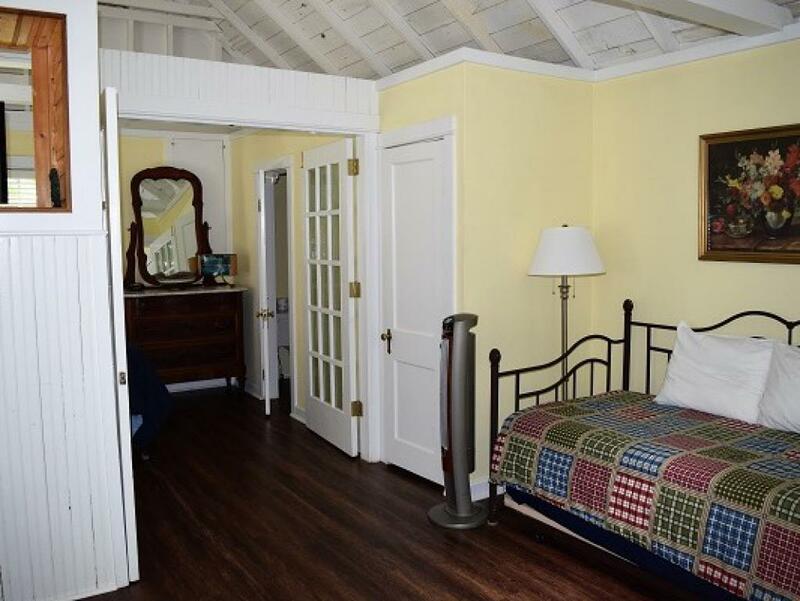 The Crow's Nest offers a sitting room with a queen bed at the back of the living area and an additional guest room with a queen bed. 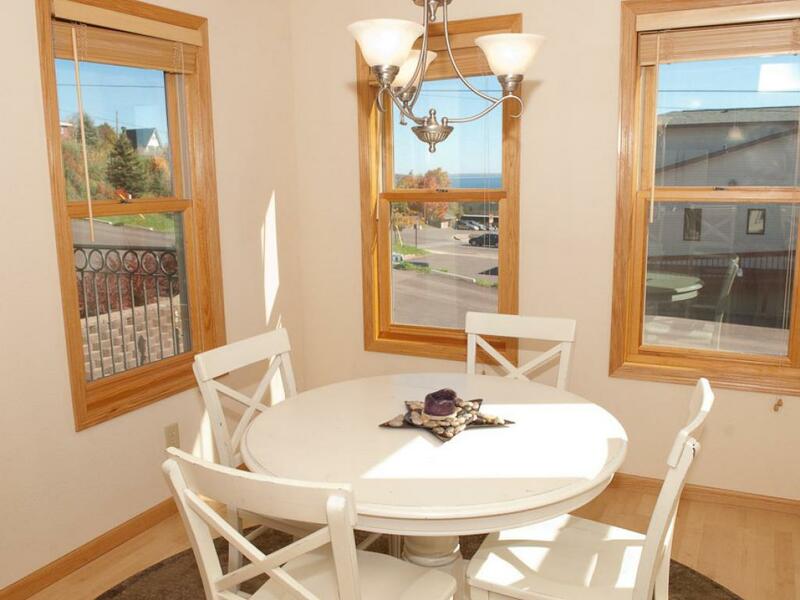 It has a full kitchen with a glance of Lake Superior and the harbor and one full bathroom. 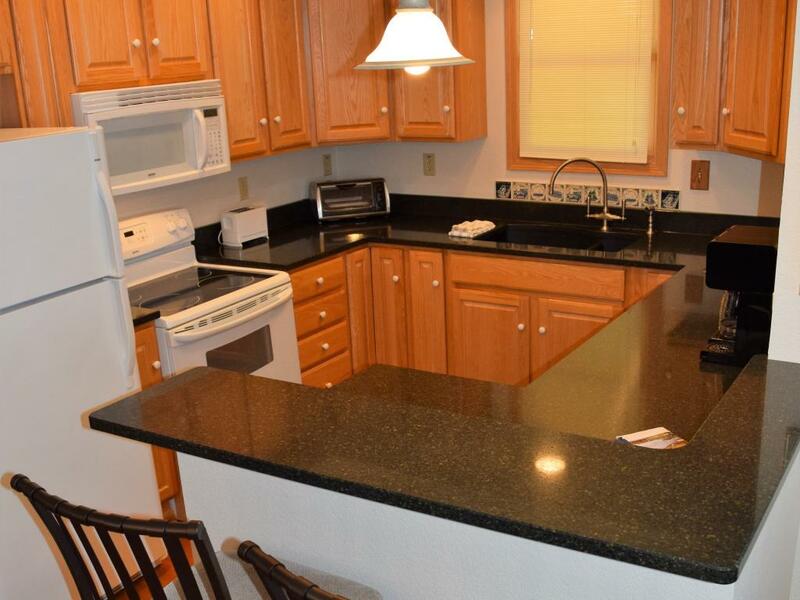 This unit offers a fully equipped kitchen! 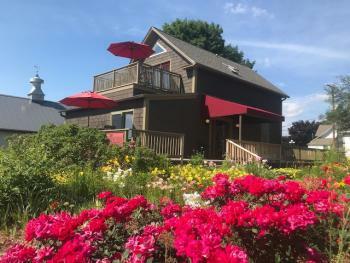 The Isaac Wing House is located across the street from The Bayfield Inn. Pets are allowed with extra one-time, non-refundable fee of $25/pet! Occupancy rate is based on 4. Maximum 4 adults. Private parking for 1 vehicle. Complimentary WIFI and cable included! No smoking. 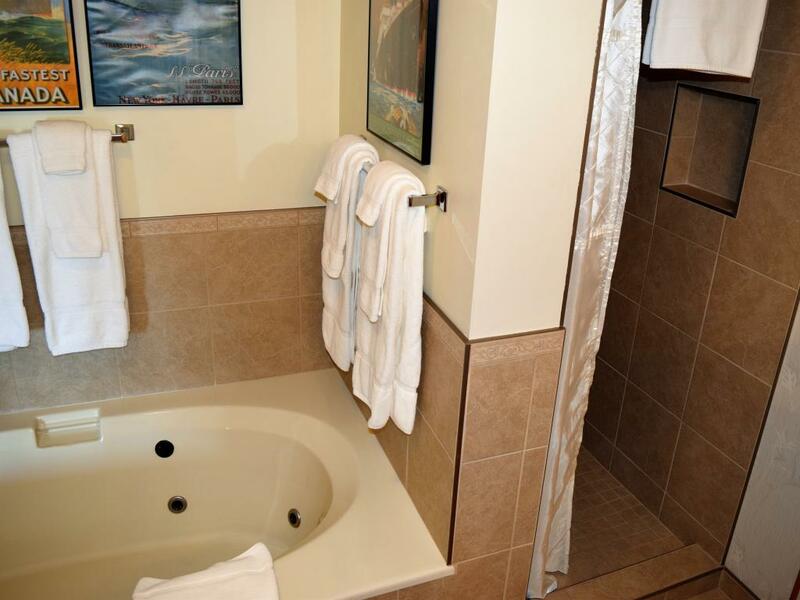 Garden-level Jacuzzi Suite (stairs required) with 2 queen beds. 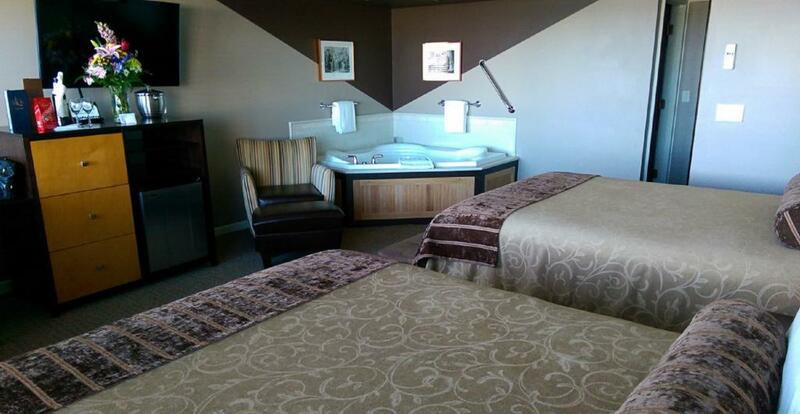 Spacious suite includes a great lake view and 2-person jacuzzi tub in-room. 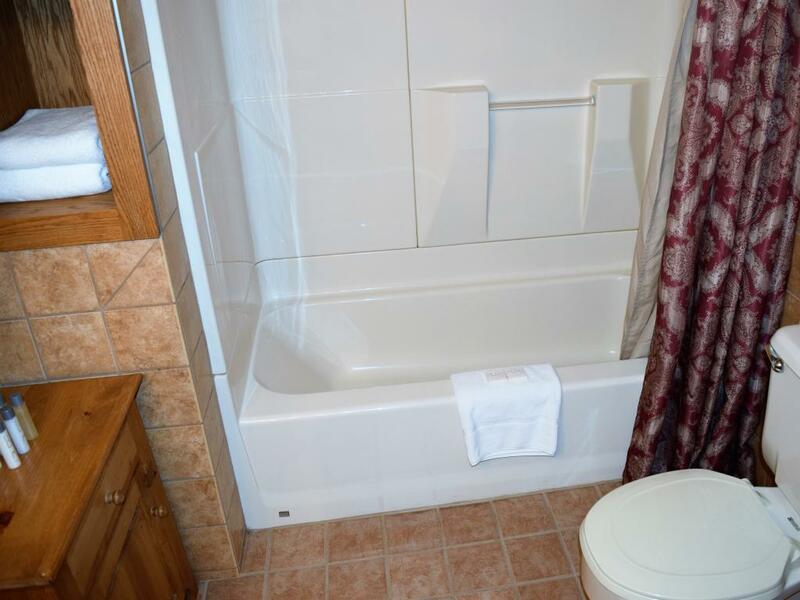 Separate bath with walk-in shower. 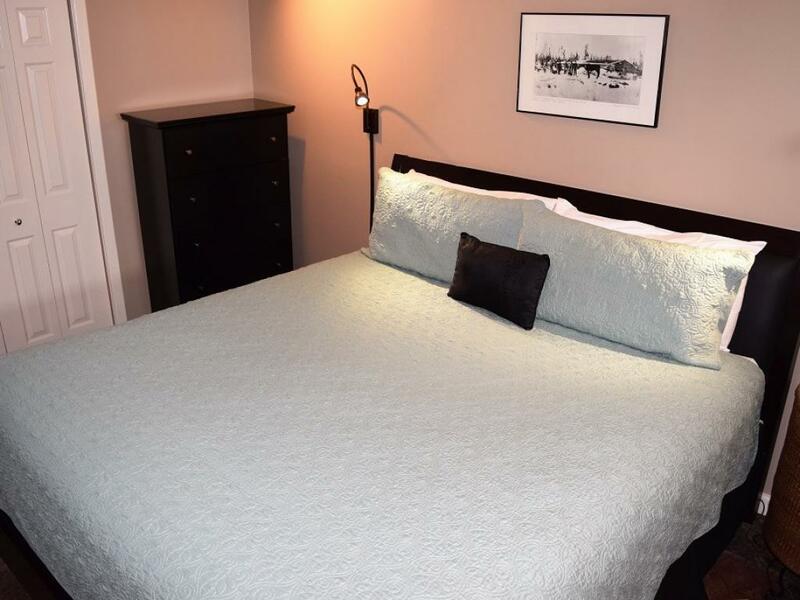 Newly renovated room includes new Serta DreamWeaver Beds. HDTV with HBO, coffee maker, & mini fridge. Complimentary WIFI. 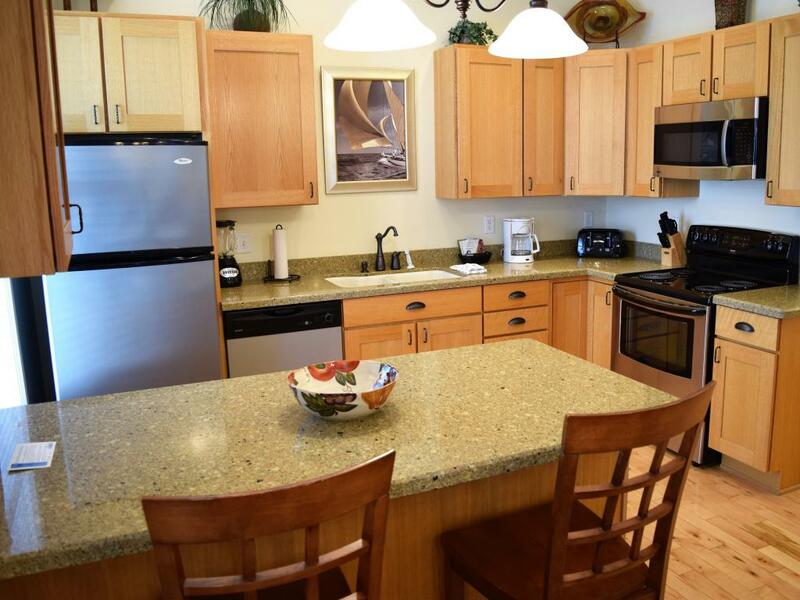 Maximum 4 adults, occupancy rate based on 2 adults (+$15/per extra guest). Children under 5 stay free. No smoking, no pets. Private parking. 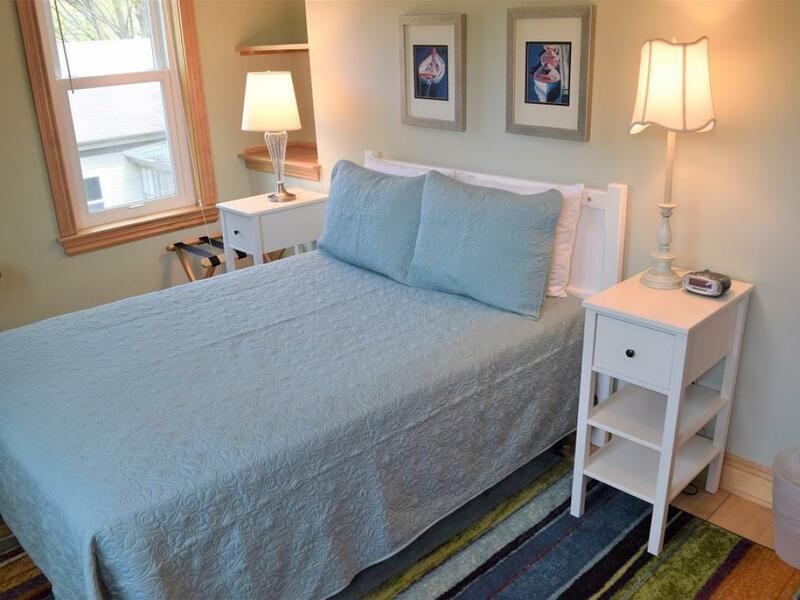 1st floor room (no stairs required) with 2 full beds & lakeview. 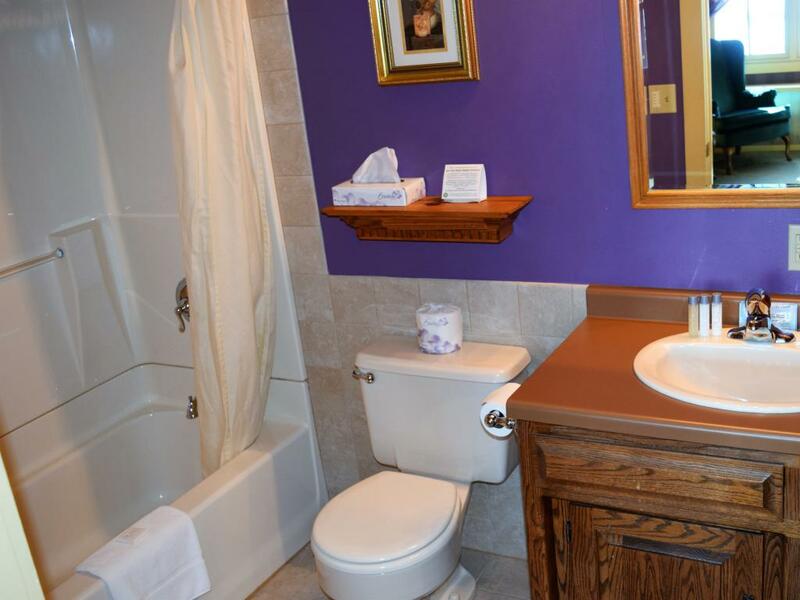 Grab bar in bathroom. Newly renovated room includes new Serta DreamWeaver Beds. 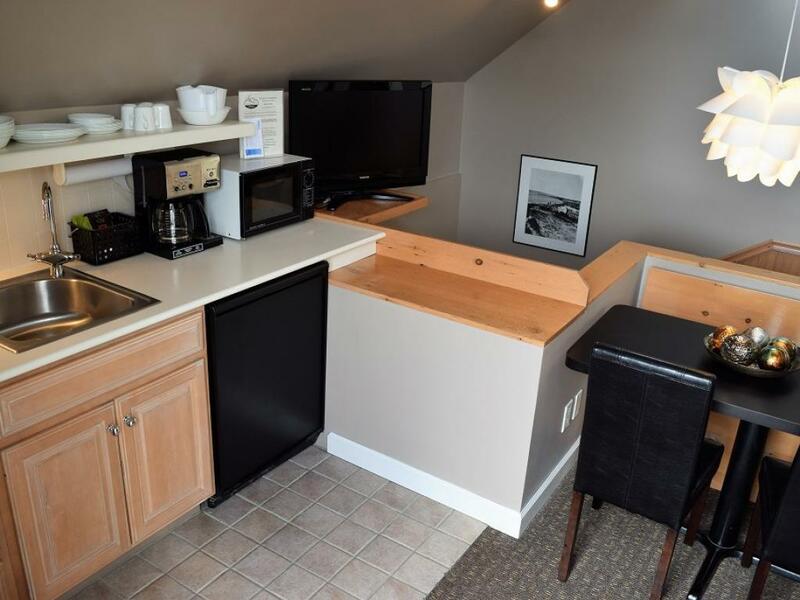 HDTV with HBO, coffee maker, & mini fridge, and complimentary WIFI. 1st room off of the lobby. Room nearest to vending & ice machine. 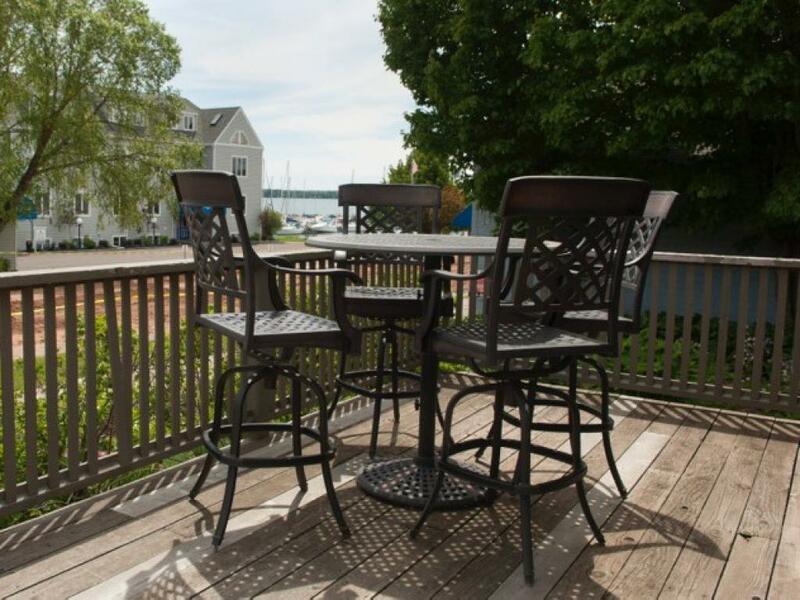 Maximum 4 adults, occupancy rate based on 2 adults (+$15/per extra guest). Children under 5 stay free. No smoking, no pets. Private parking. 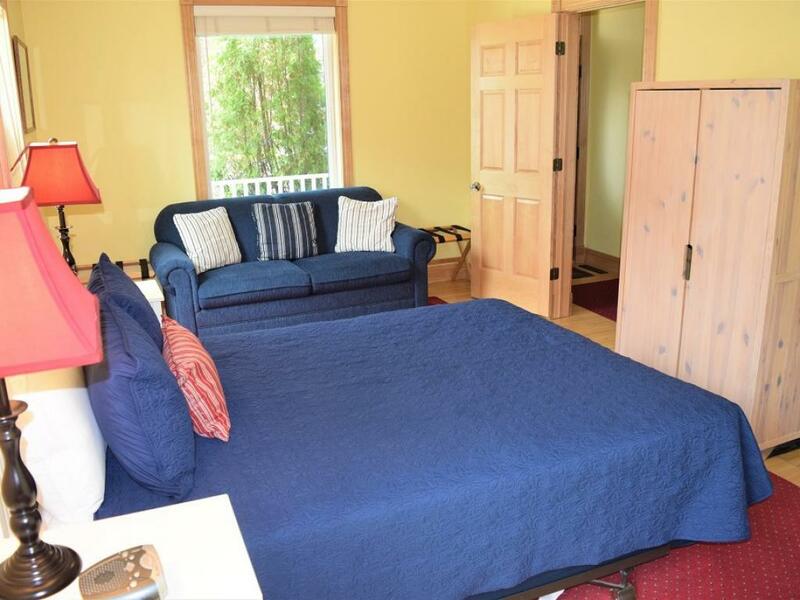 1st floor room with 2 full beds, lakeview. No stairs required. Newly renovated room includes new Serta DreamWeaver Beds. 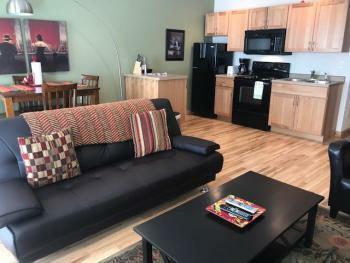 HDTV with HBO, coffee maker, & mini fridge, and complimentary WIFI. 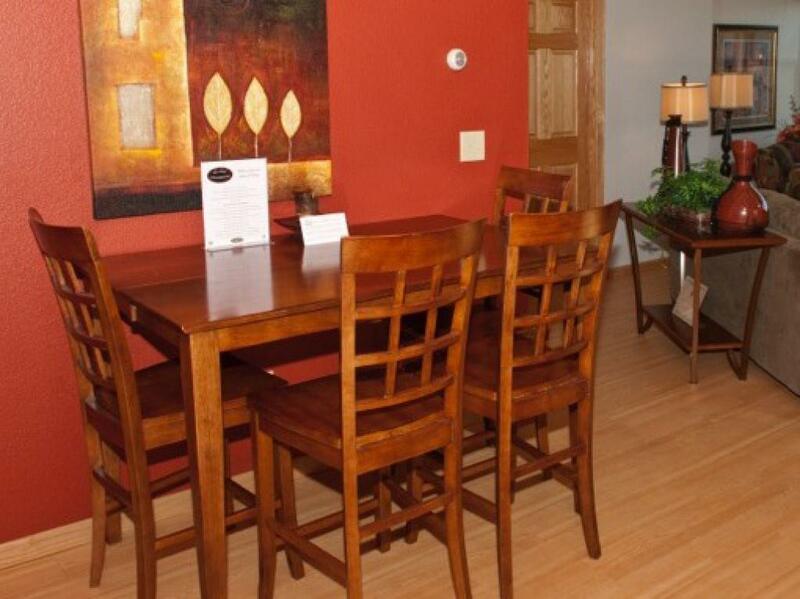 Maximum 4 adults, occupancy rate based on 2 adults (+$15/per extra guest). Children under 5 stay free. No smoking, no pets. Private parking. 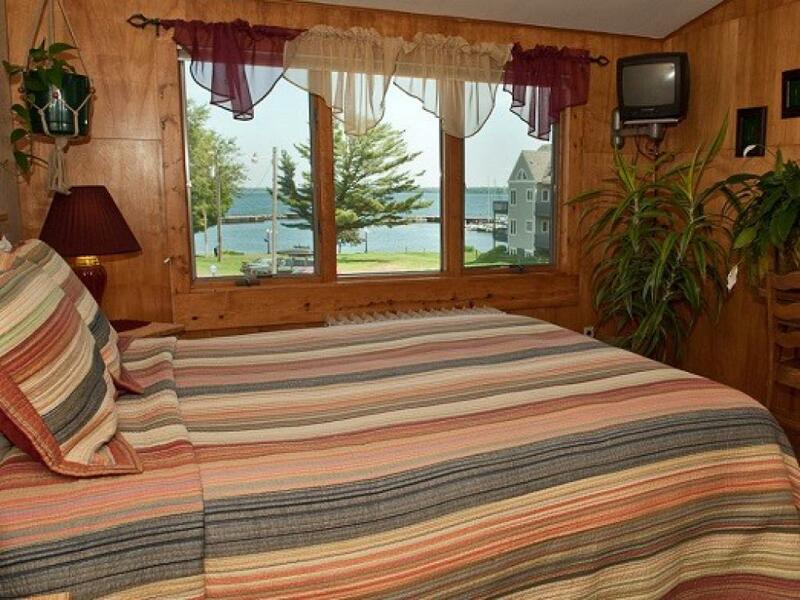 1st floor room with 2 full beds & lakeview. No stairs required. Newly renovated room includes new Serta DreamWeaver Beds. HDTV with HBO, coffee maker, & mini fridge. Complimentary WIFI. 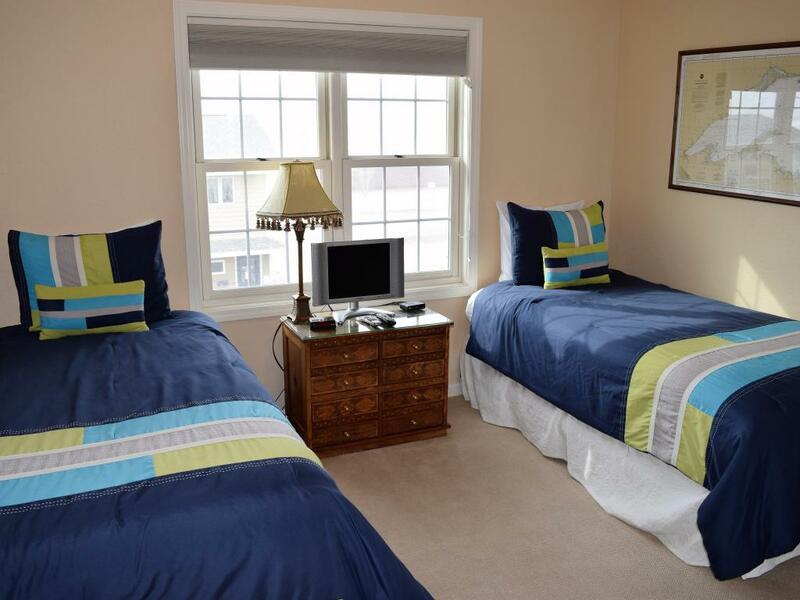 Maximum 4 adults, occupancy rate based on 2 adults (+$15/per extra guest). Children under 5 stay free. No smoking, no pets. Private parking. 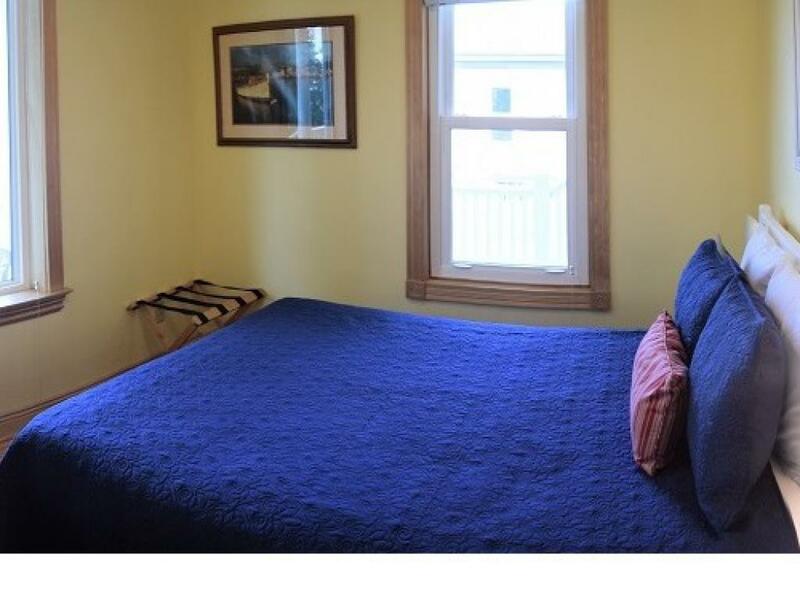 2nd floor room (stairs required) with 2 full beds, lakeview. 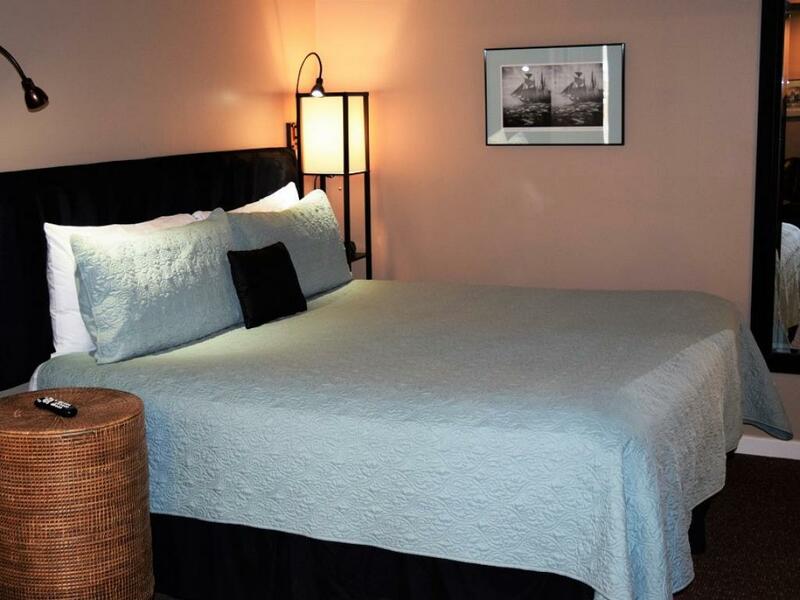 Newly renovated room includes new Serta DreamWeaver Beds. HDTV with HBO, coffee maker, & mini fridge. Complimentary WIFI. 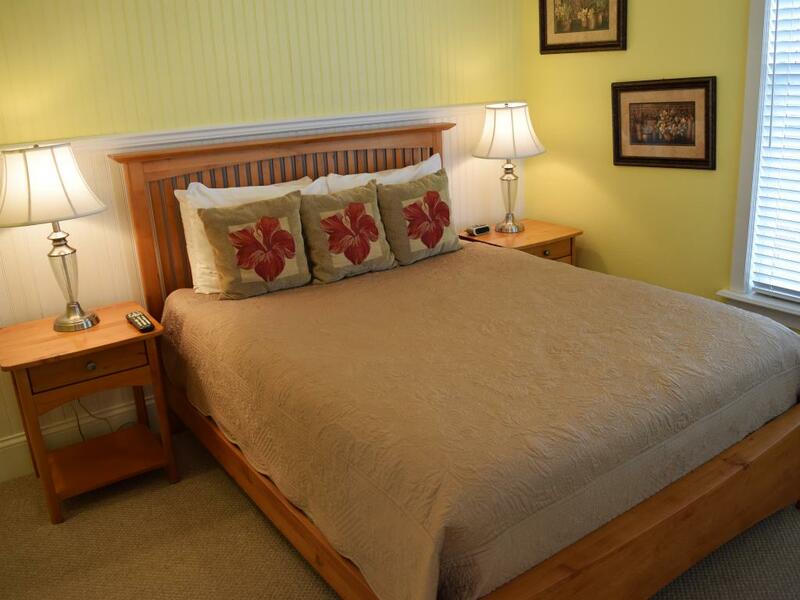 Maximum 4 adults, occupancy rate based on 2 adults (+$15/per extra guest). Children under 5 stay free. No smoking, no pets. Private parking. 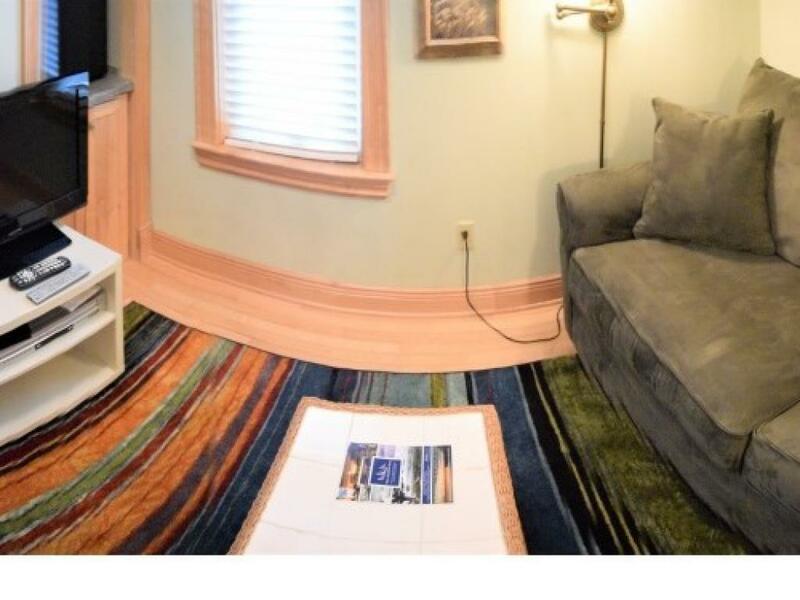 2nd floor room (stairs required) with 2 full beds, lakeview. Quiet room at the end of the hallway near south entrance to the hotel. 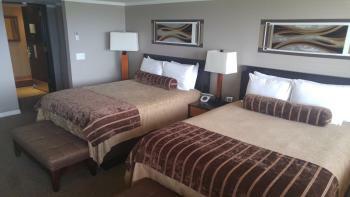 Newly renovated room includes new Serta DreamWeaver Beds. HDTV with HBO, coffee maker, & mini fridge. Complimentary WIFI. Maximum 4 adults, occupancy rate based on 2 adults (+$15/per extra guest). Children under 5 stay free. No smoking, no pets. Private parking. The modern Brownstone Suite is just 1/2 block from The Bayfield Inn. 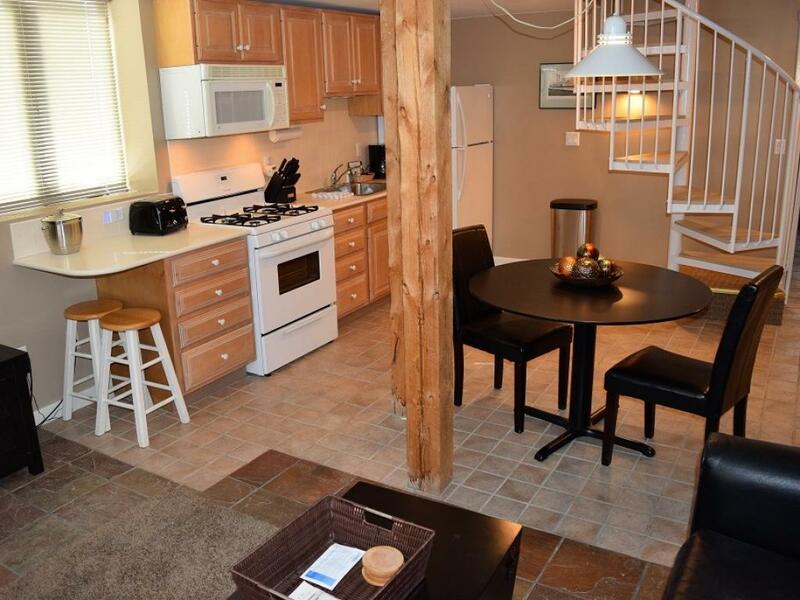 It has an excellent central downtown location with private parking for 1 vehicle. 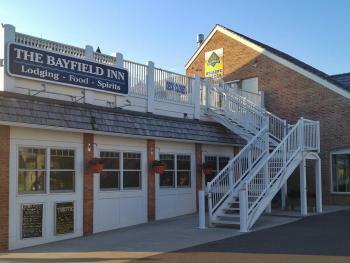 It is close to many of Bayfield's restaurants, attractions, shopping, recreation, and nightlife (Potential for Noise). After a busy day and night on the town, get cozy in the queen-sized bed. 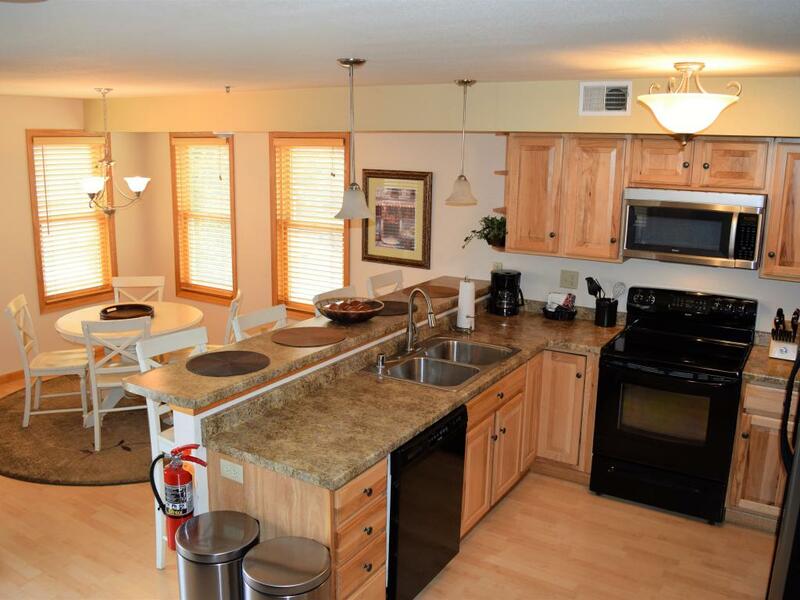 This unit has a full bath, living room with TV, and a small bistro table next to the compact full kitchen. Stairs are required for this unit. 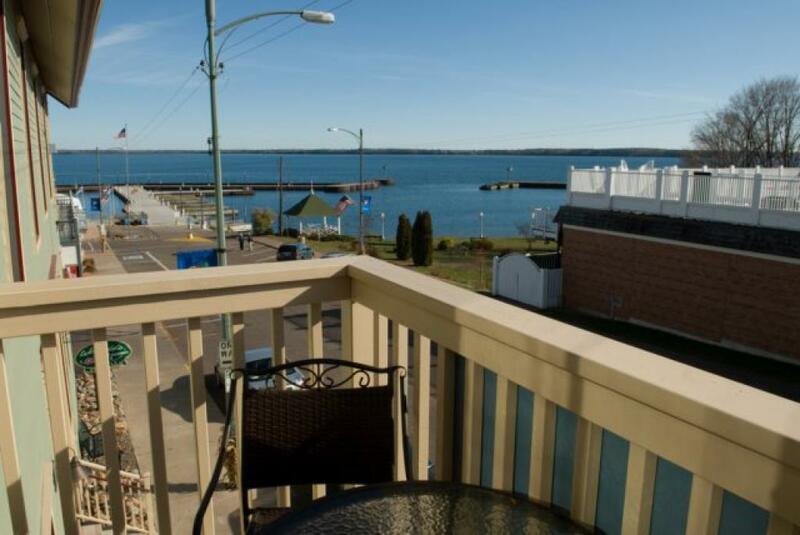 Brownstone Suite offers partial Lake Superior views from the living room, but is just a short distance to Bayfield's city harbor and several parks. Occupancy rate is based on 2 people. Maximum is 2 adults (leather couch in living can be converted into futon sleeping for 1 child). No smoking, no pets. Complimentary WIFI and cable included! Private parking for 1 vehicle. 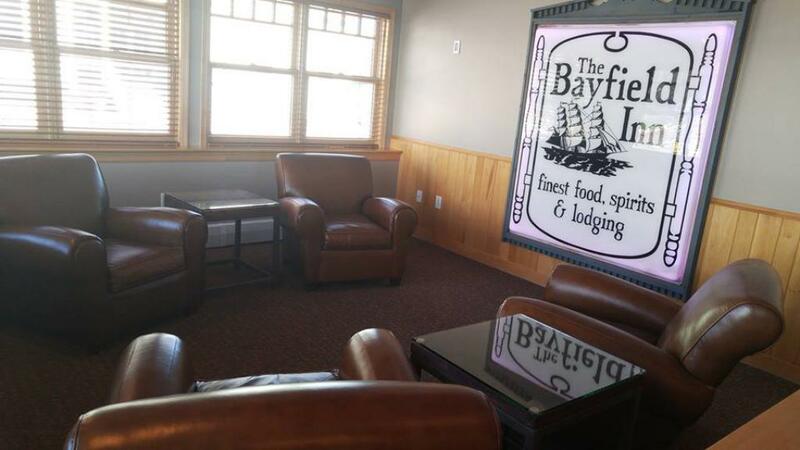 The Bayfield Inn's exclusive downtown location is central to restaurants, shops and attractions and within walking distance of the Apostle Islands Cruise Service and the Madeline Island Ferry Line. 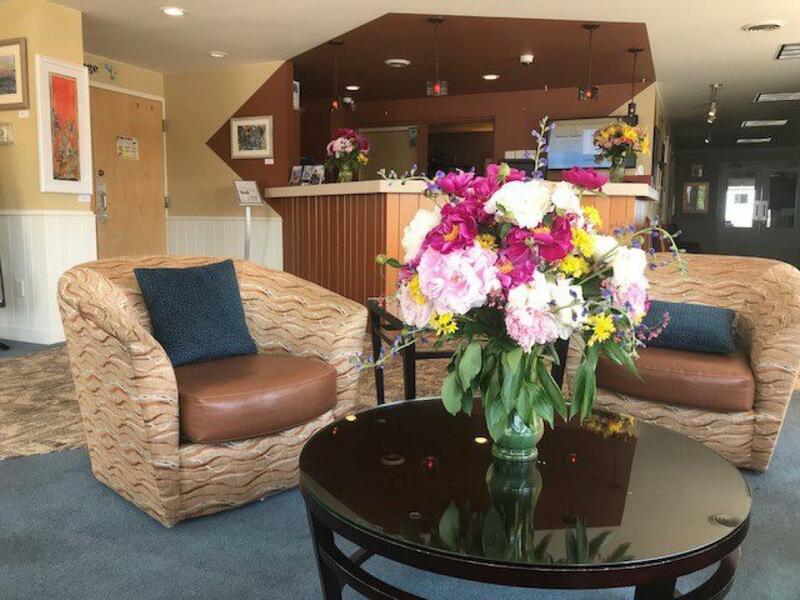 With 21 boutique-style hotel rooms onsite and over 25 centrally located vacation rental options (including condominiums, suites, apartments, & homes), we can find the perfect fit for any traveler, any season. The Bayfield Inn is newly renovated reflecting yesterday's charm with today's amenities. 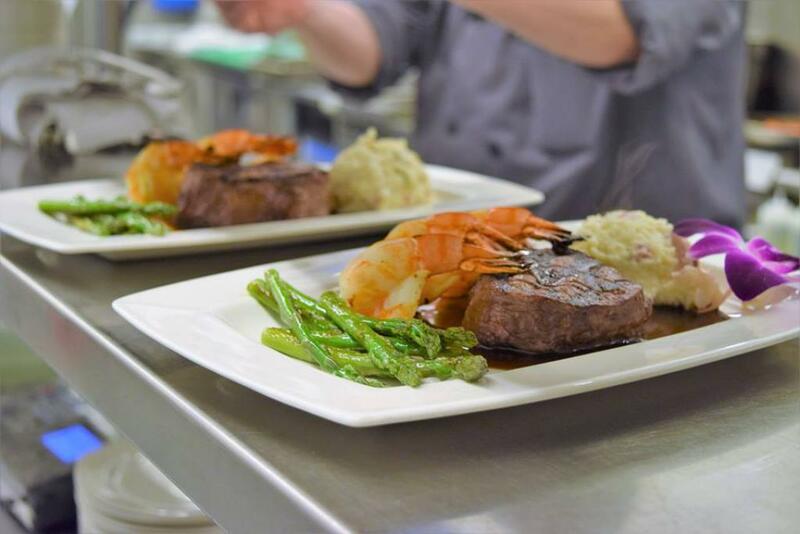 Famished travelers and locals alike enjoy our onsite full-service restaurant, the Lakeside Dining Room which serves Breakfast, Lunch, & Dinner. We also offer The Lounge, our onsite cocktail lounge serving domestic & craft beers, a fine selection of wines, and craft cocktails with premium spirits. 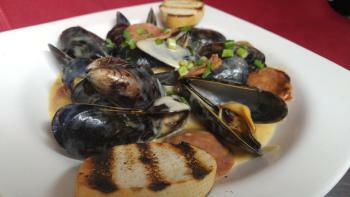 The Lounge also serves a lighter/pub fare menu nightly. The Deck is our seasonal onsite rooftop open air bar that serves lunch daily (weather permitting) and offers live music Memorial Day through Labor Day.